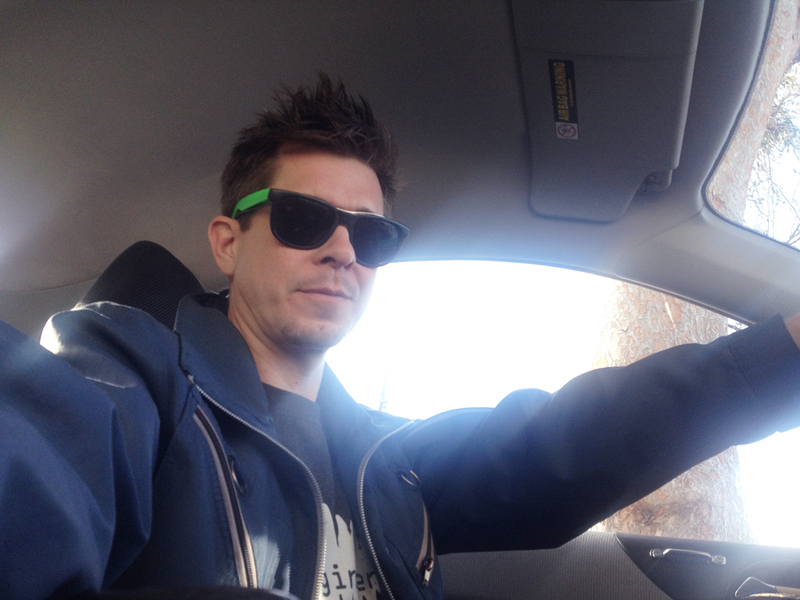 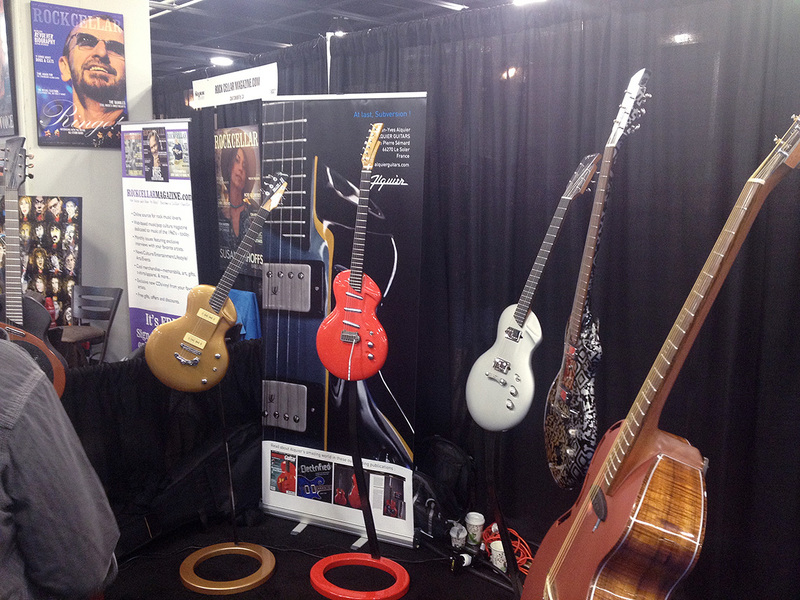 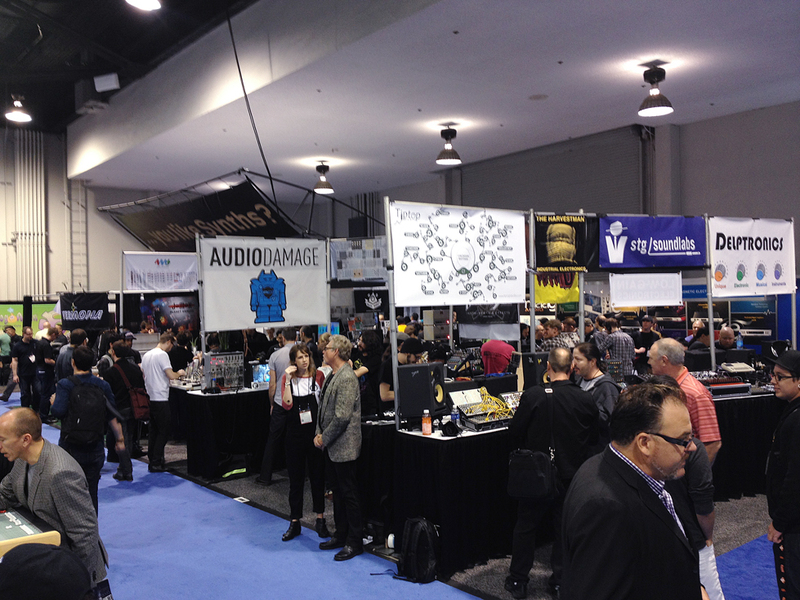 NAMM 2014 is upon us. 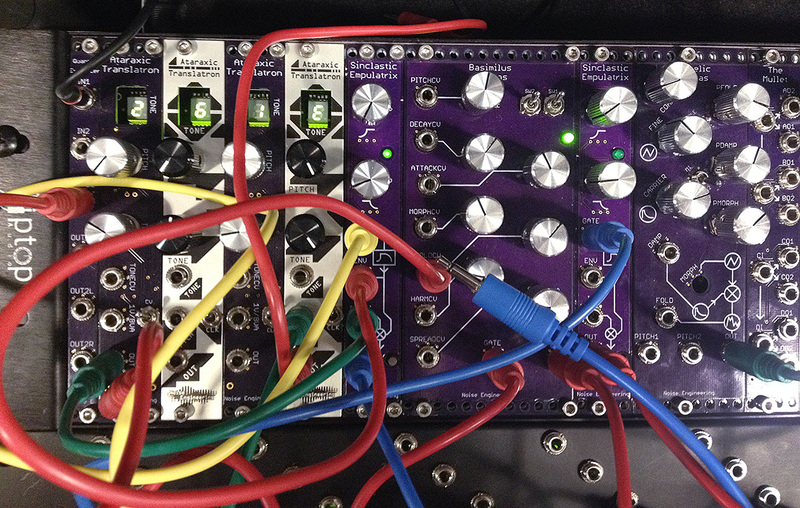 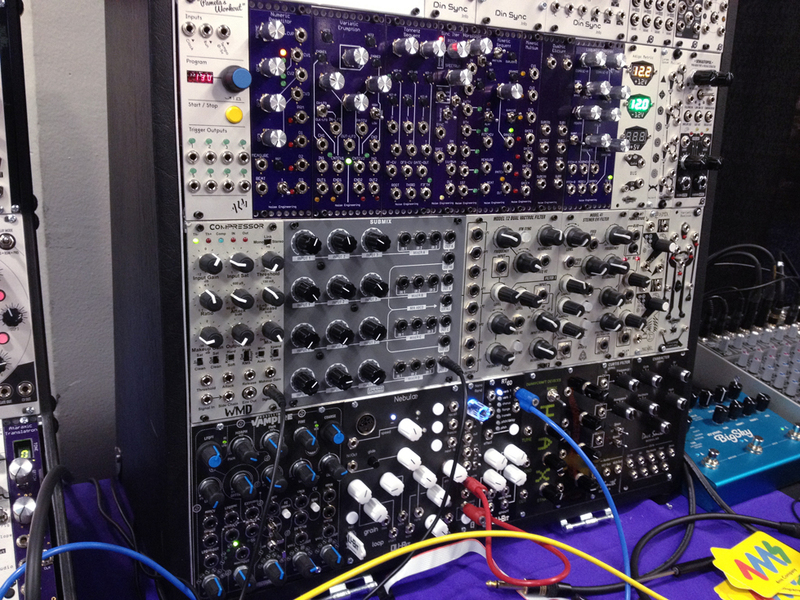 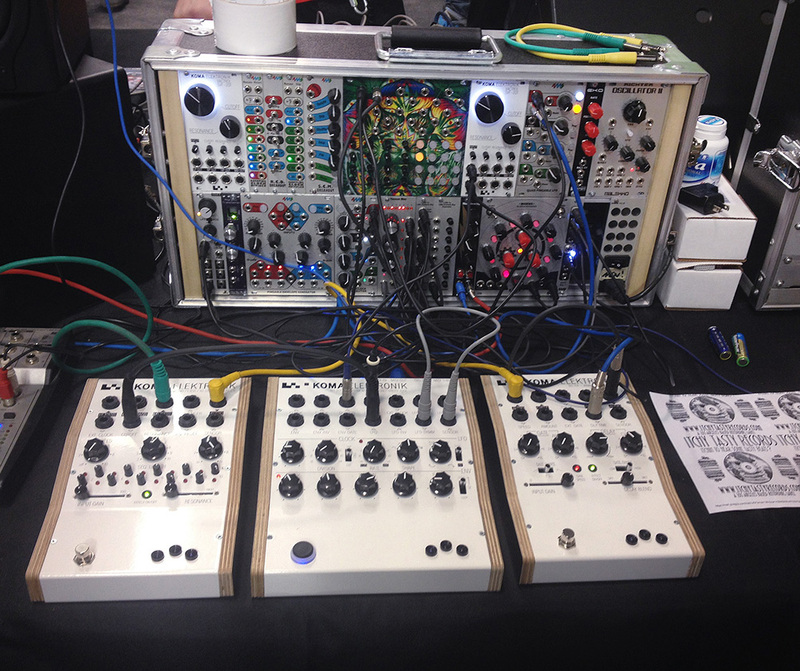 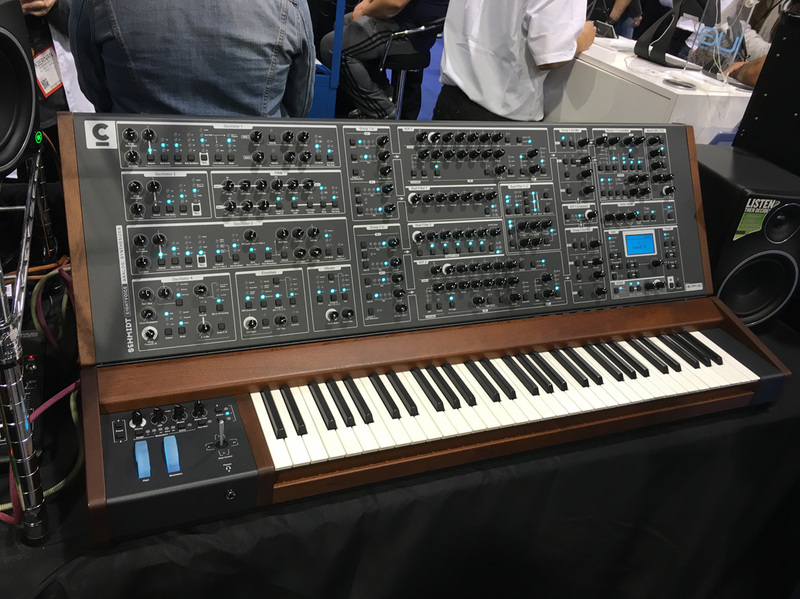 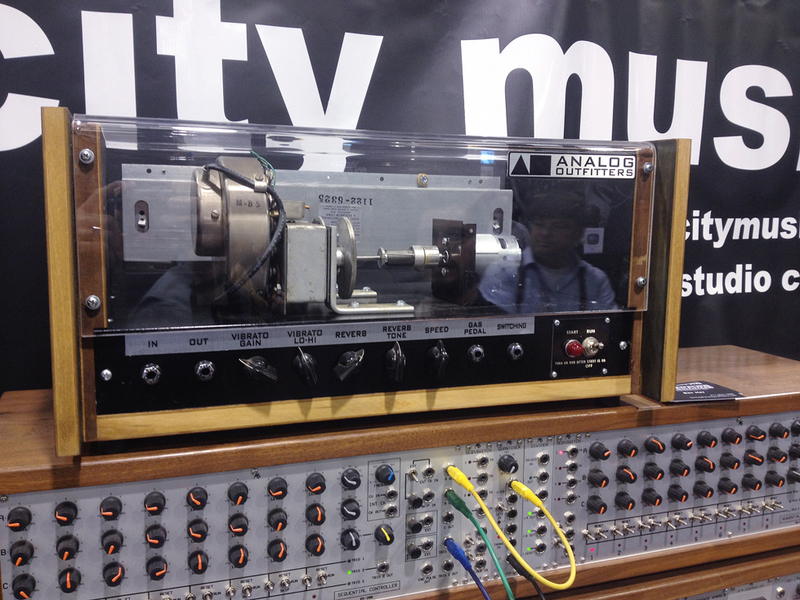 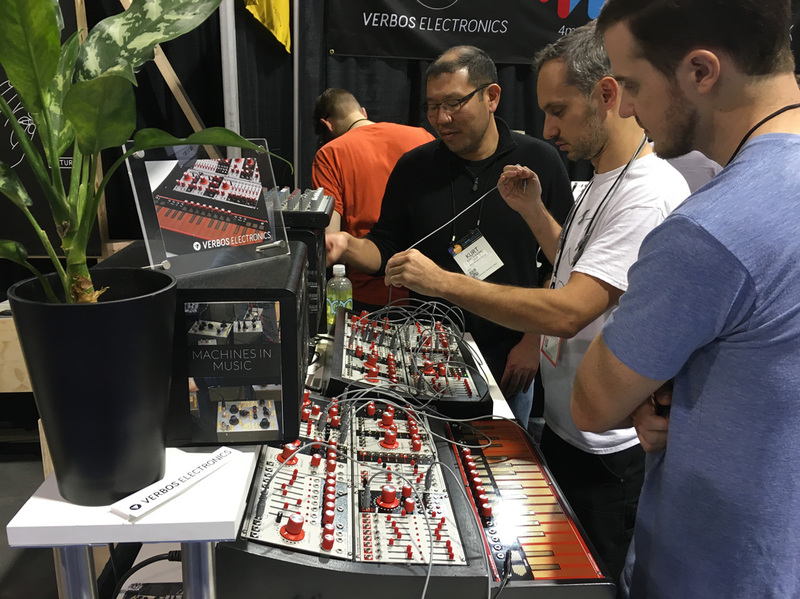 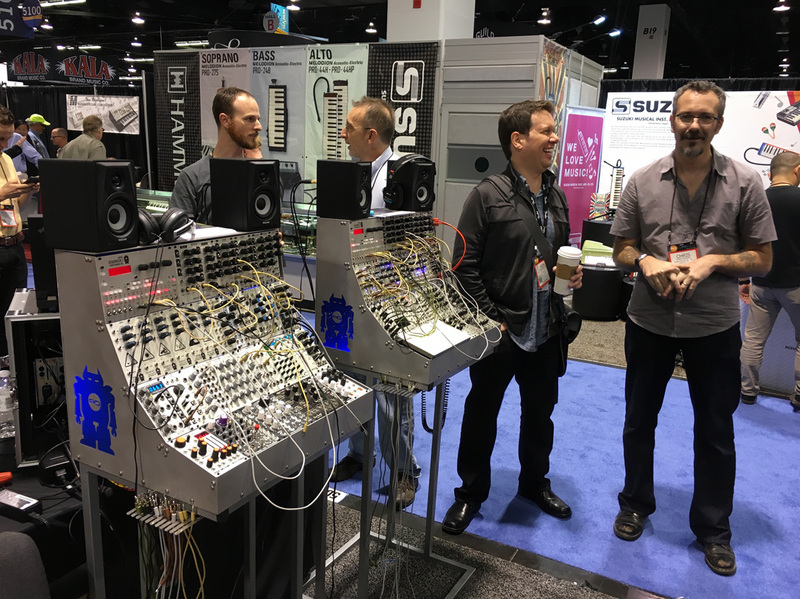 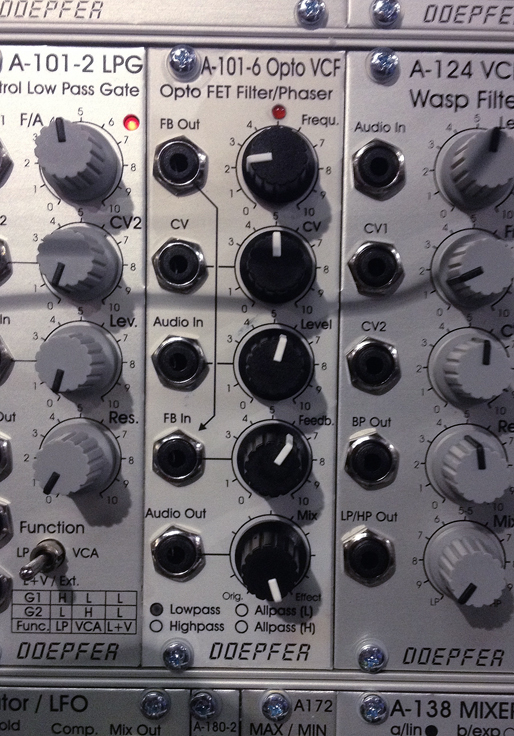 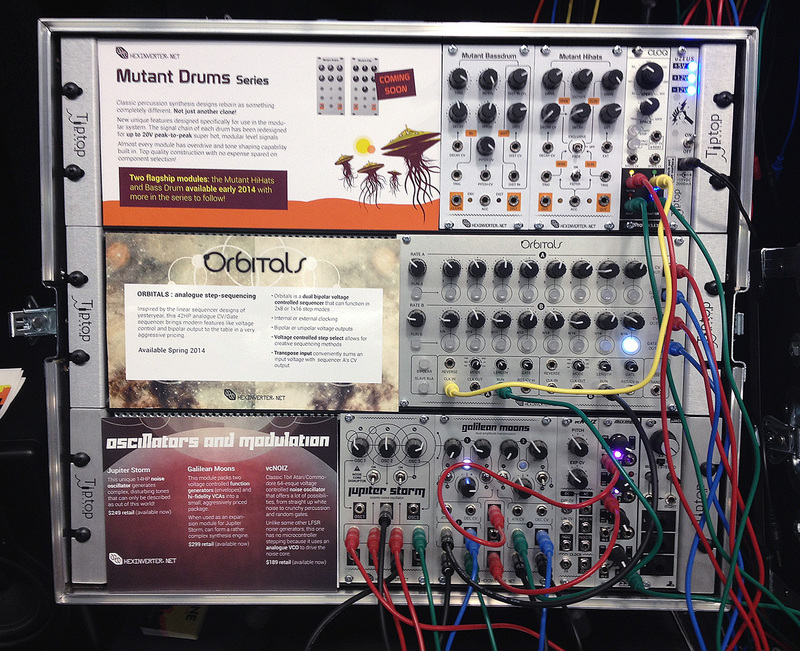 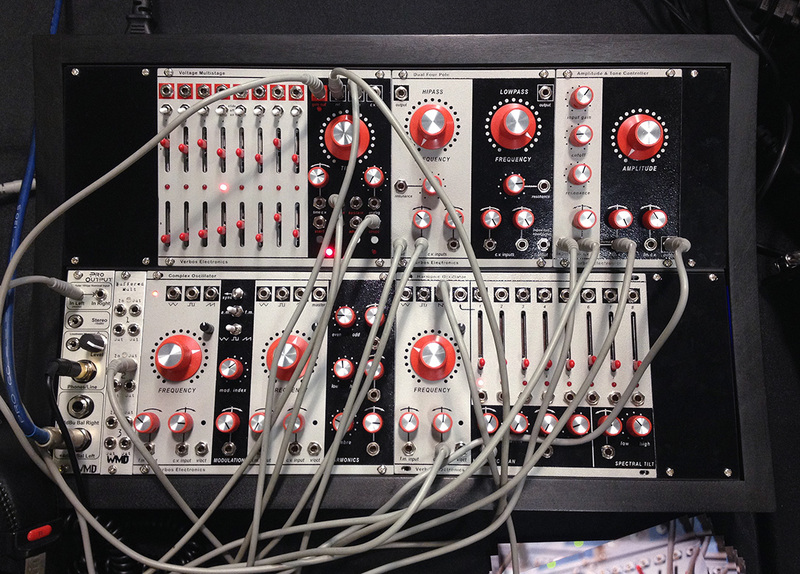 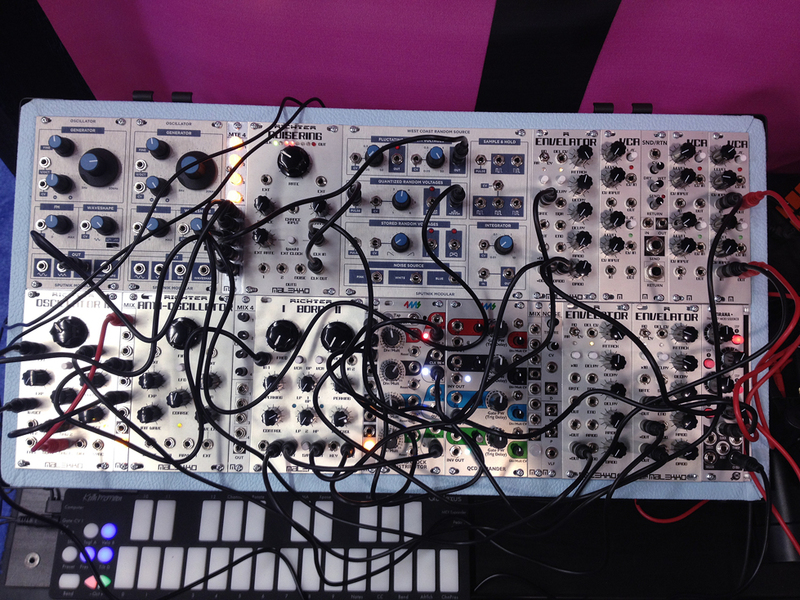 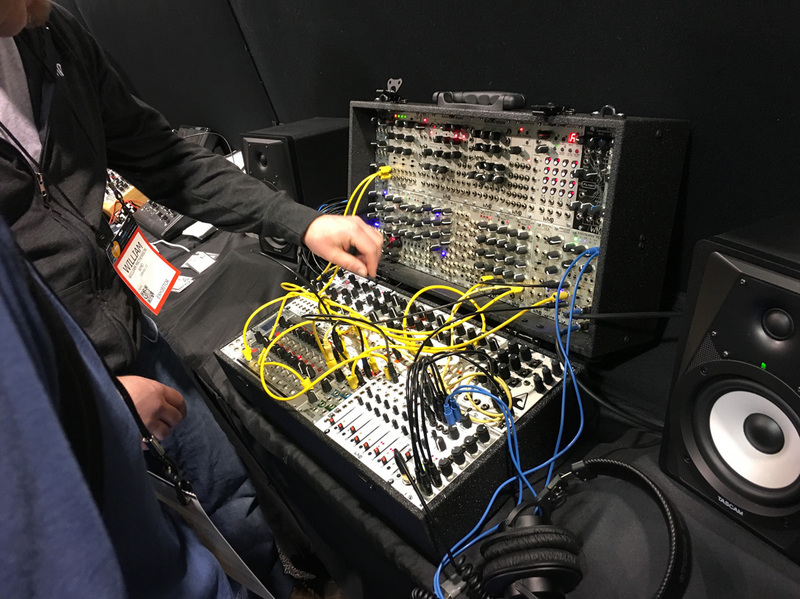 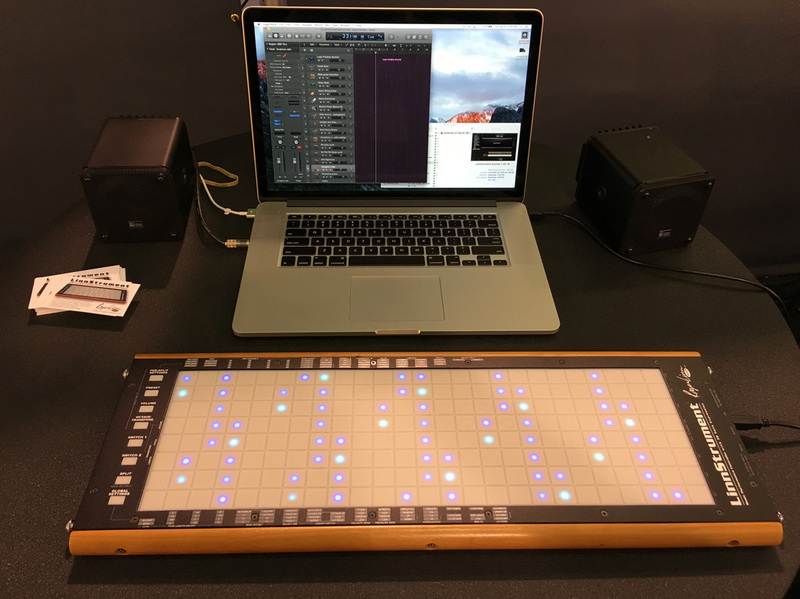 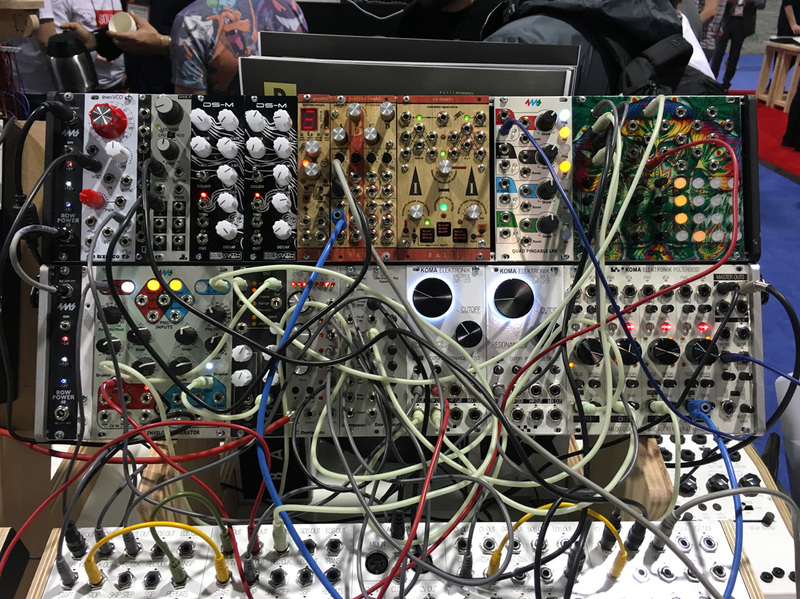 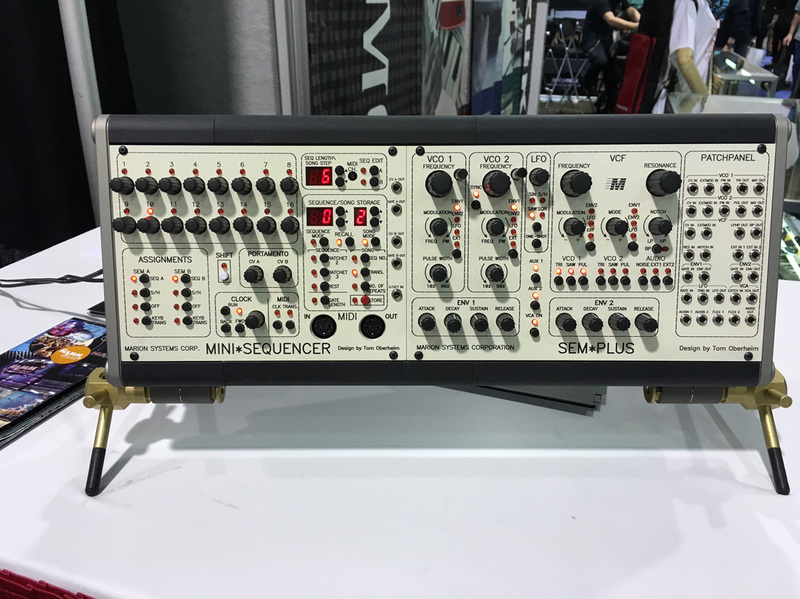 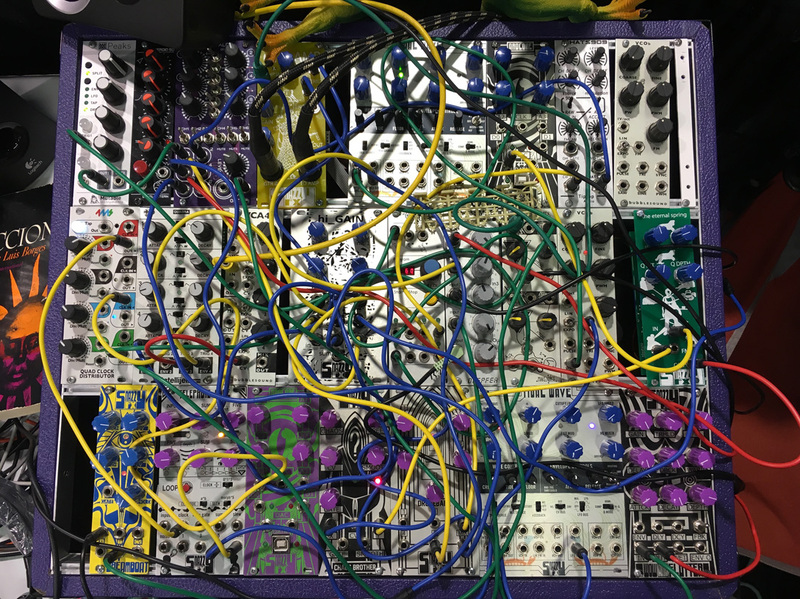 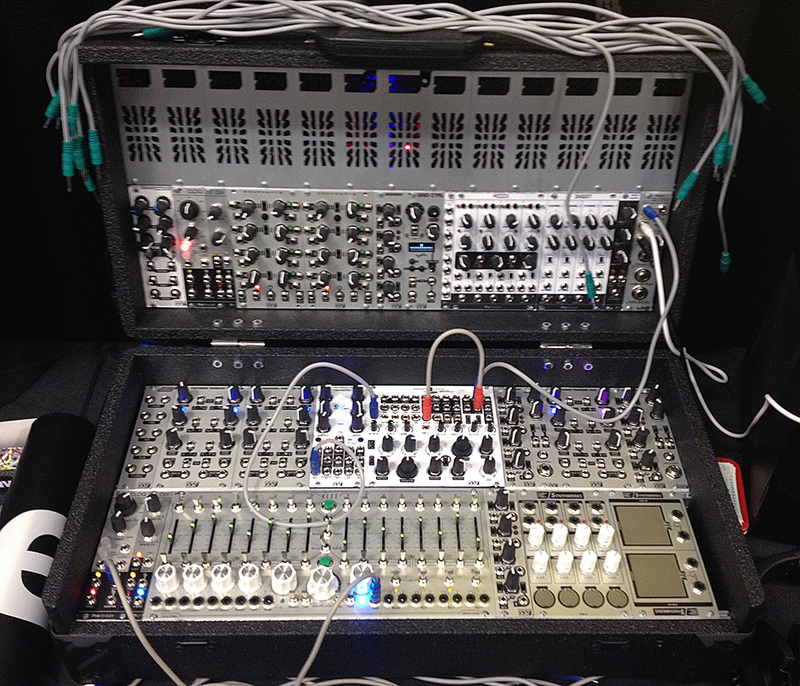 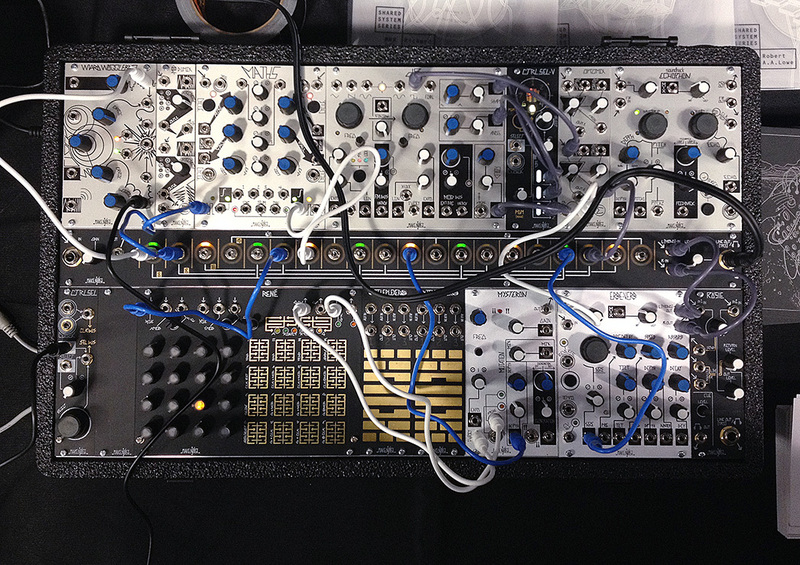 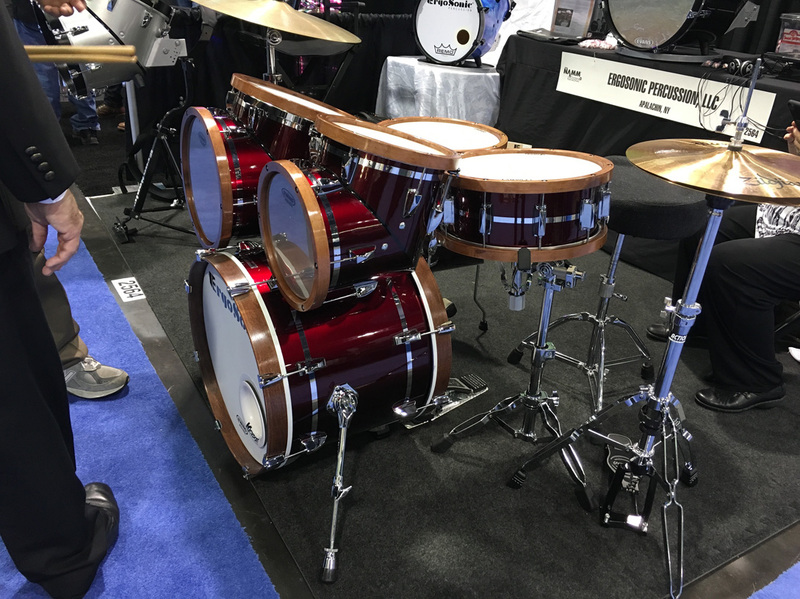 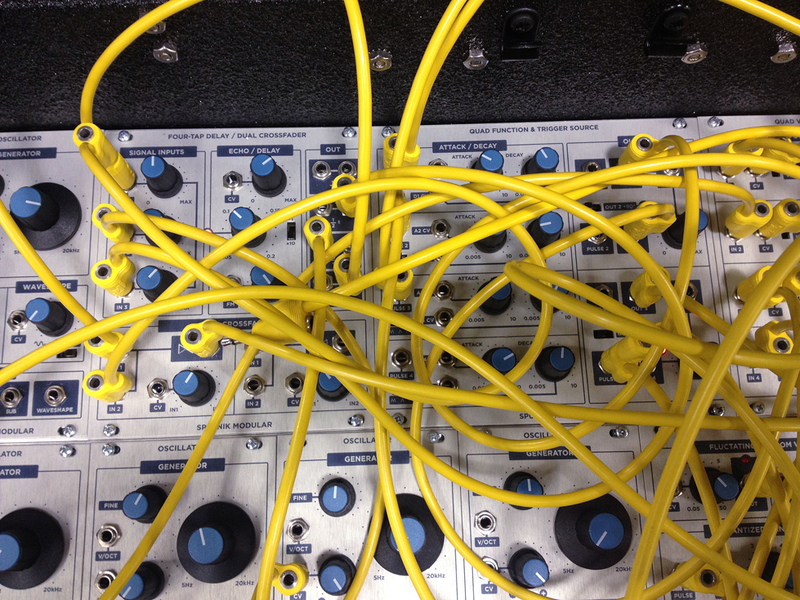 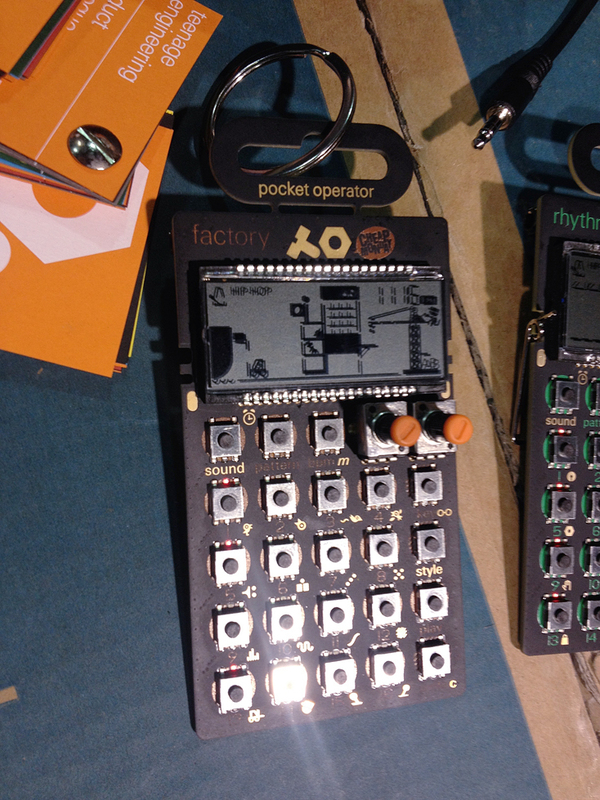 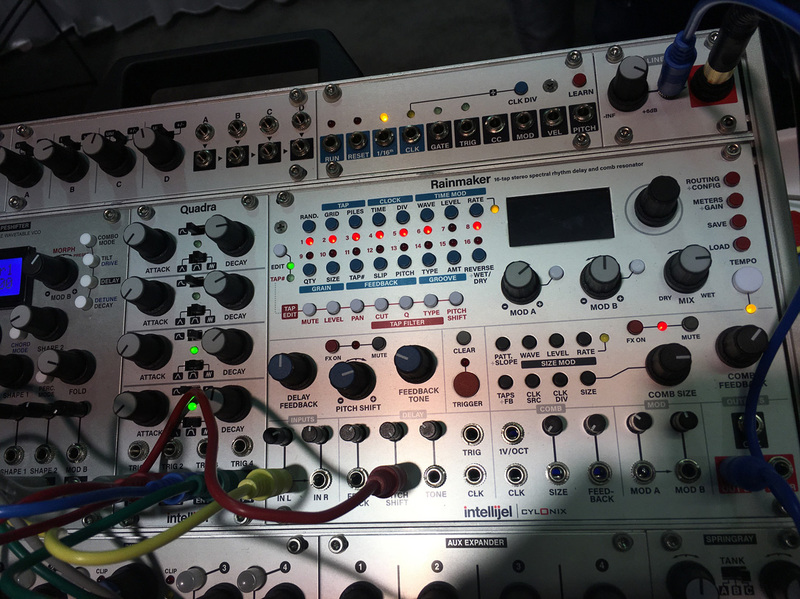 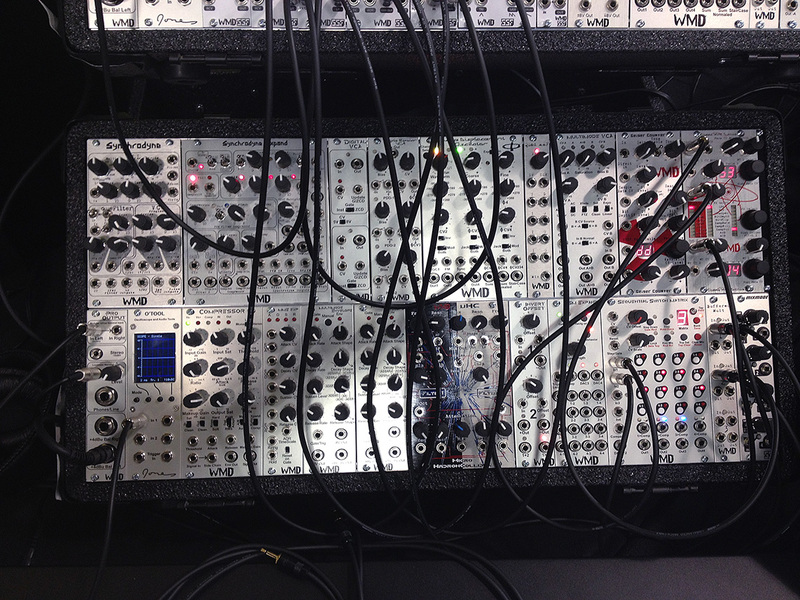 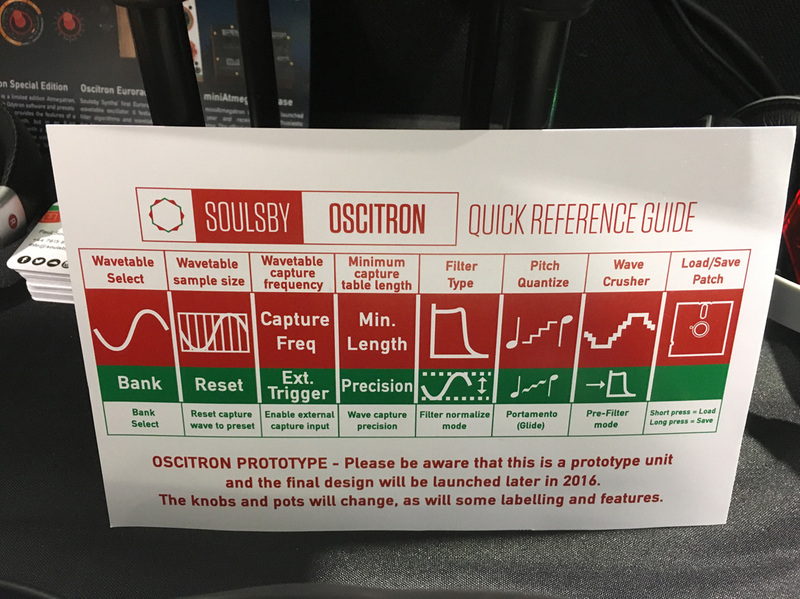 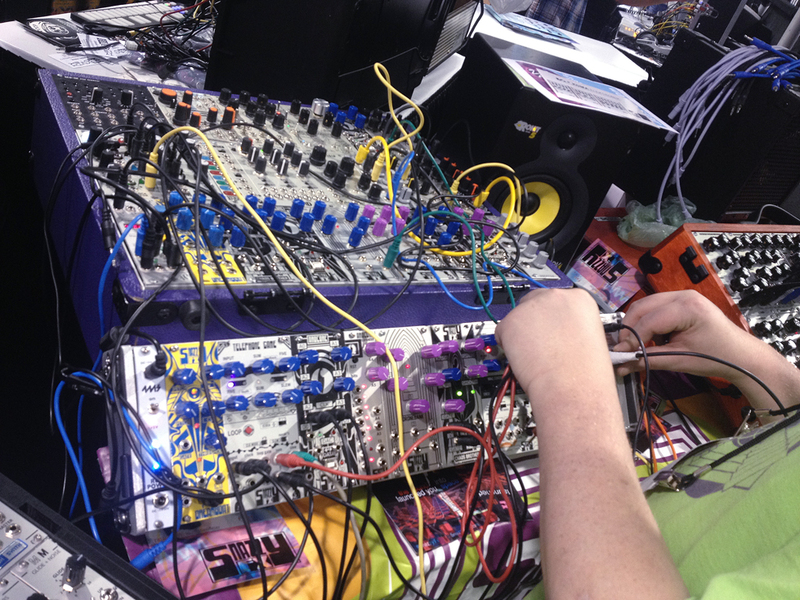 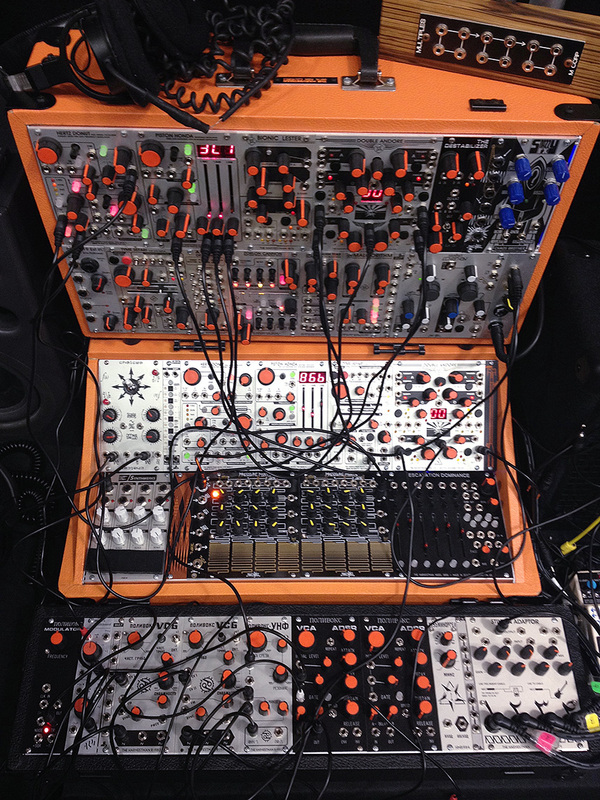 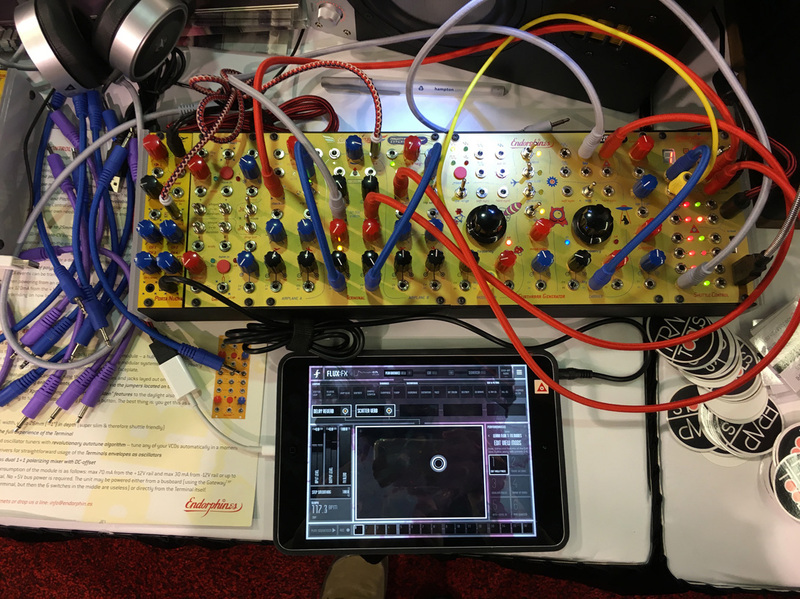 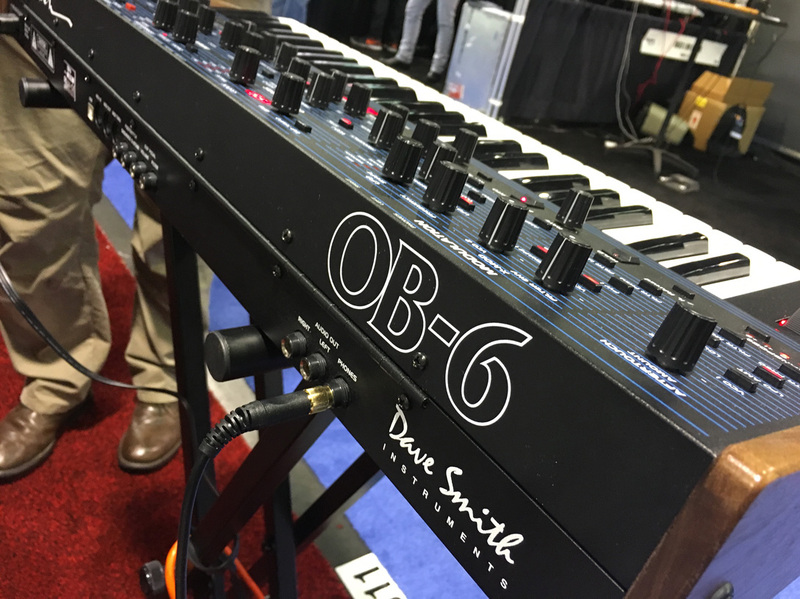 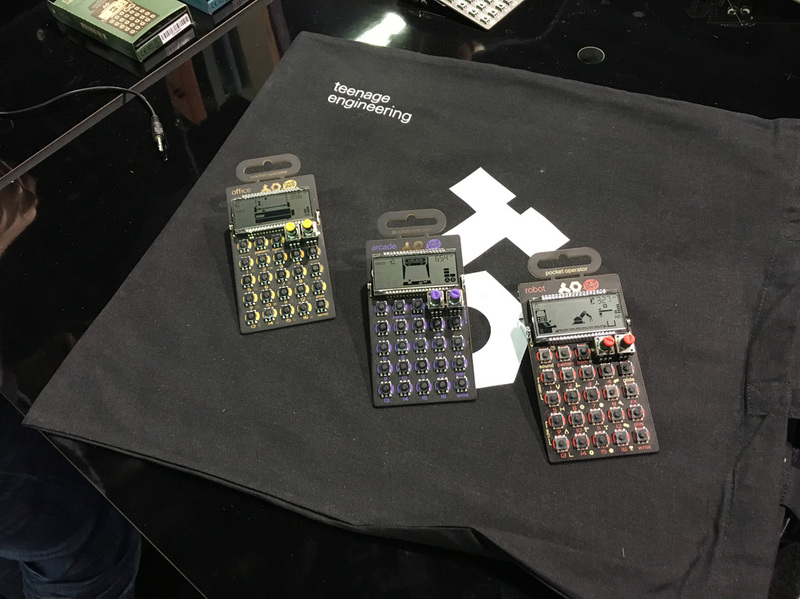 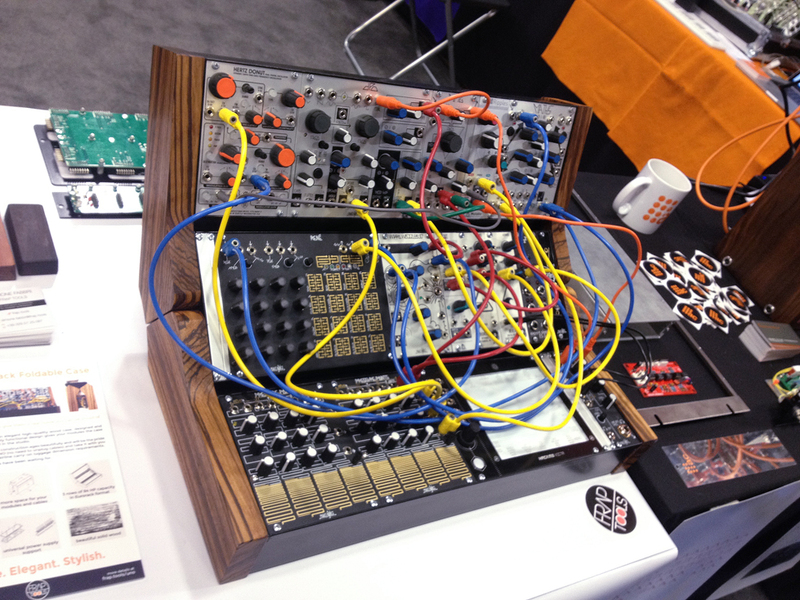 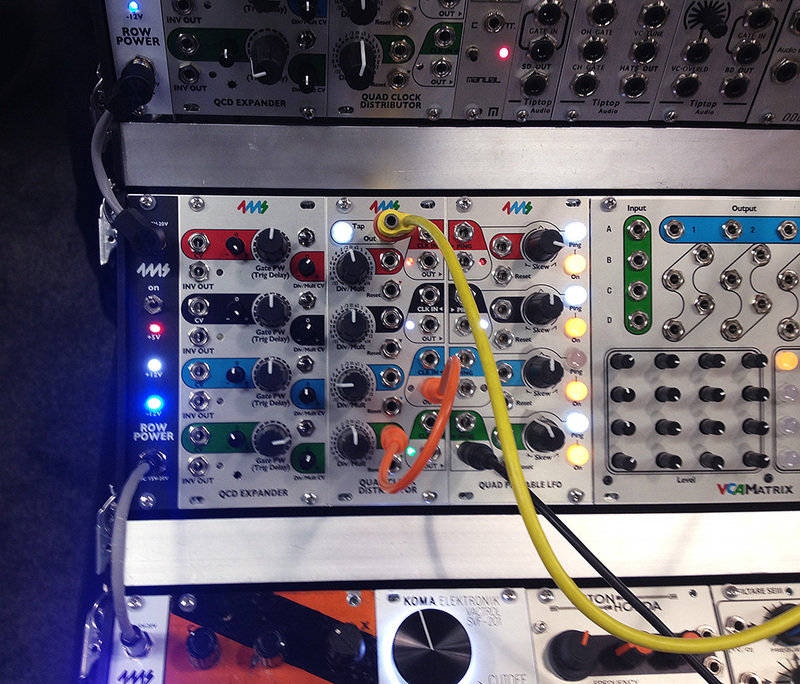 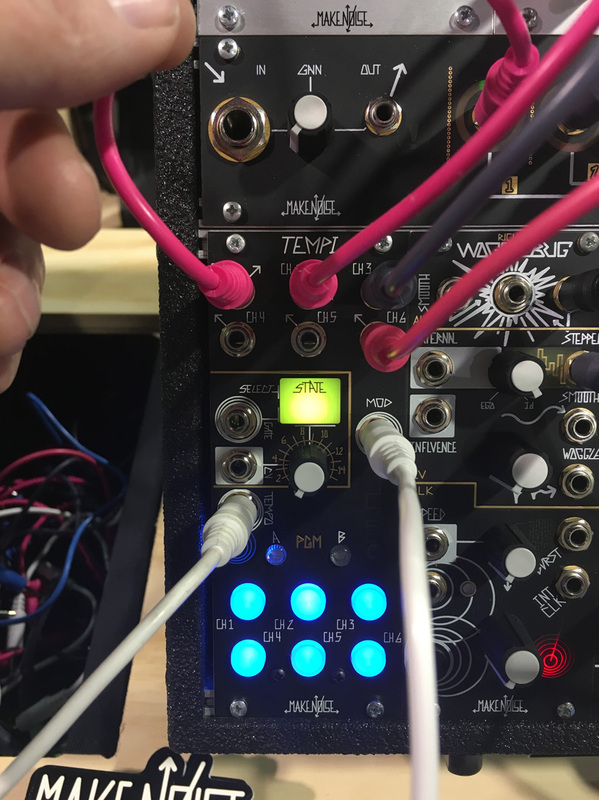 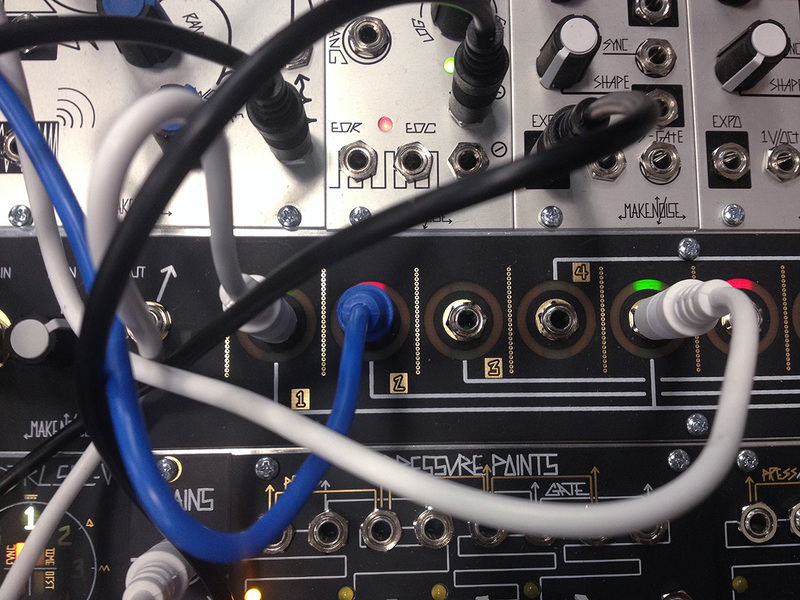 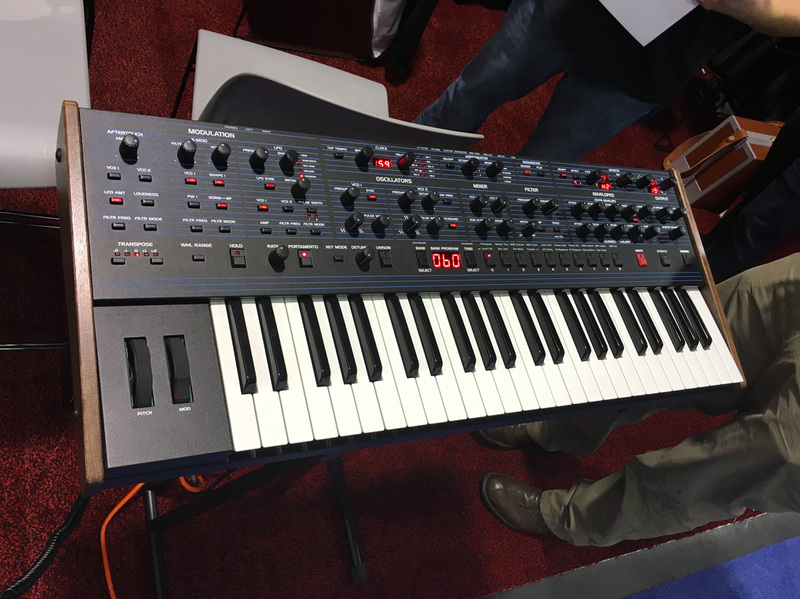 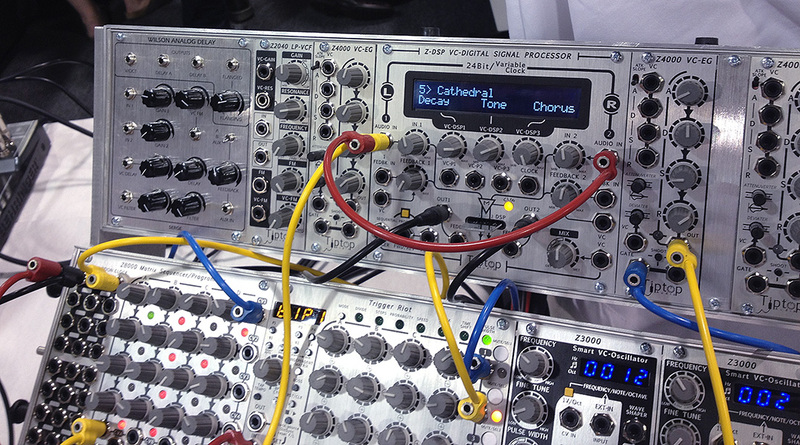 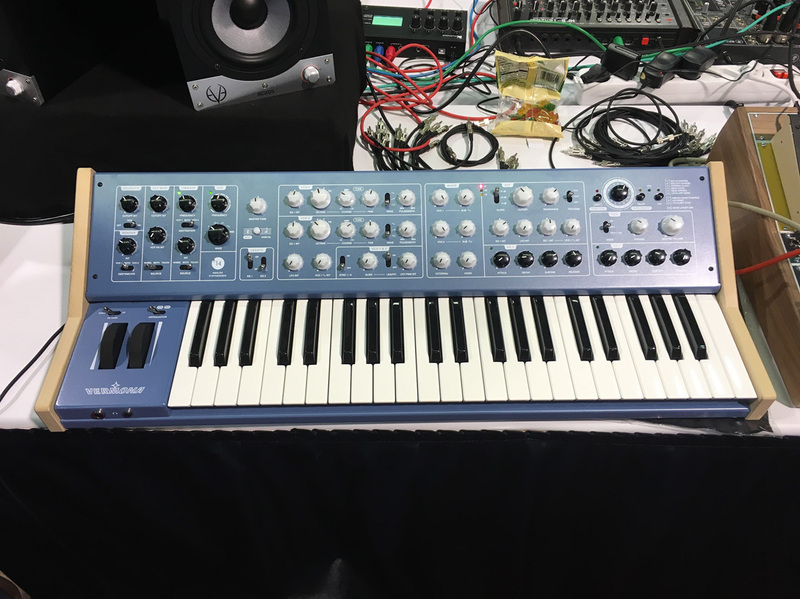 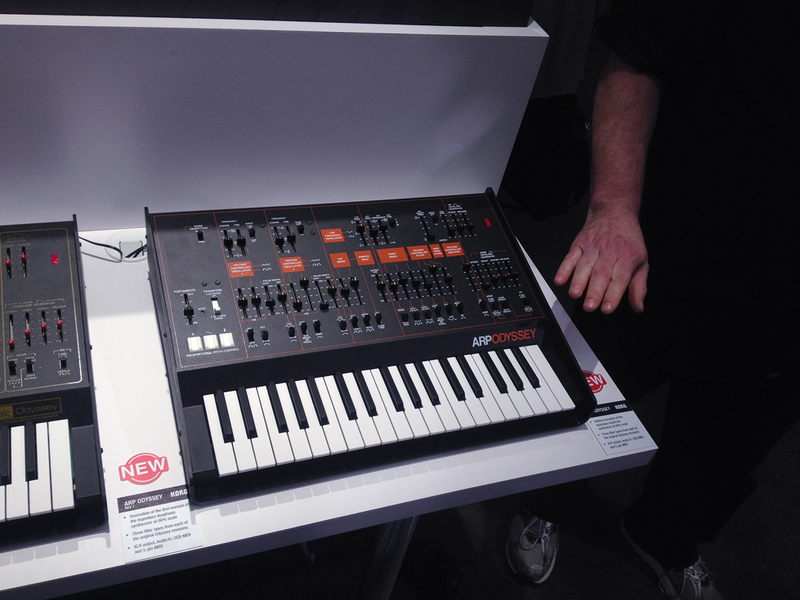 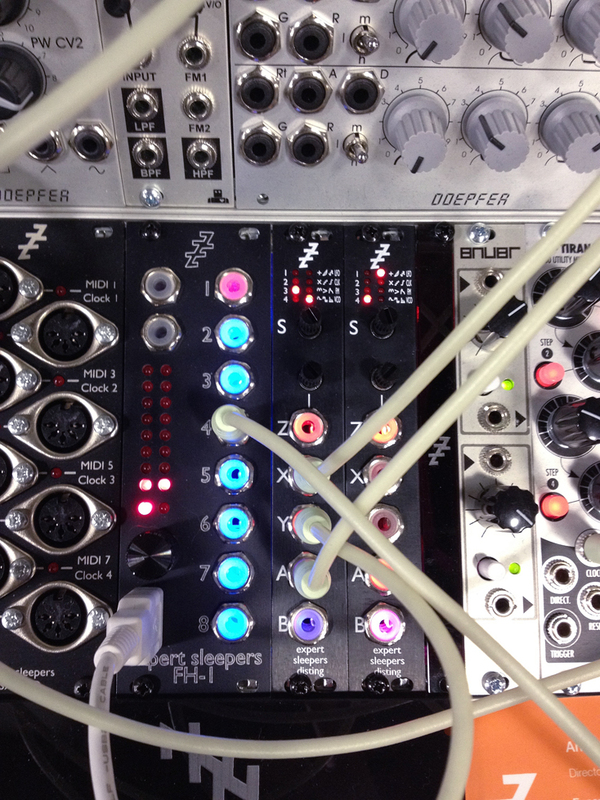 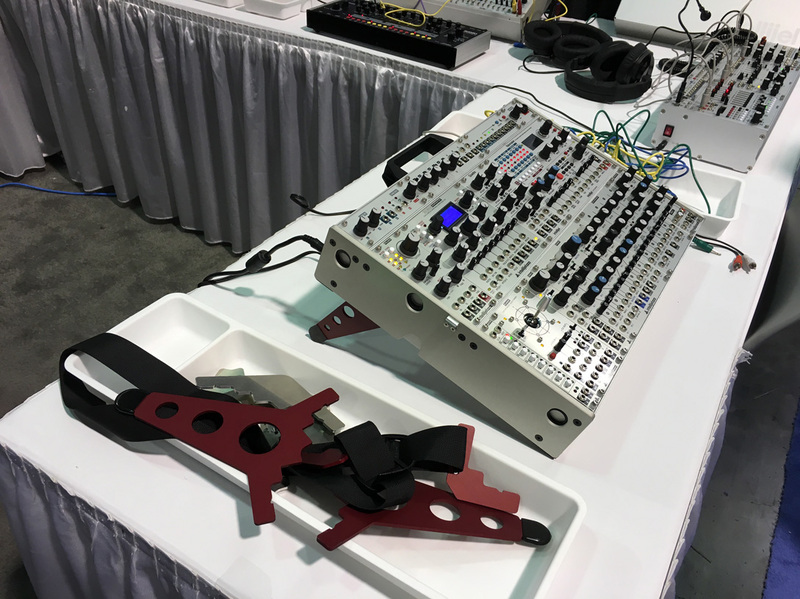 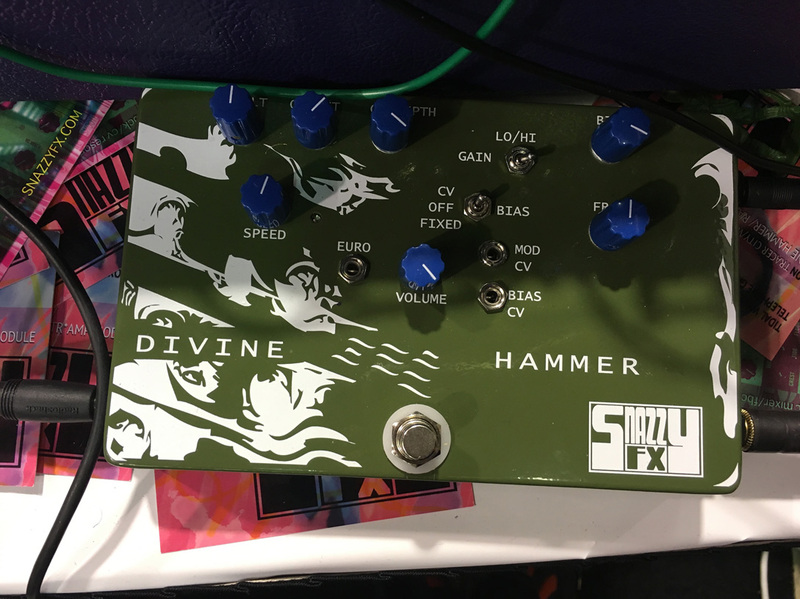 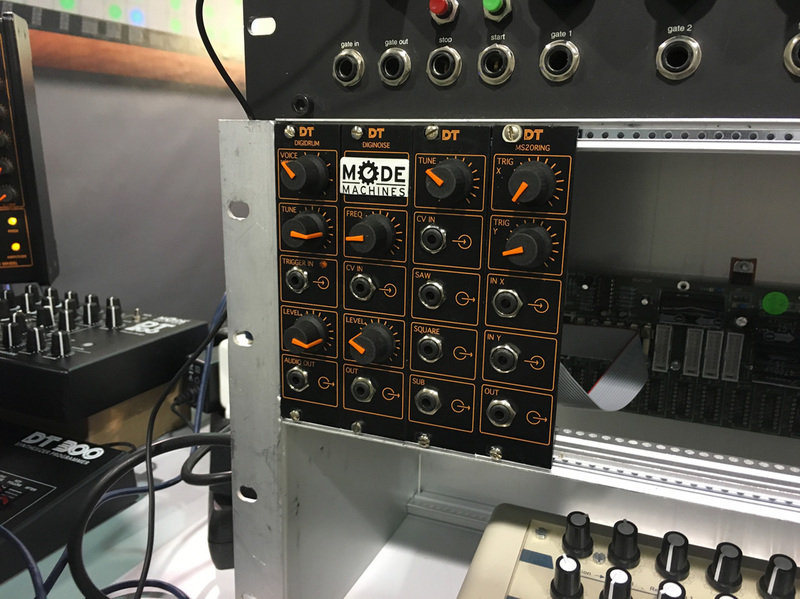 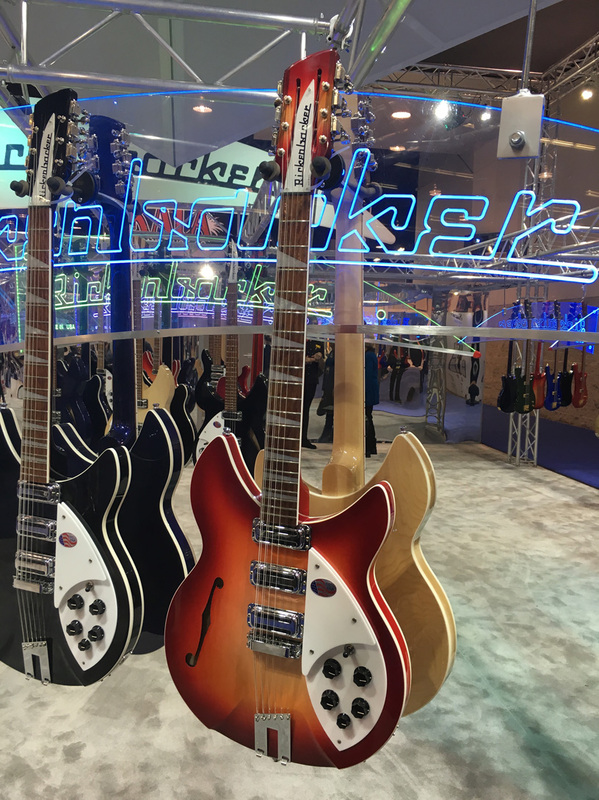 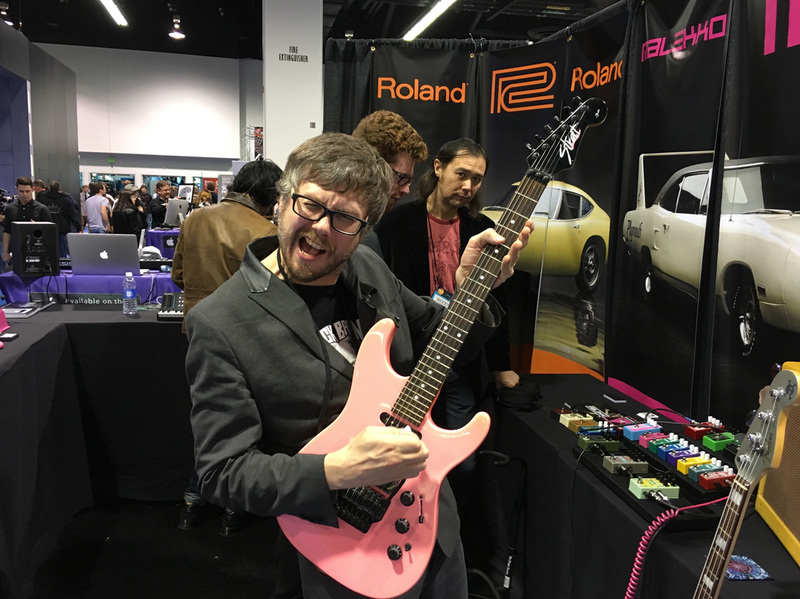 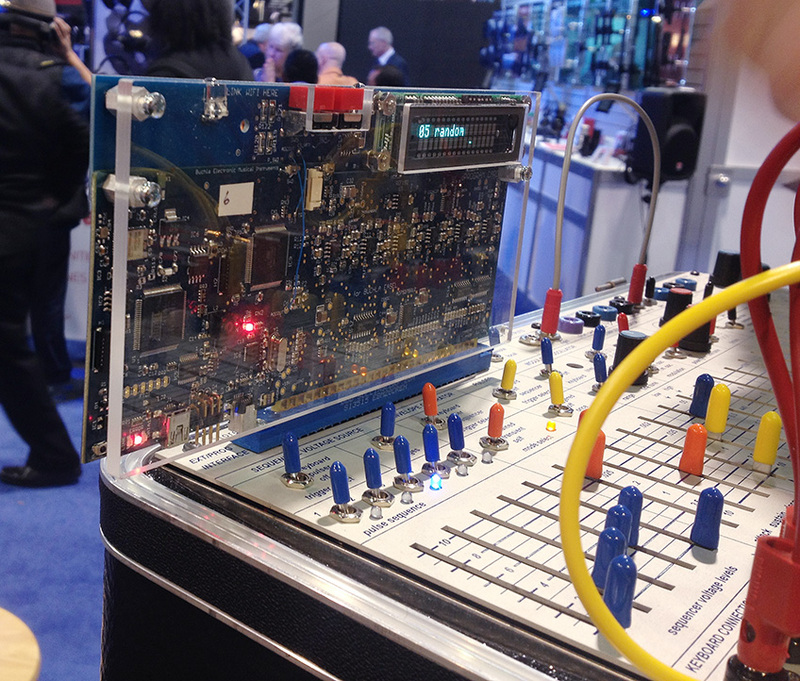 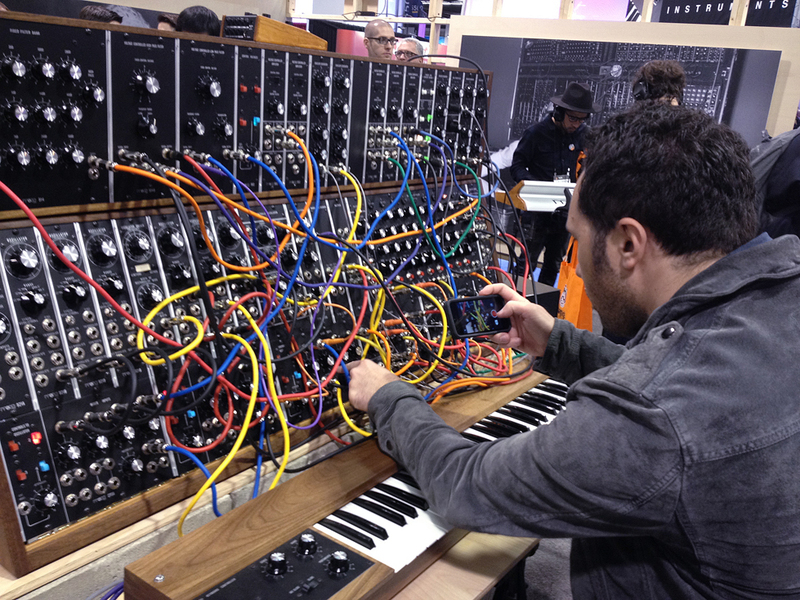 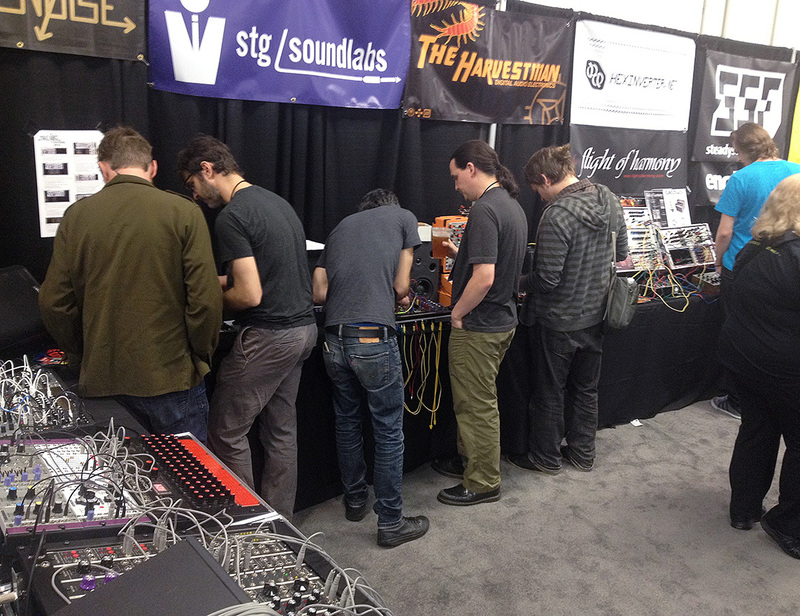 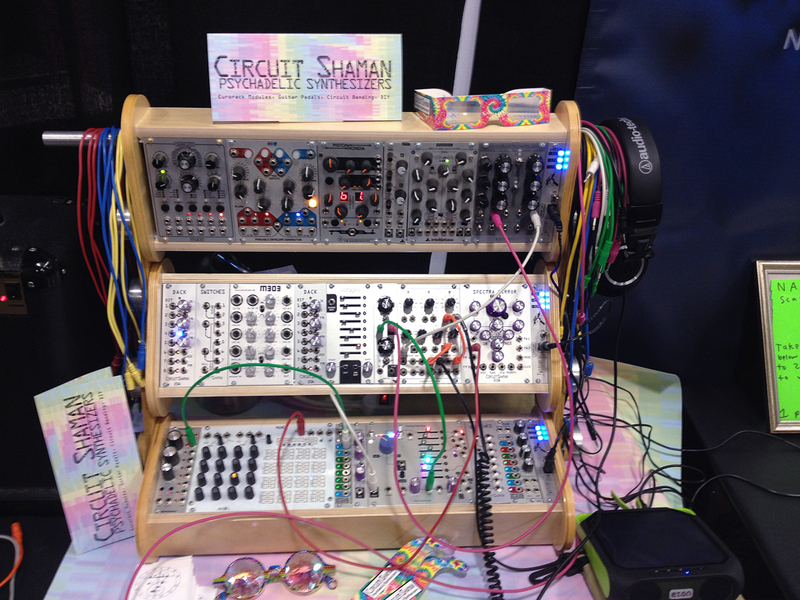 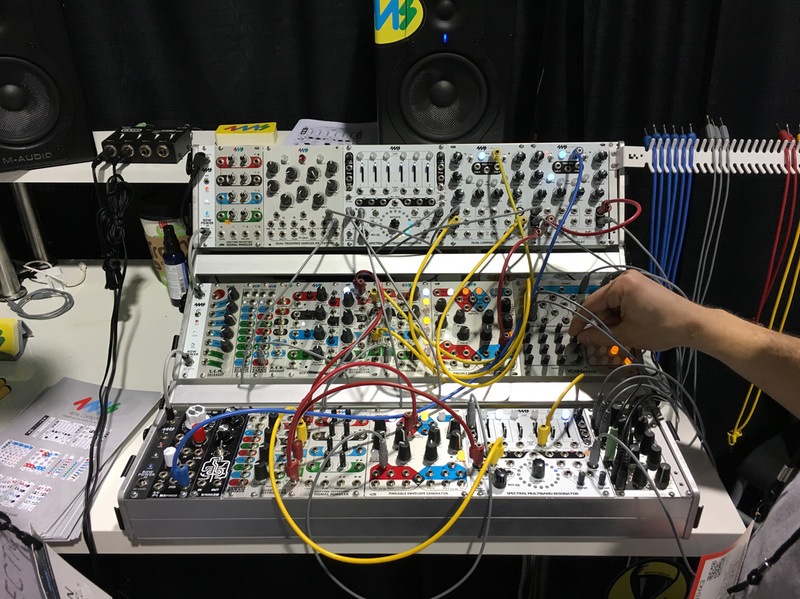 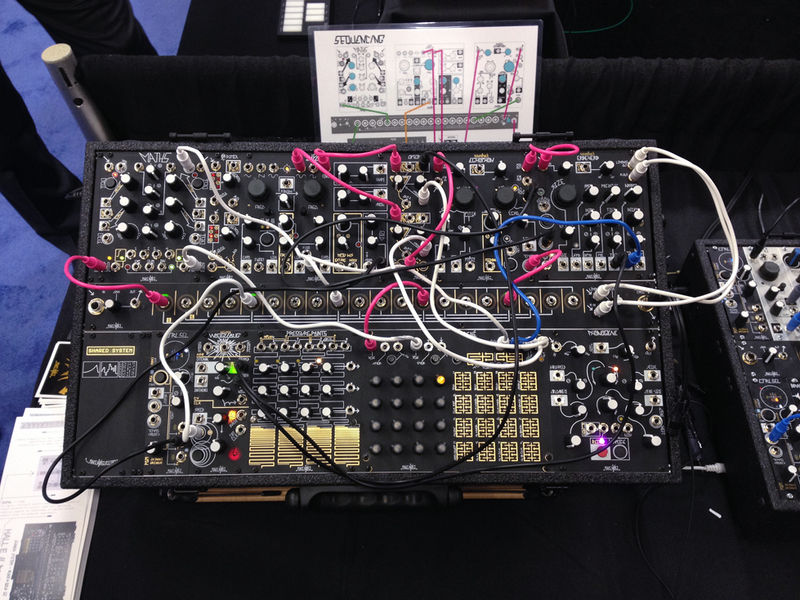 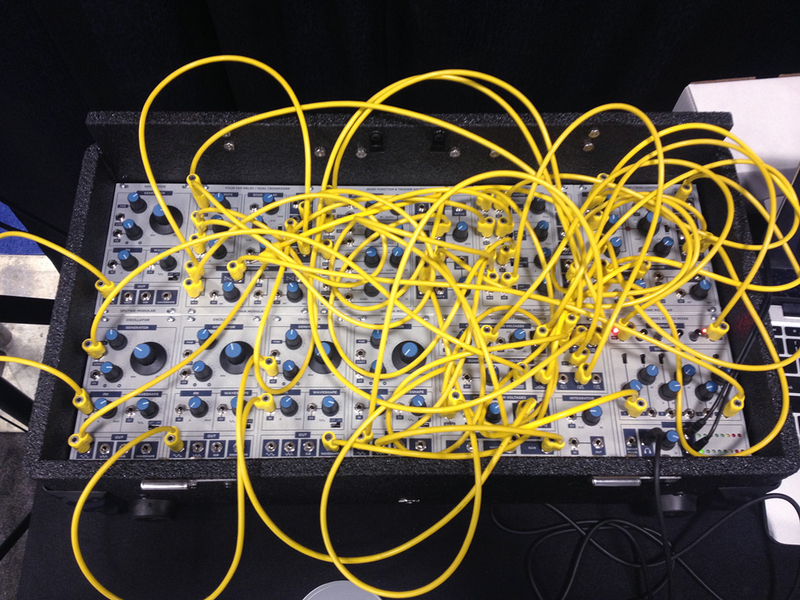 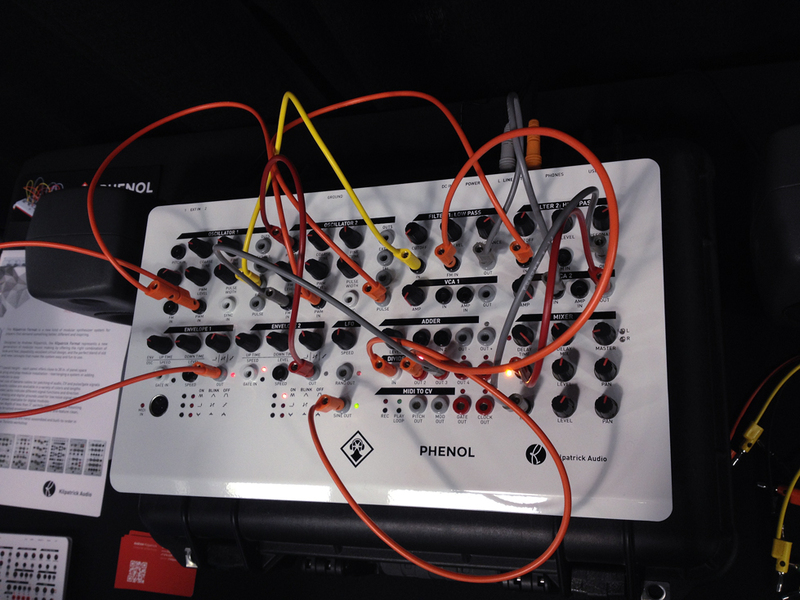 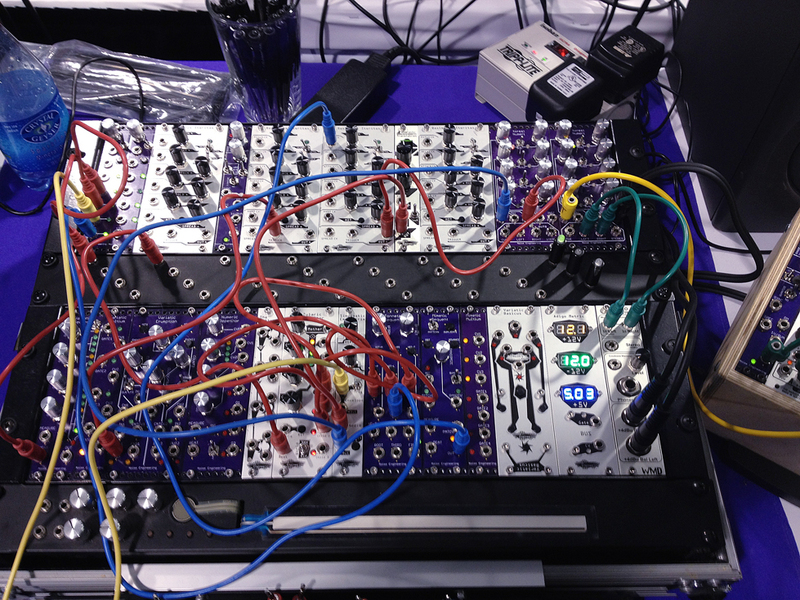 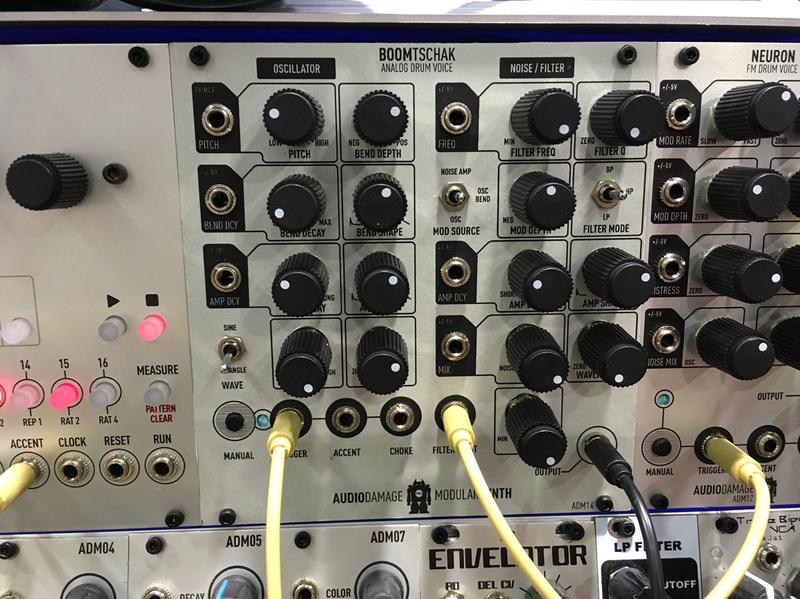 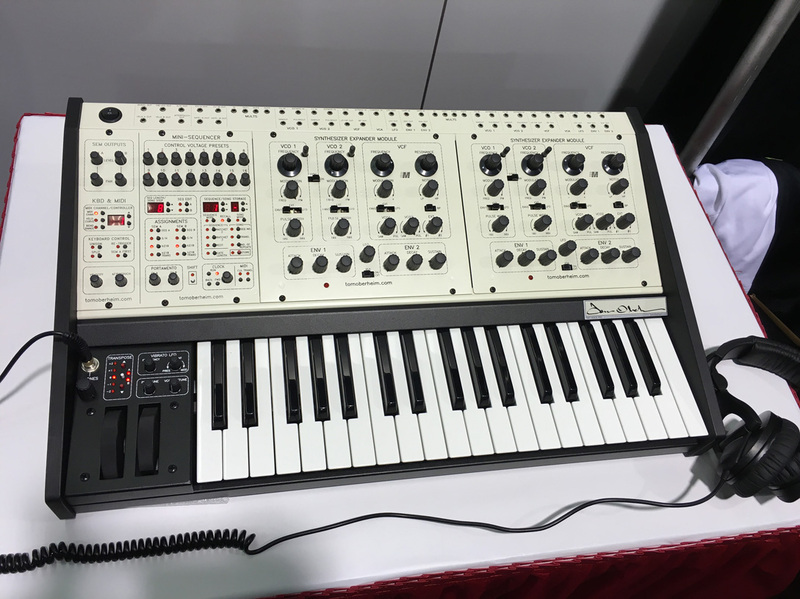 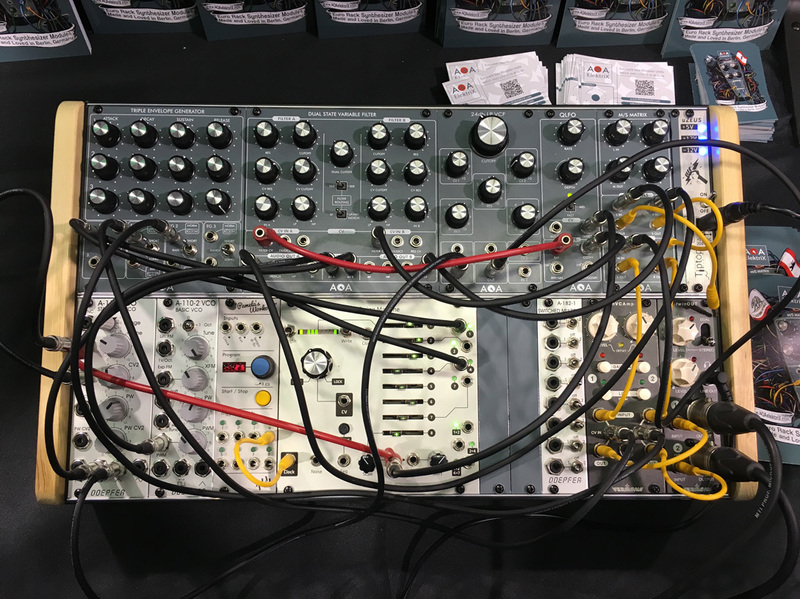 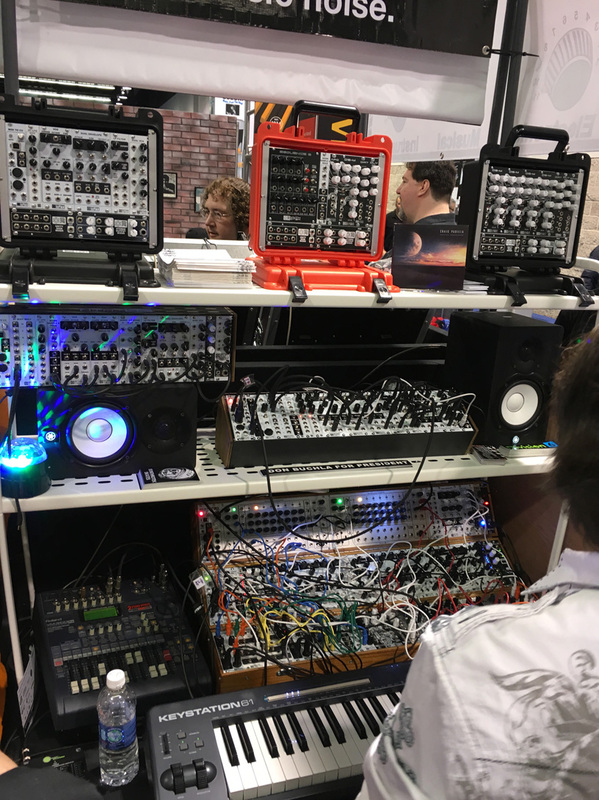 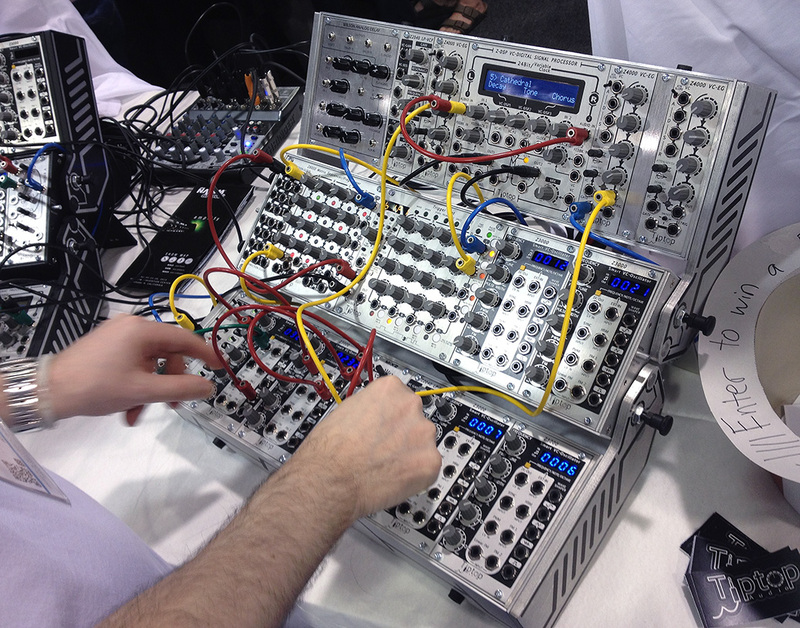 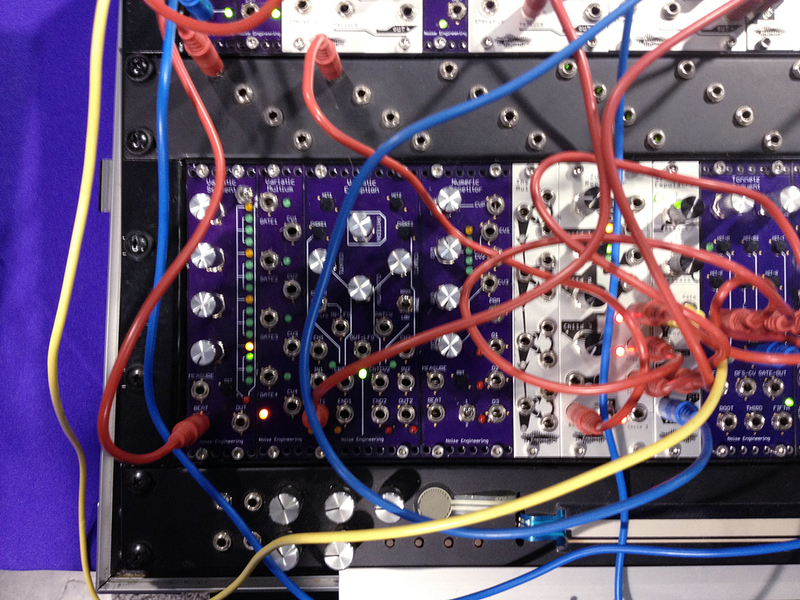 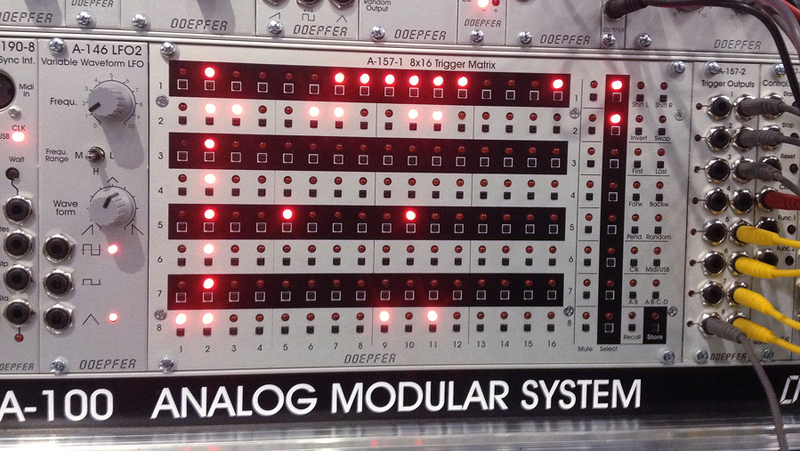 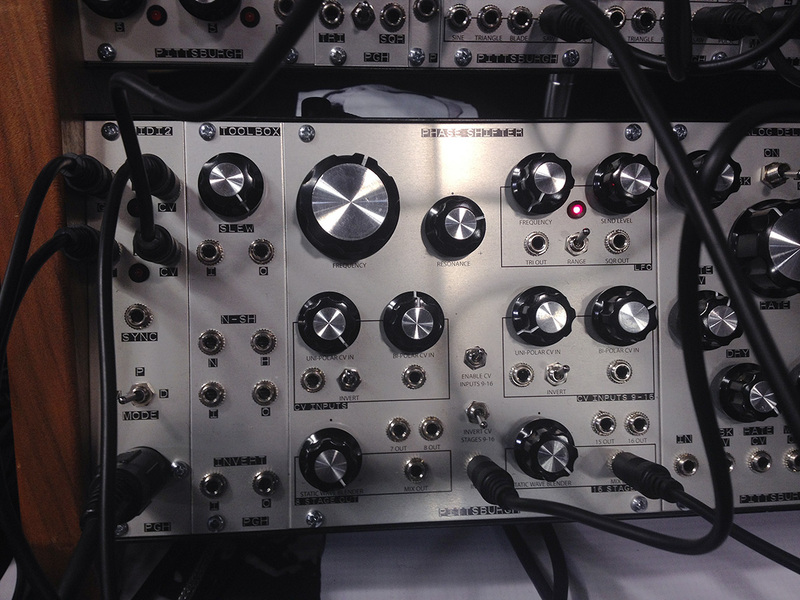 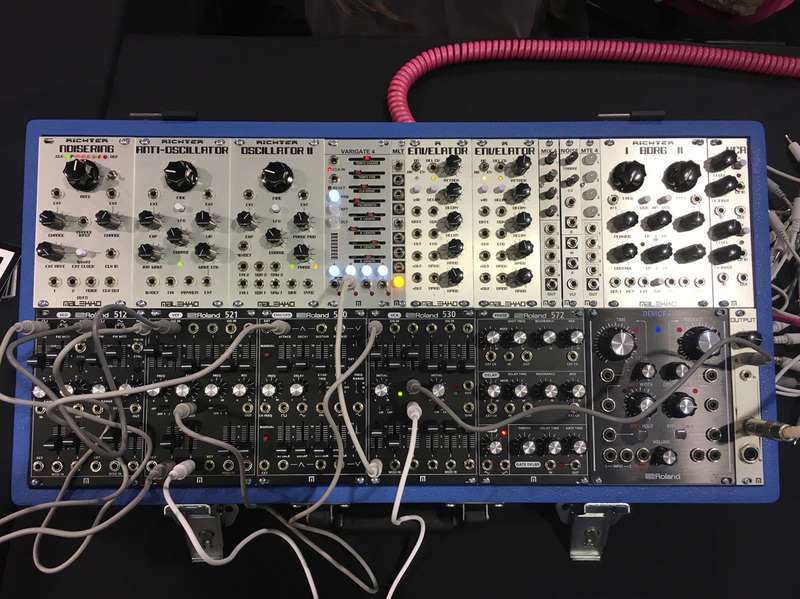 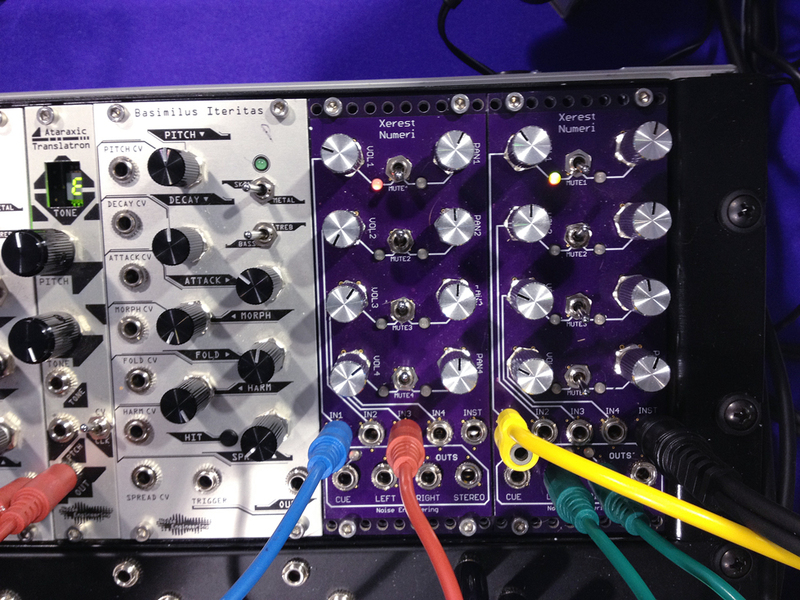 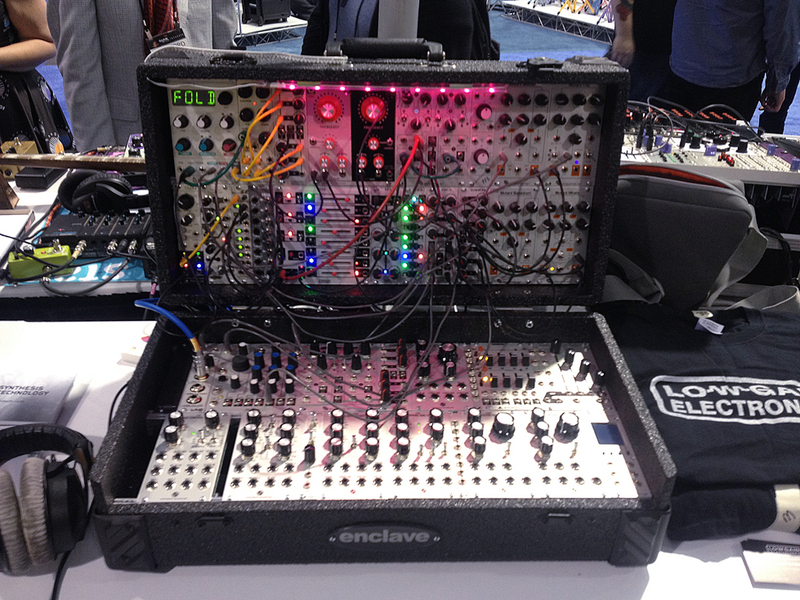 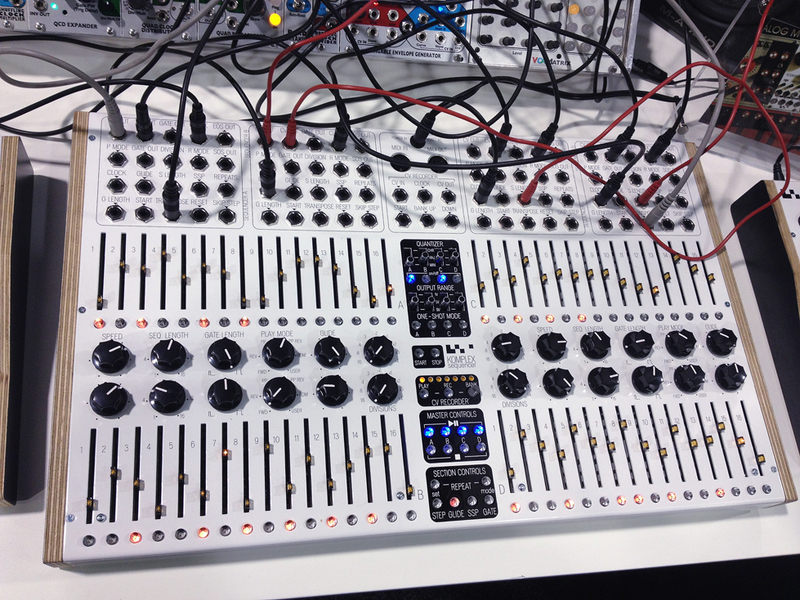 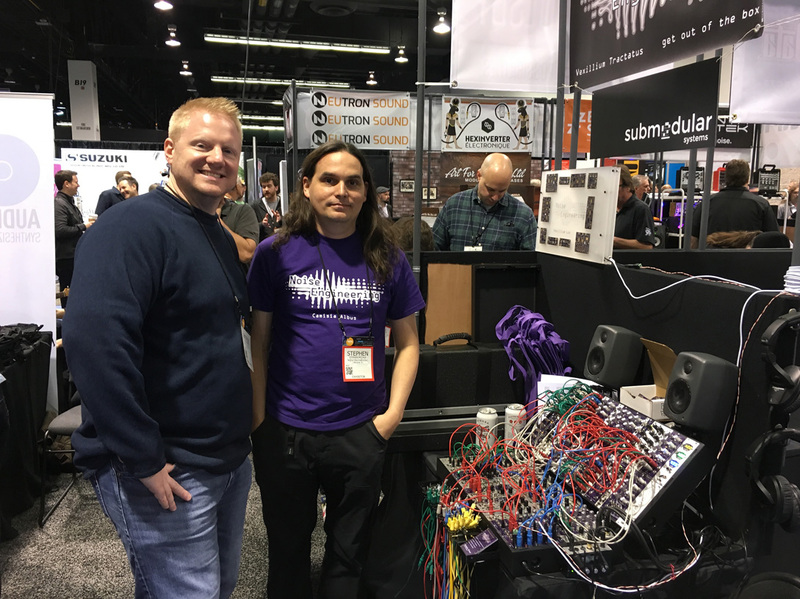 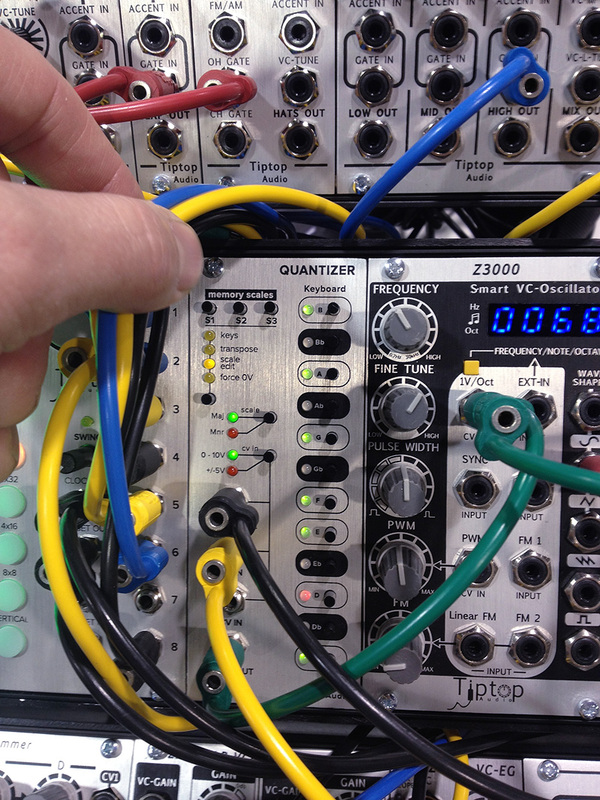 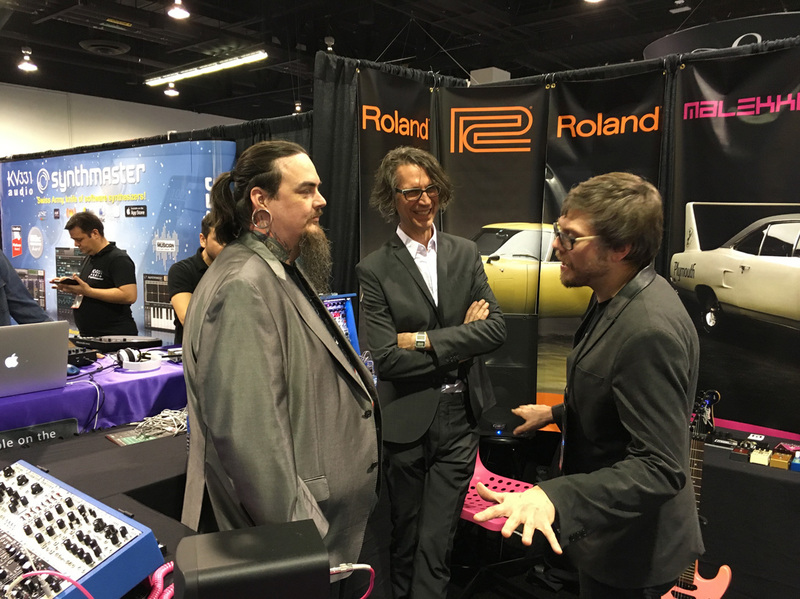 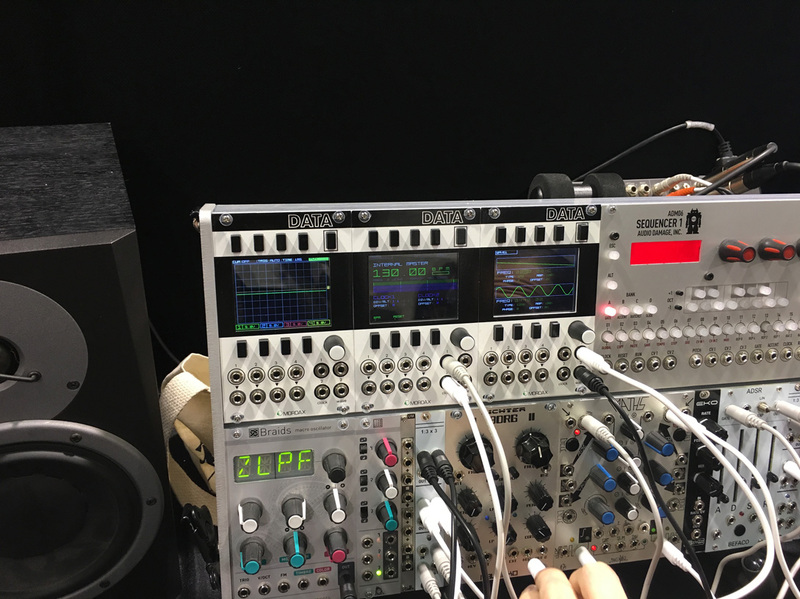 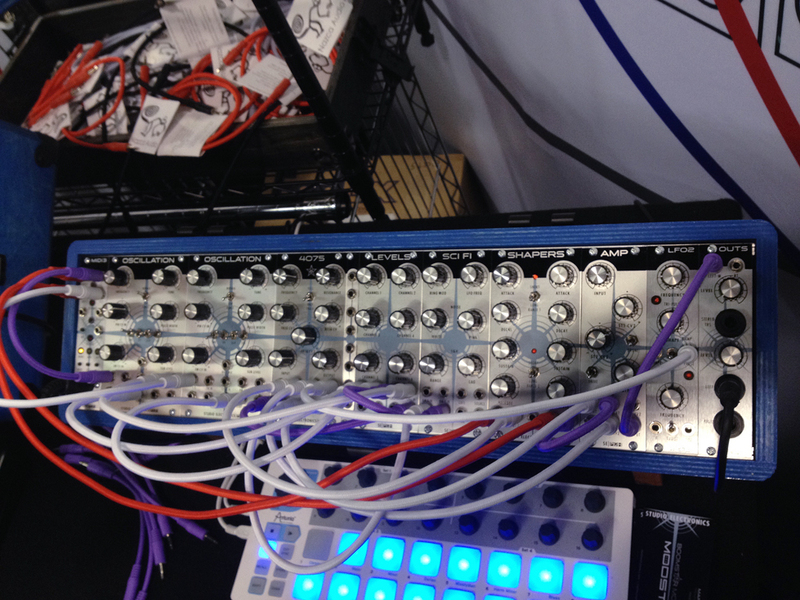 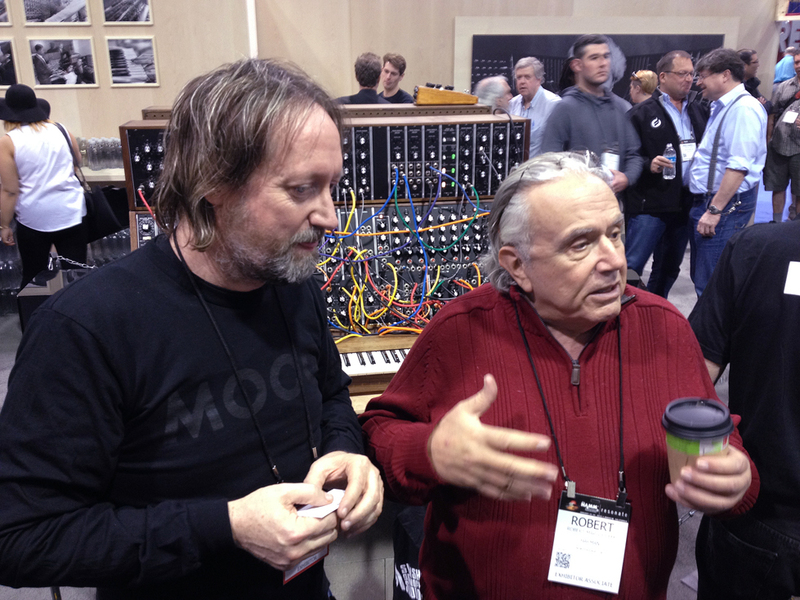 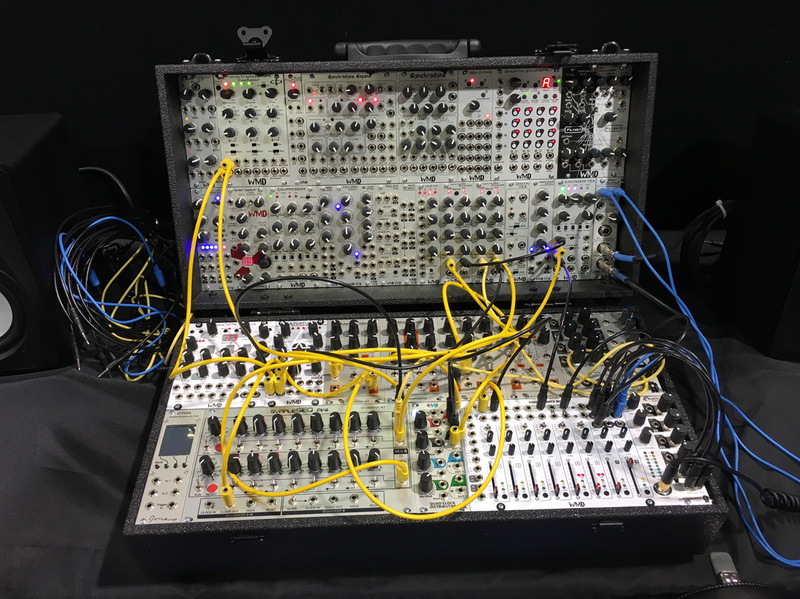 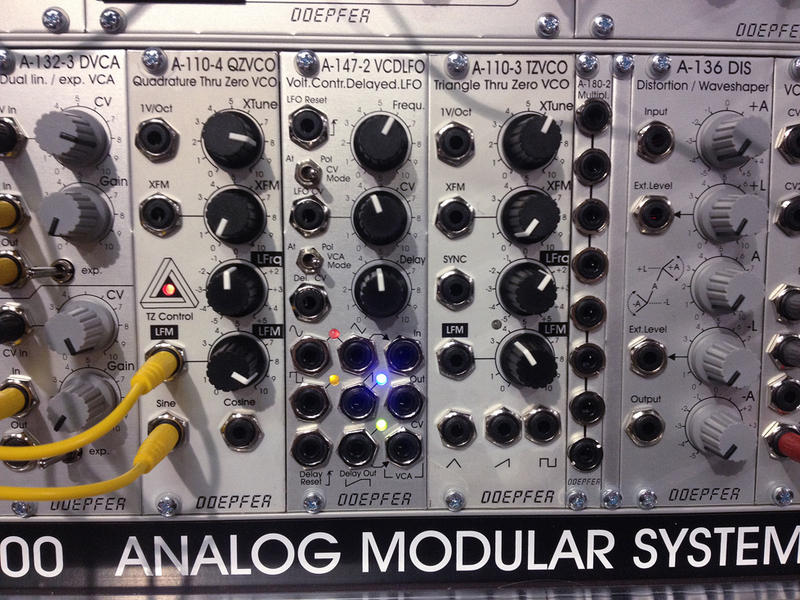 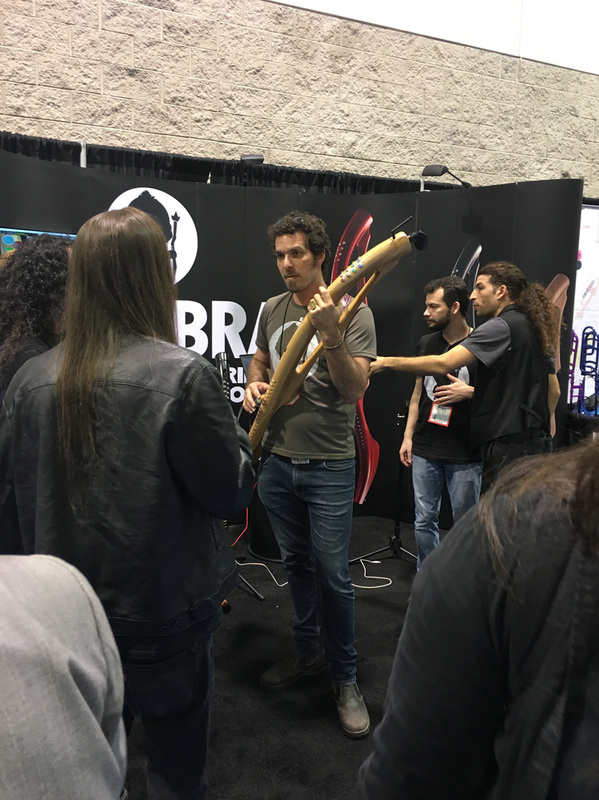 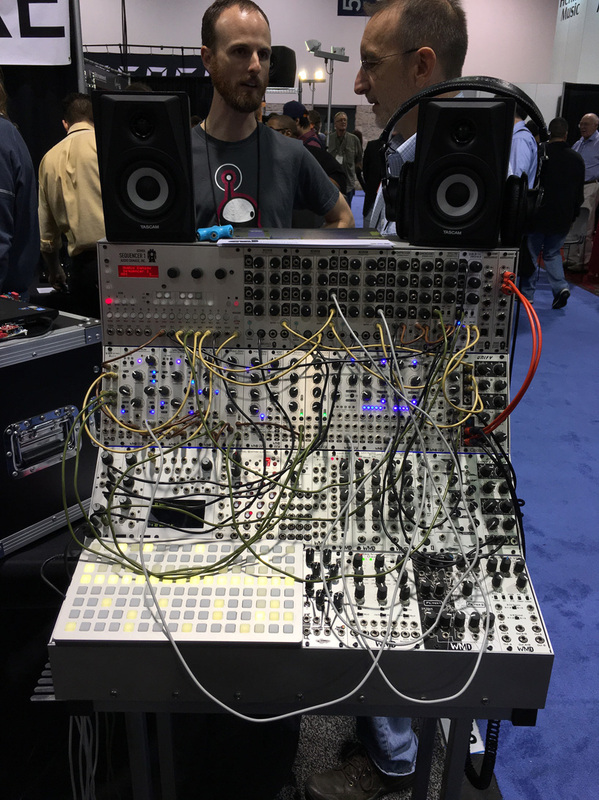 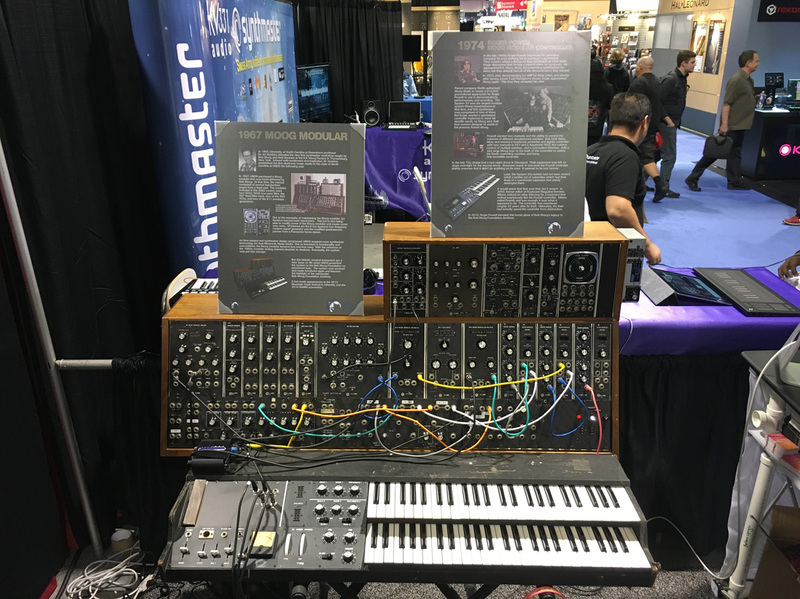 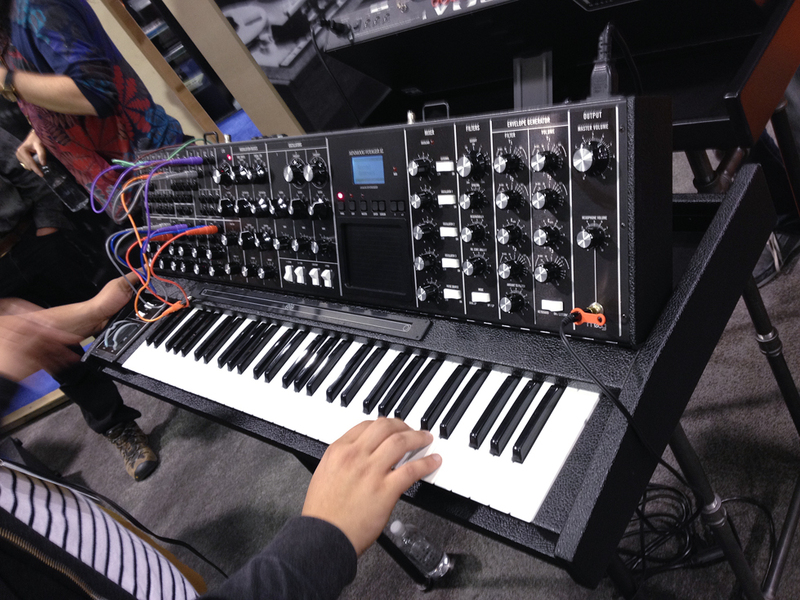 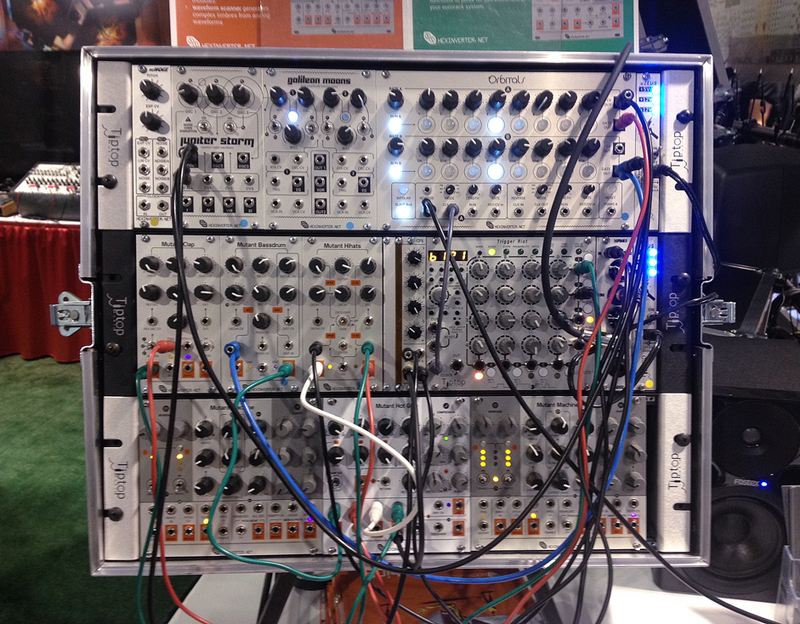 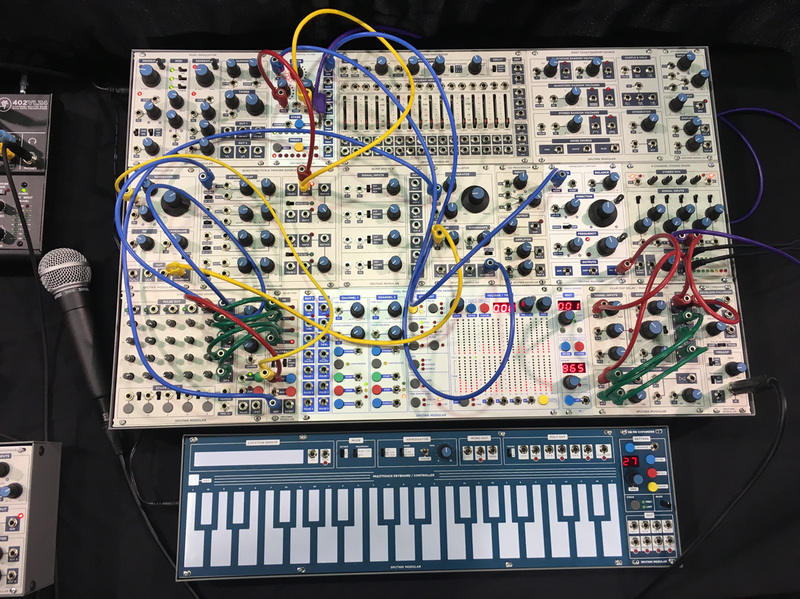 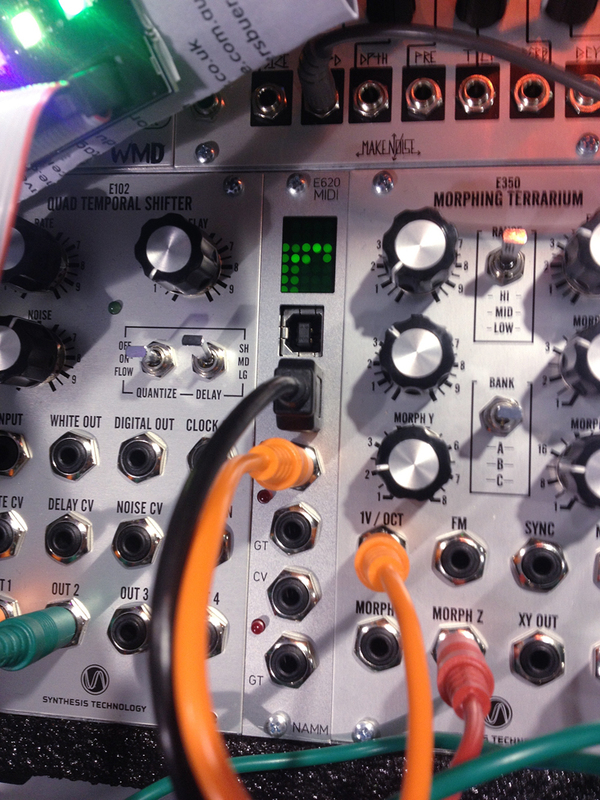 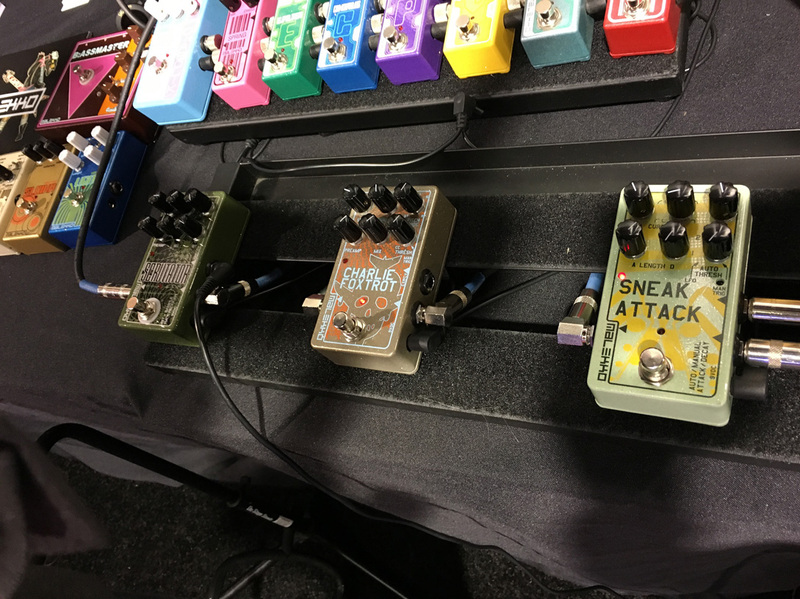 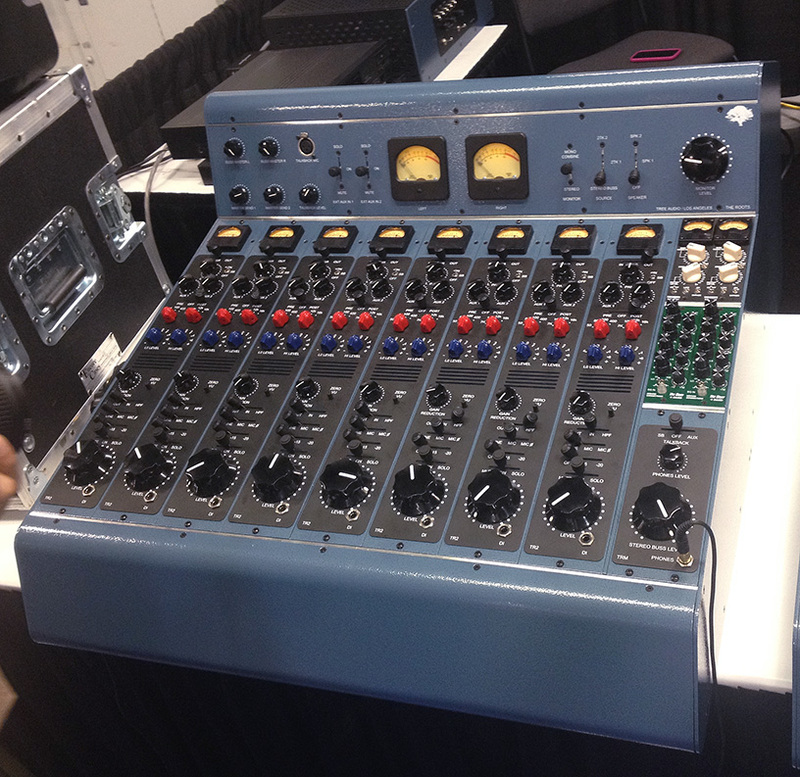 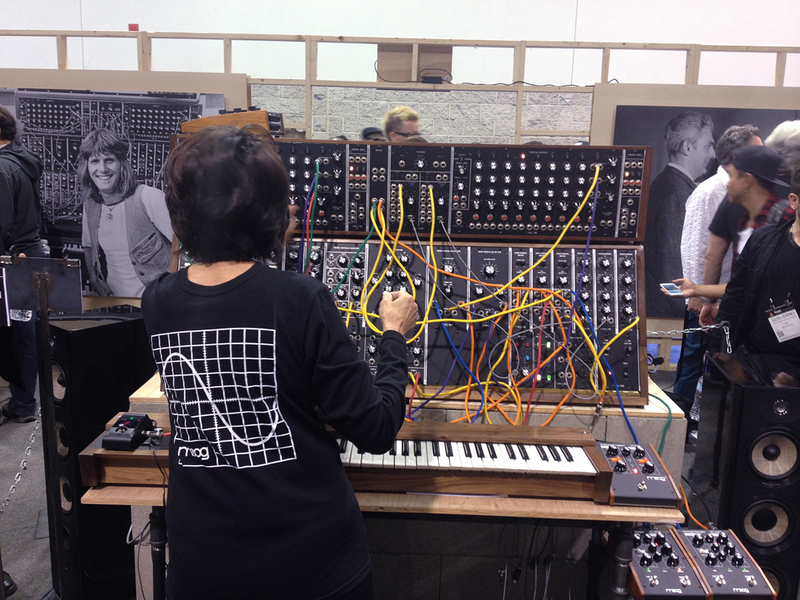 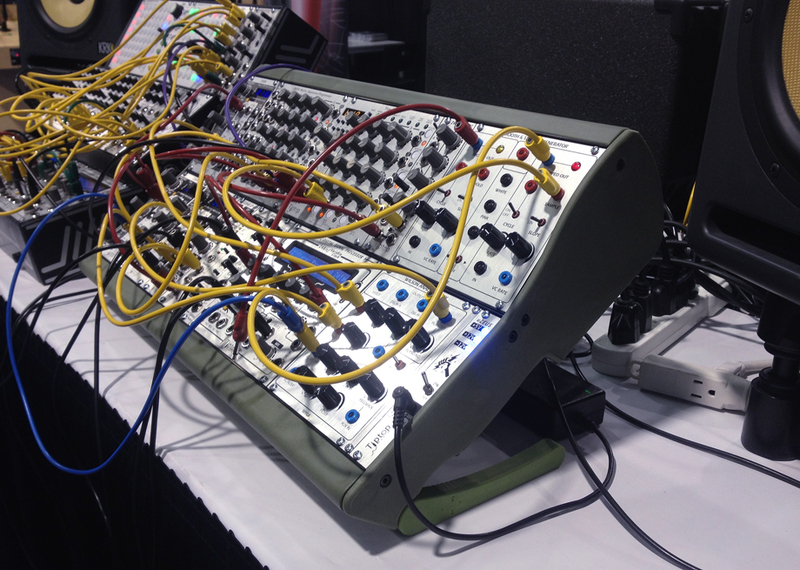 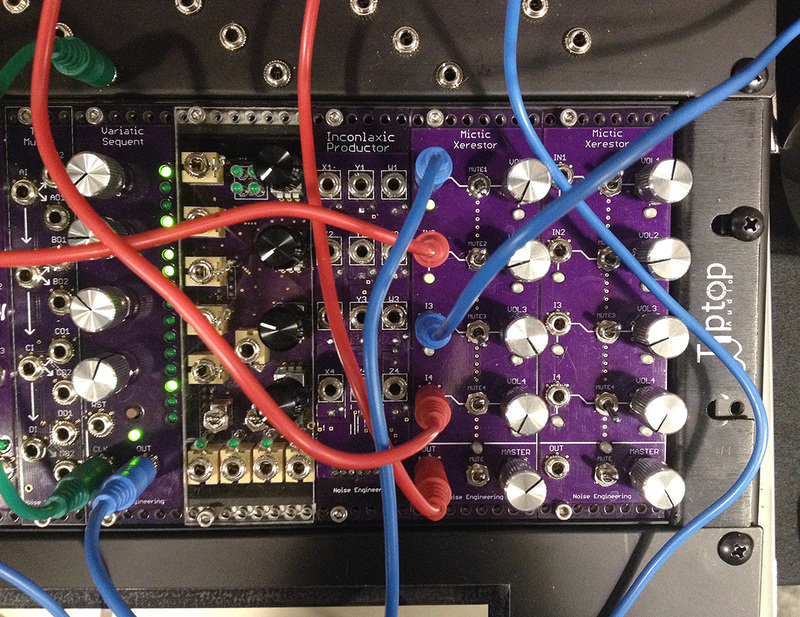 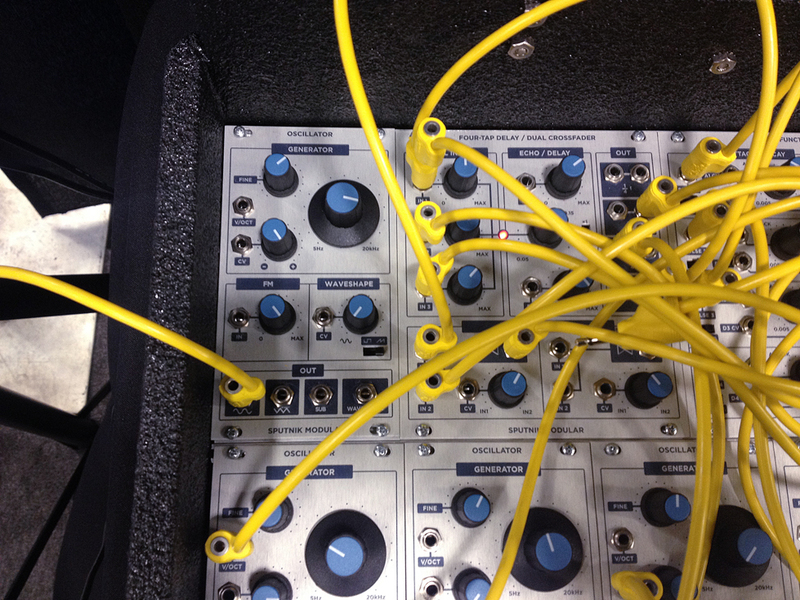 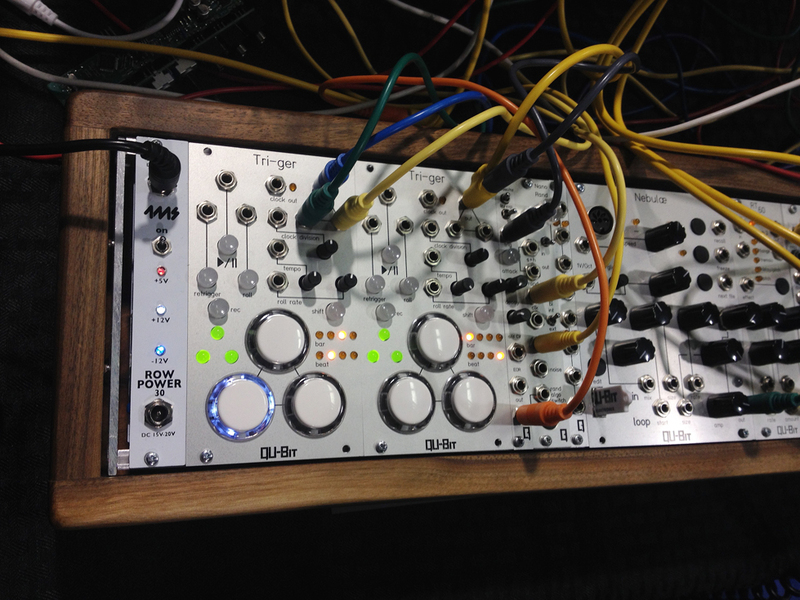 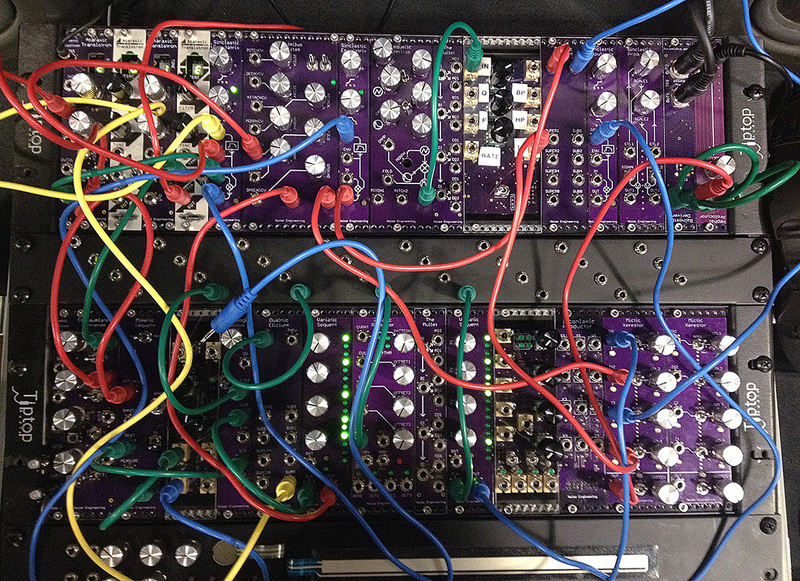 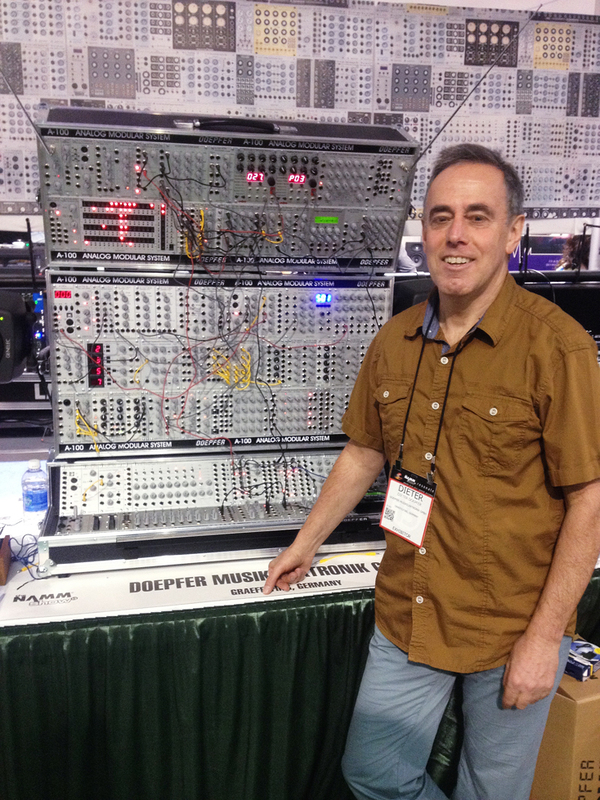 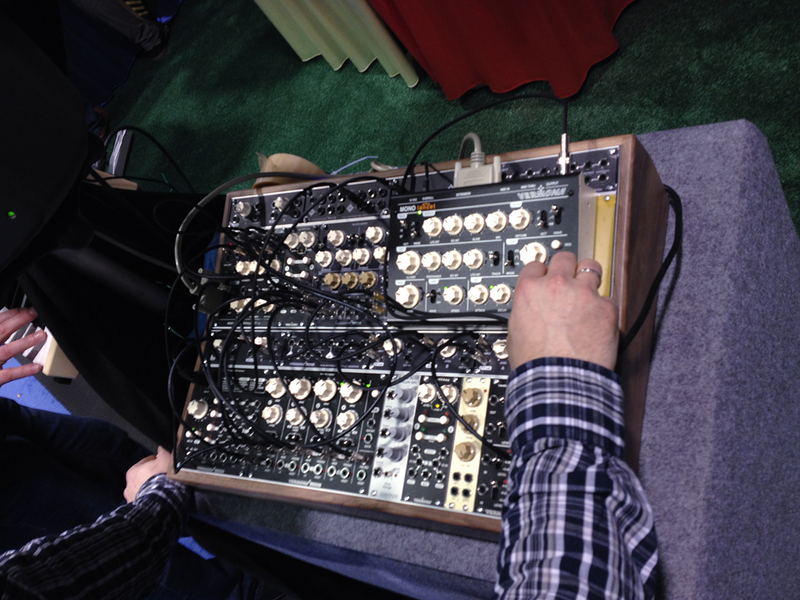 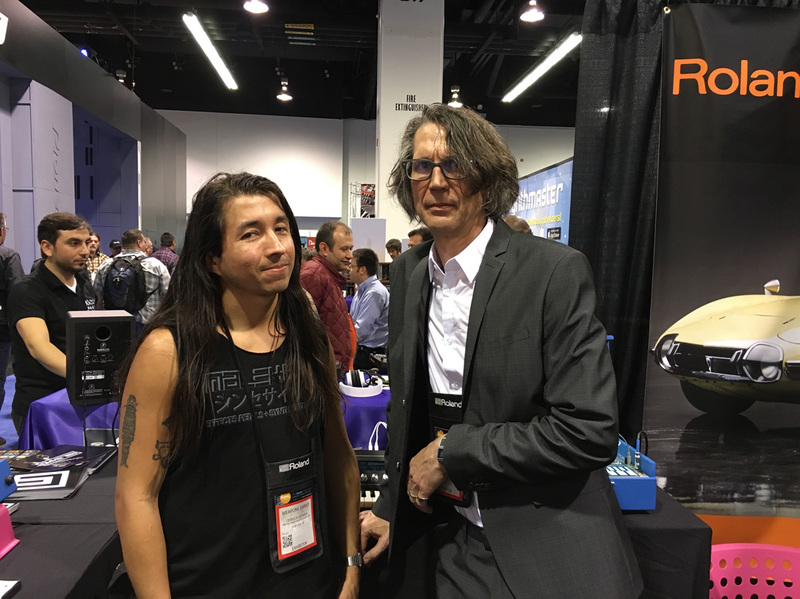 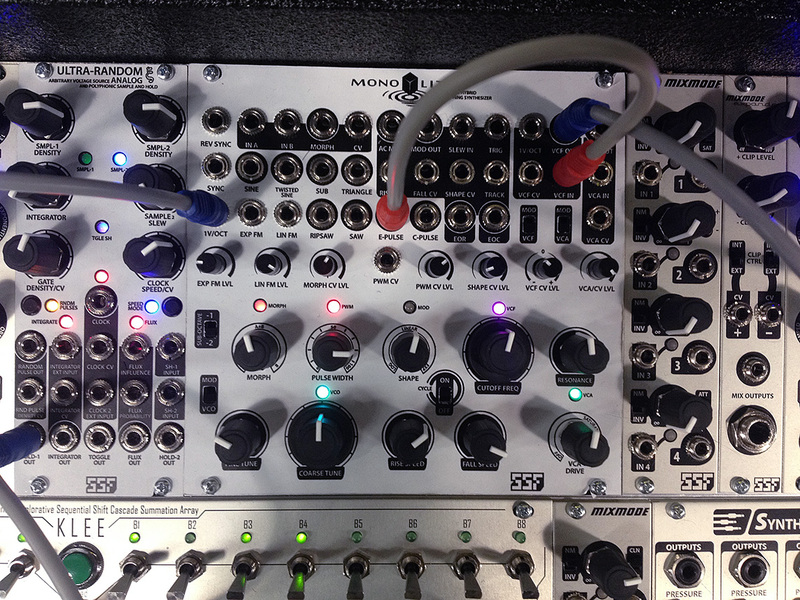 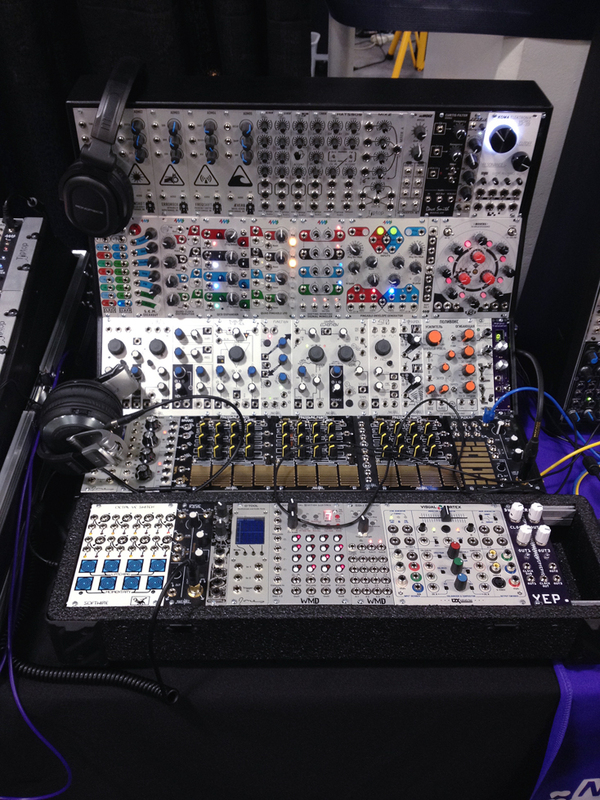 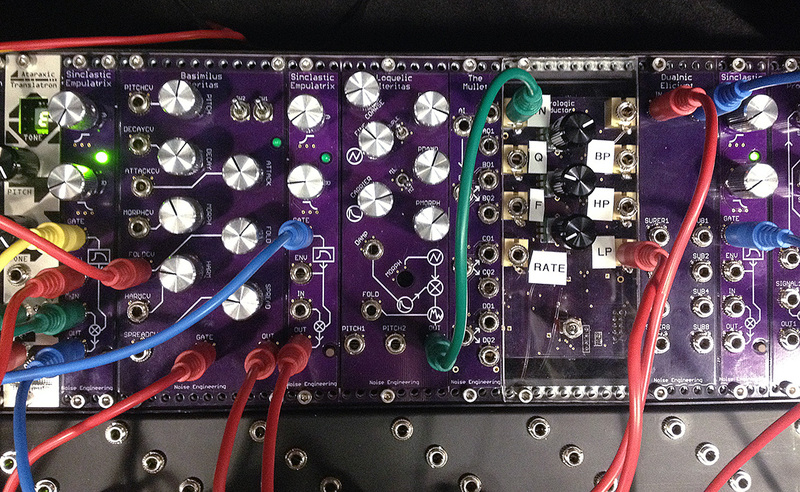 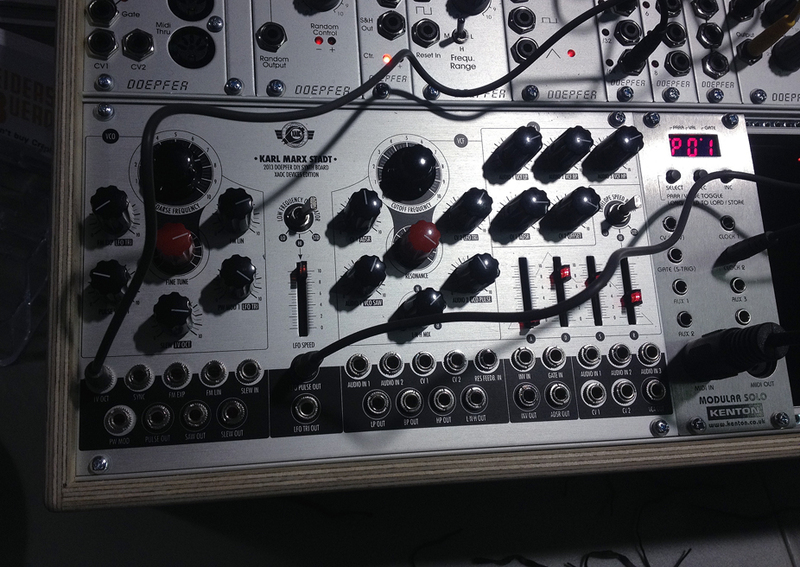 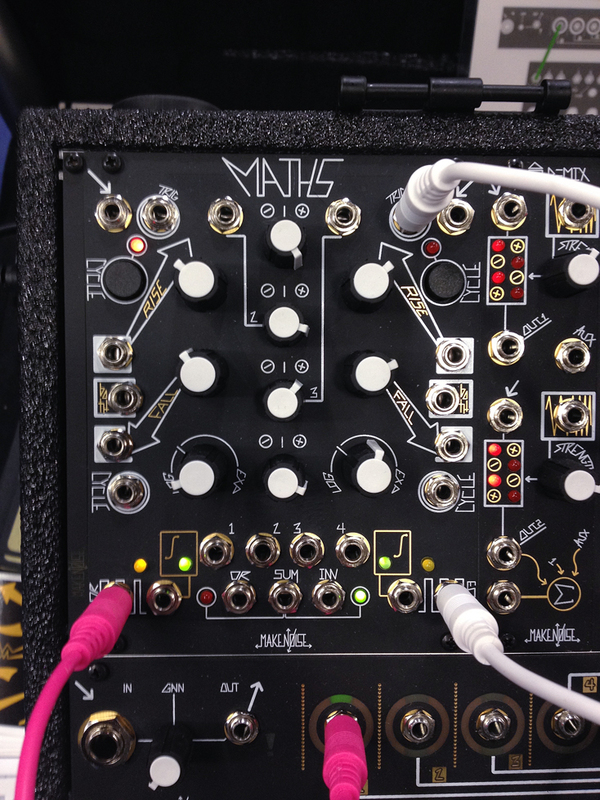 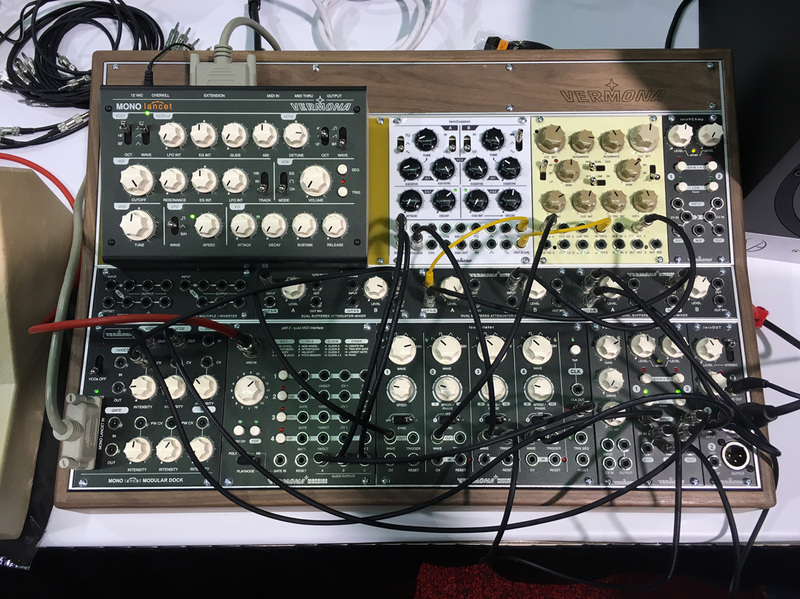 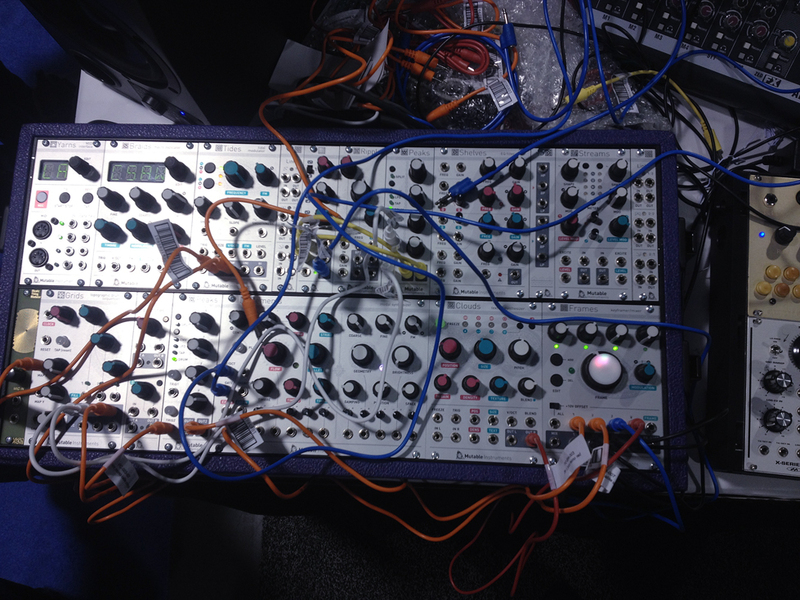 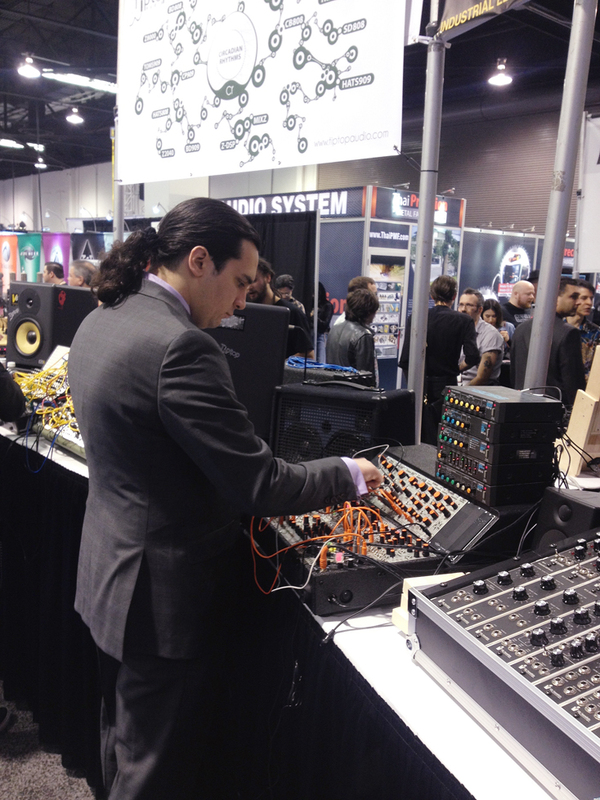 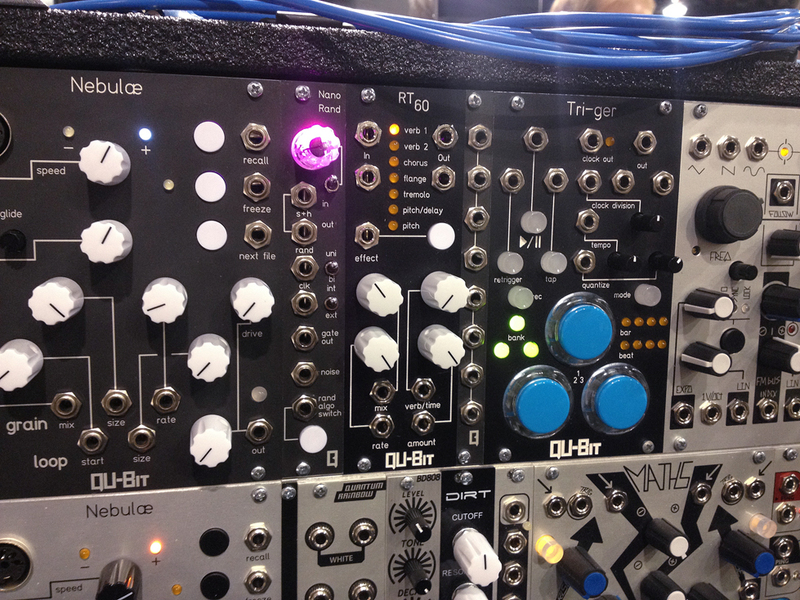 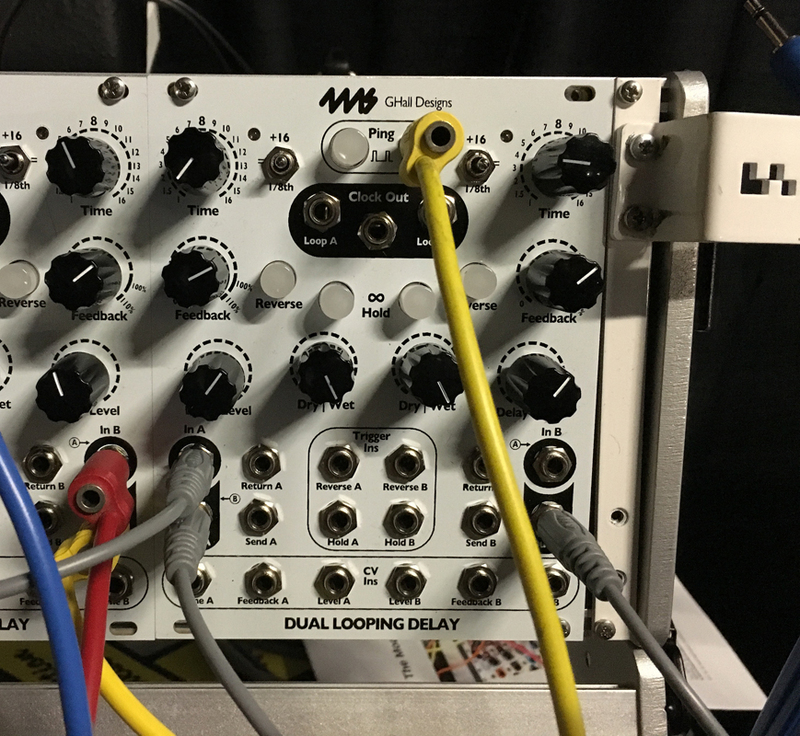 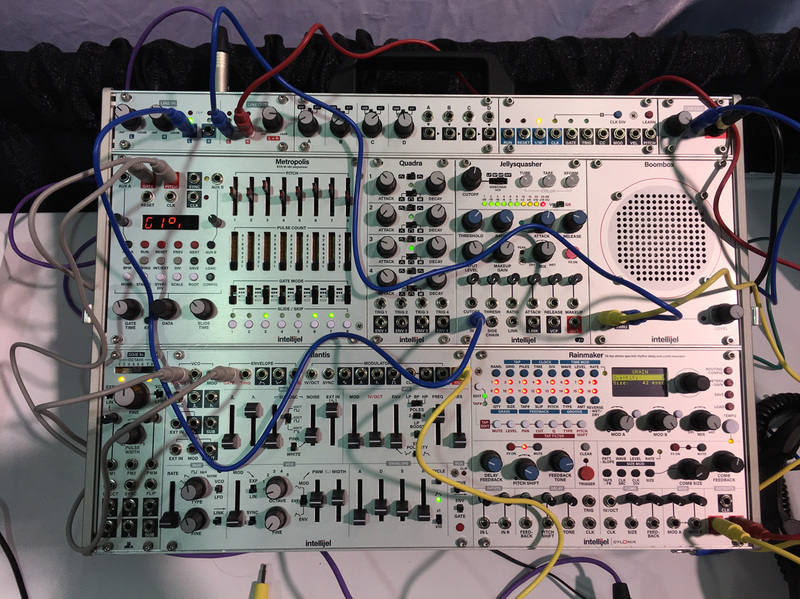 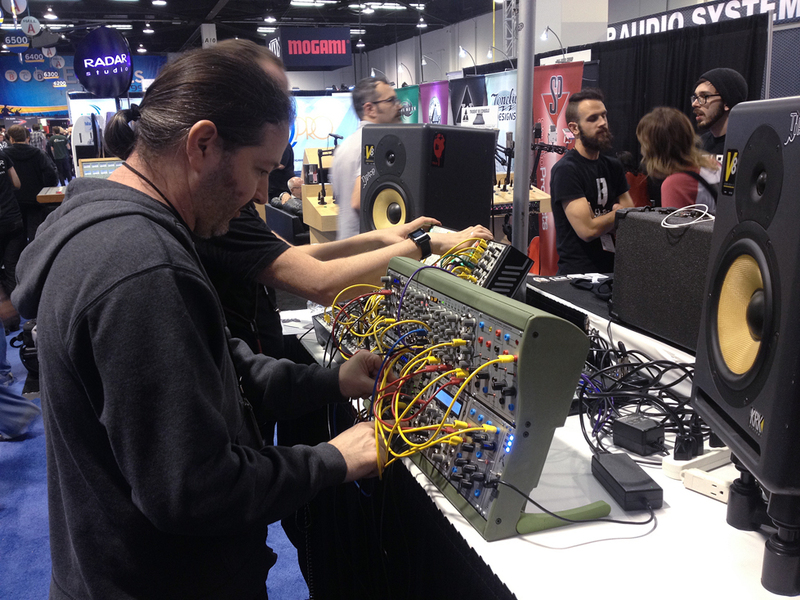 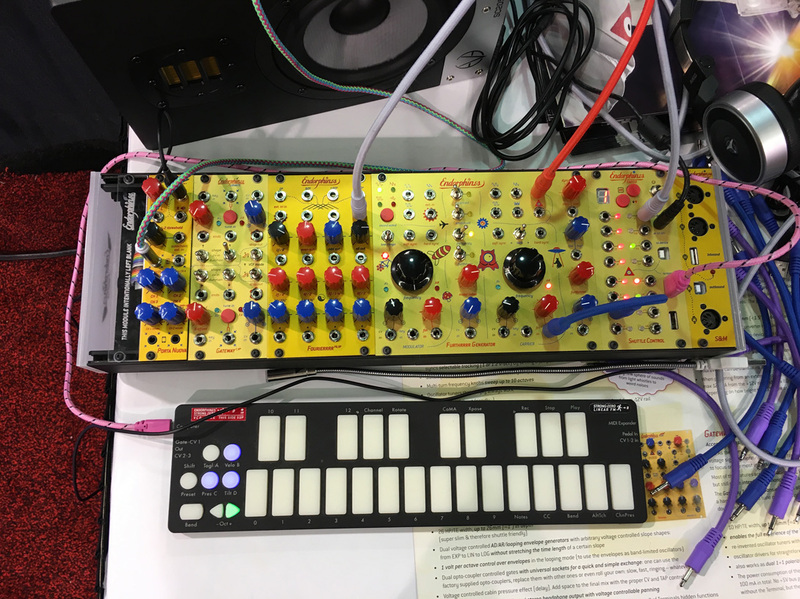 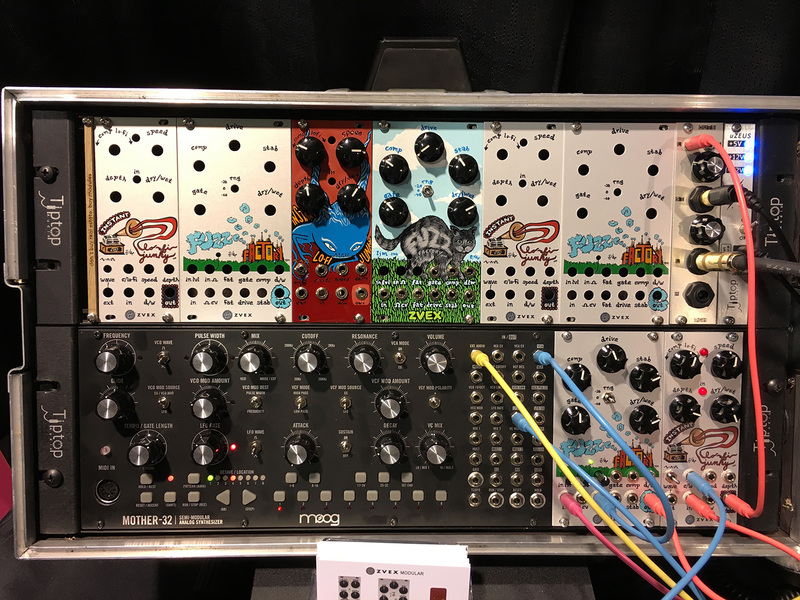 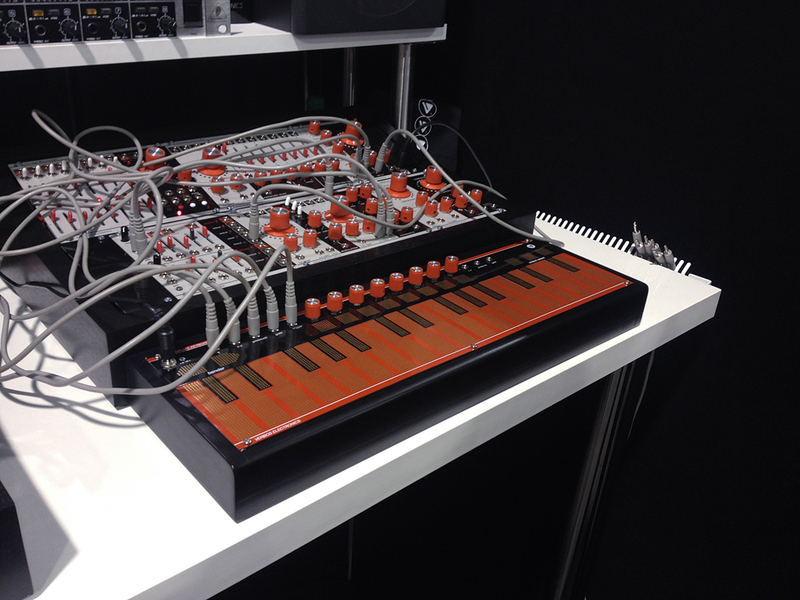 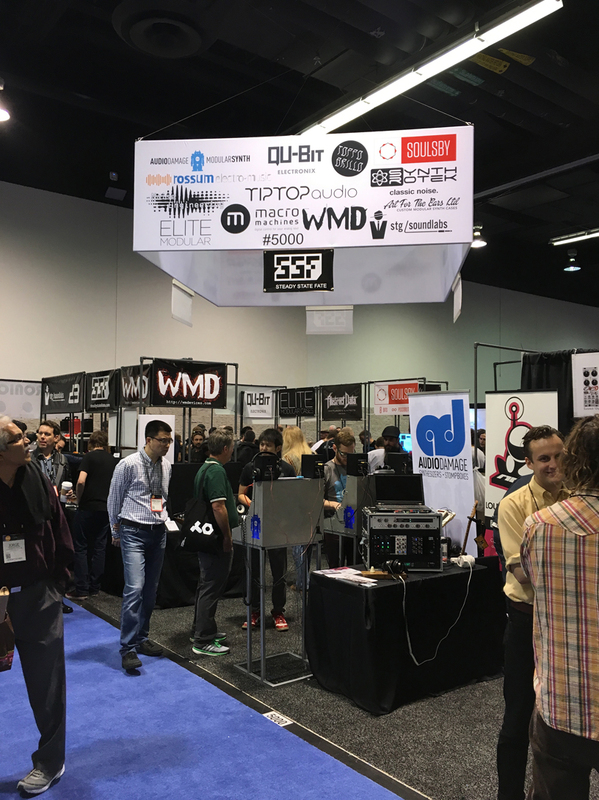 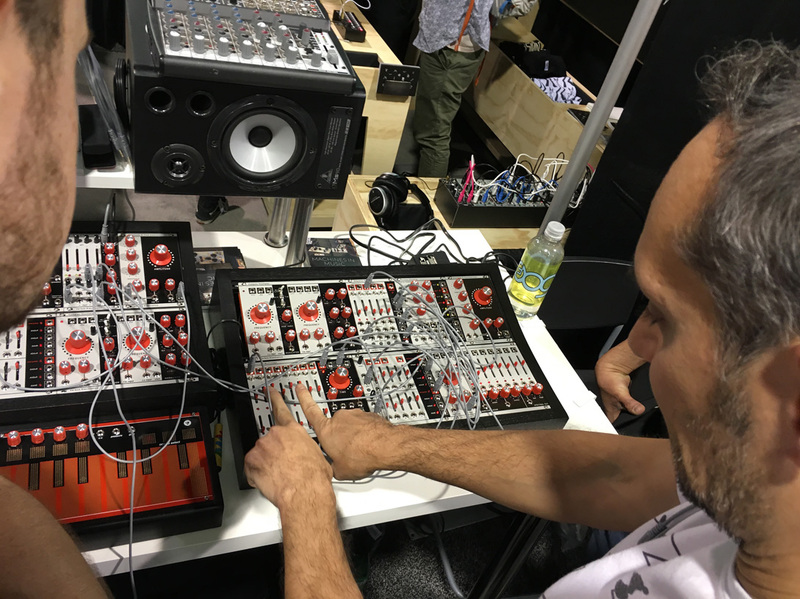 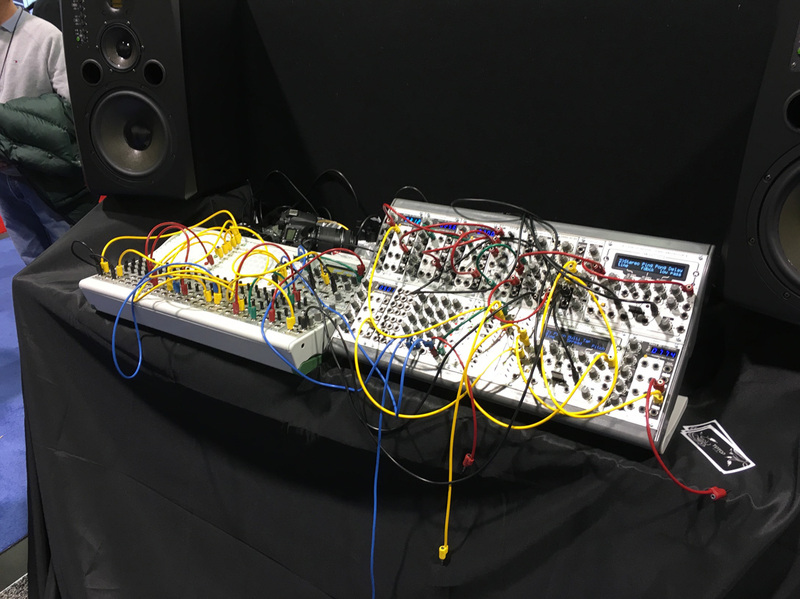 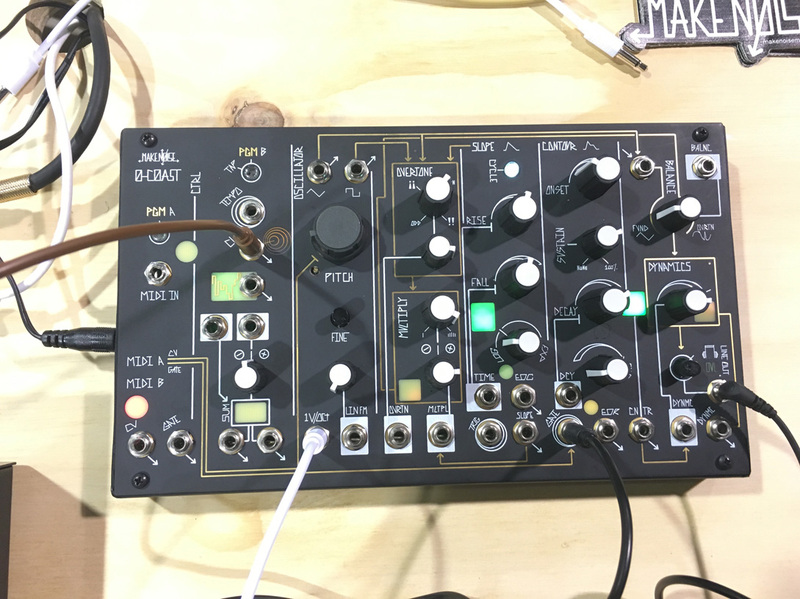 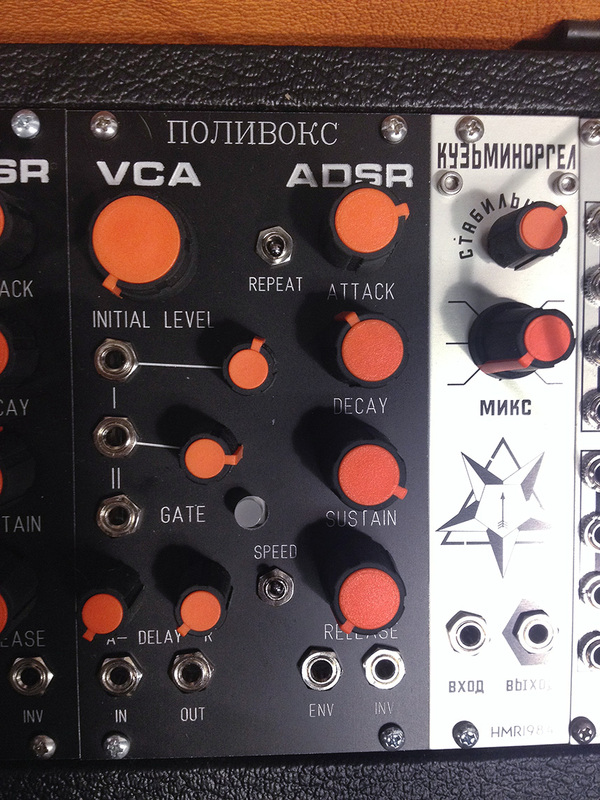 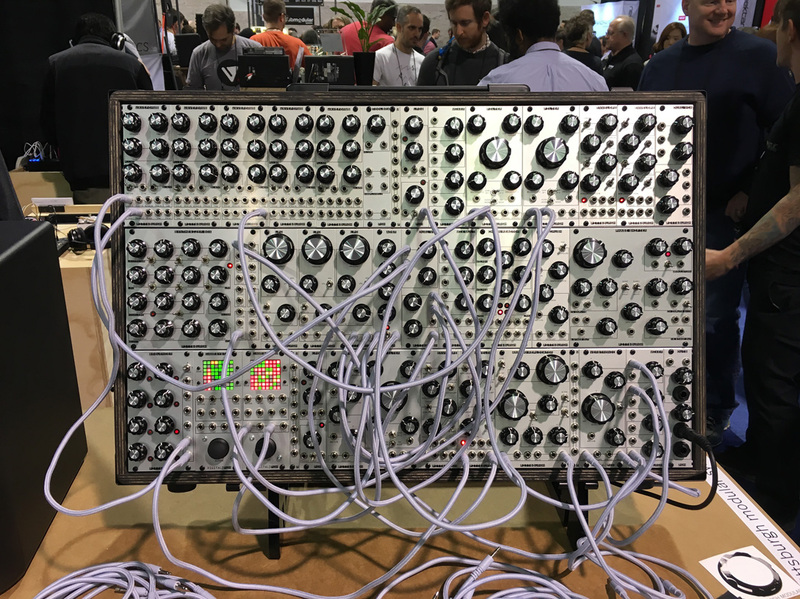 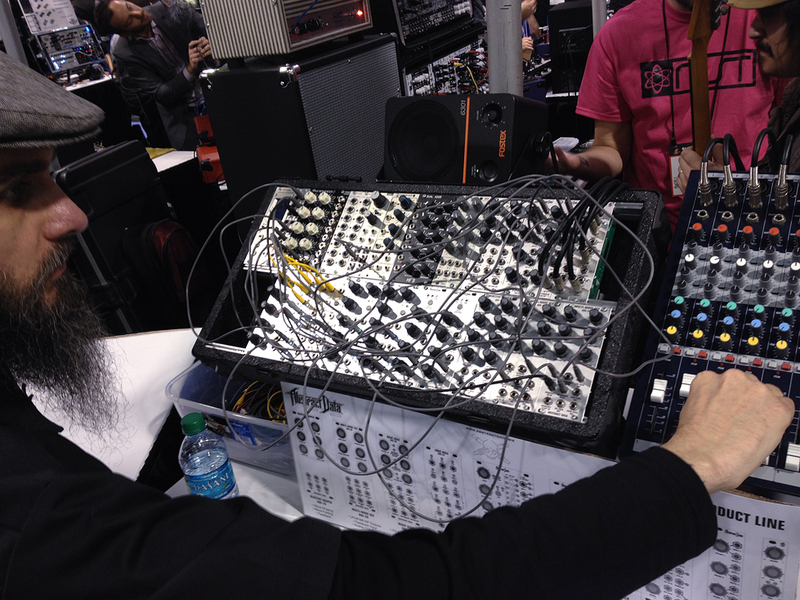 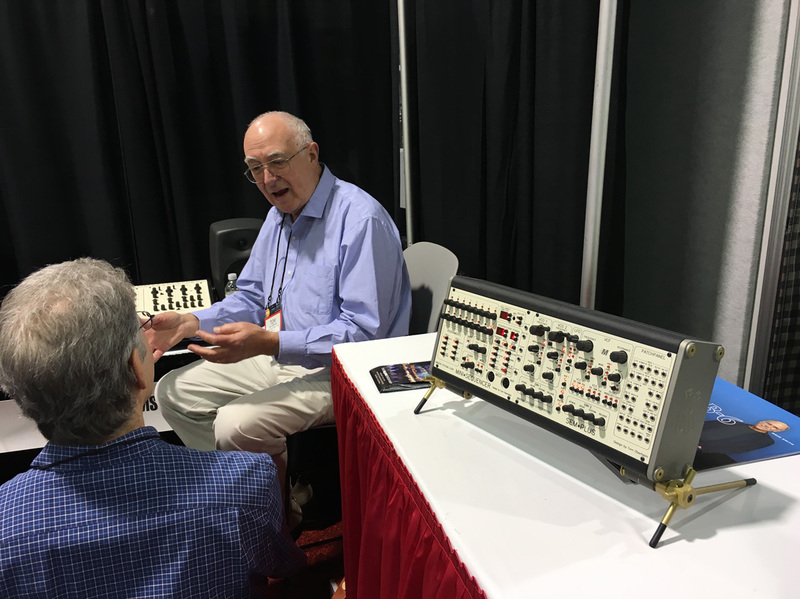 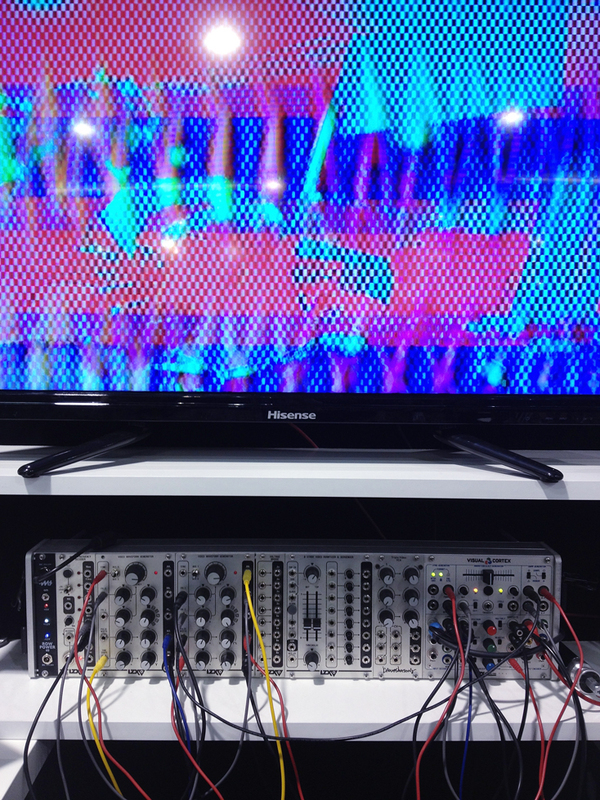 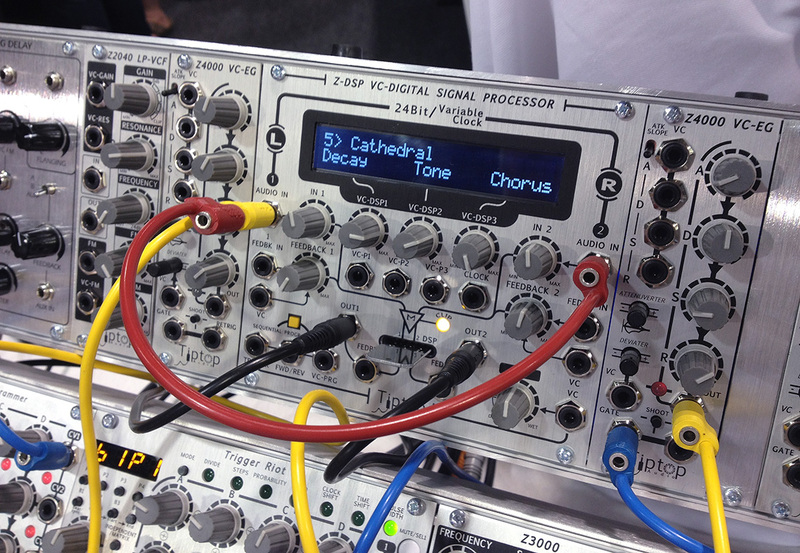 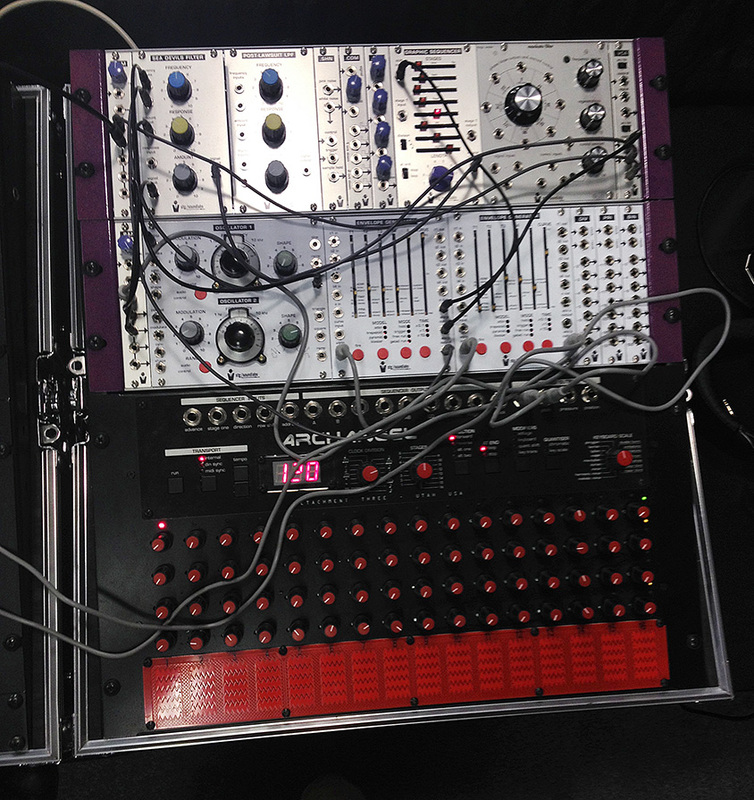 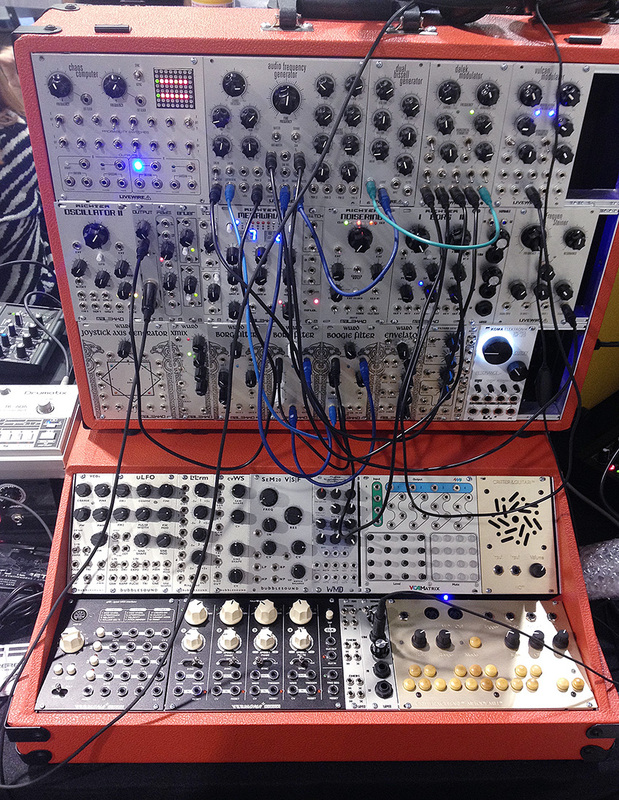 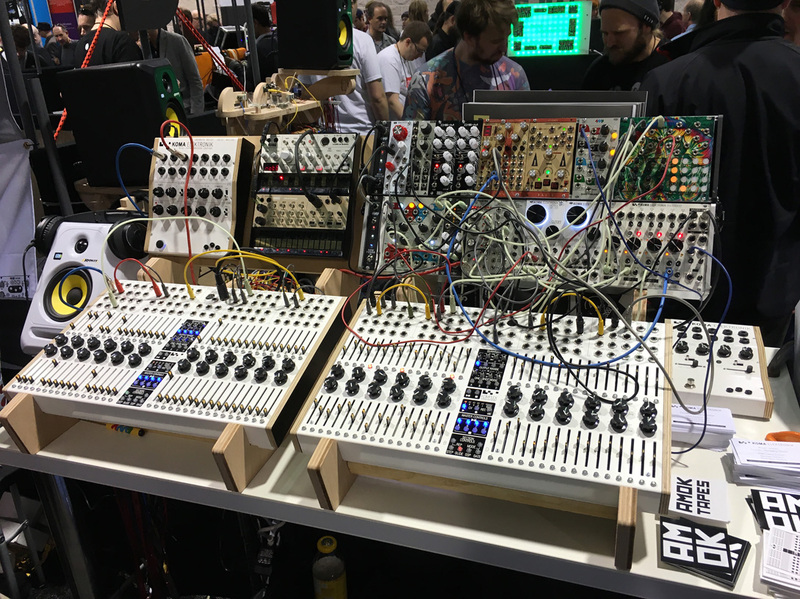 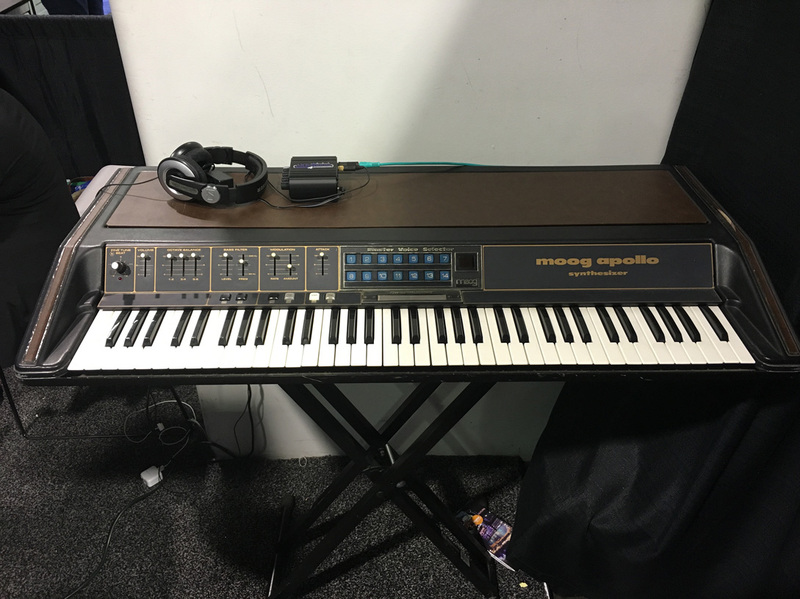 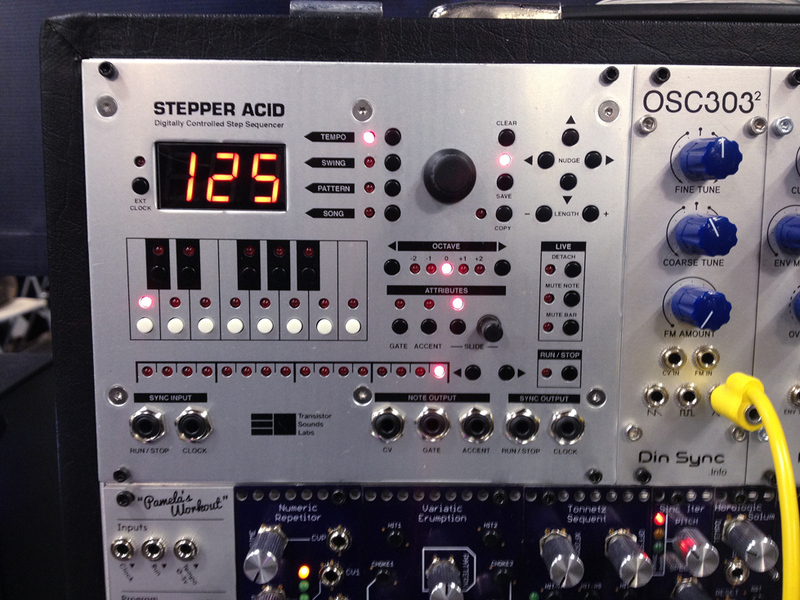 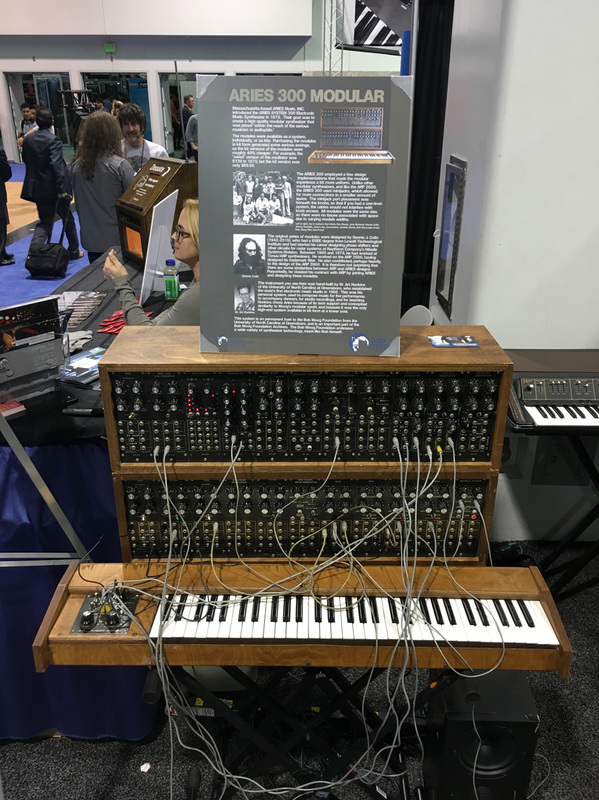 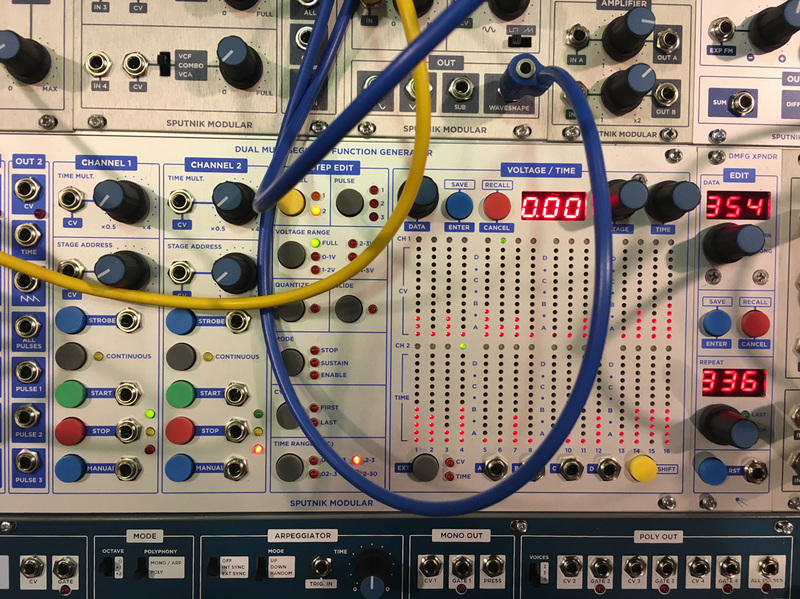 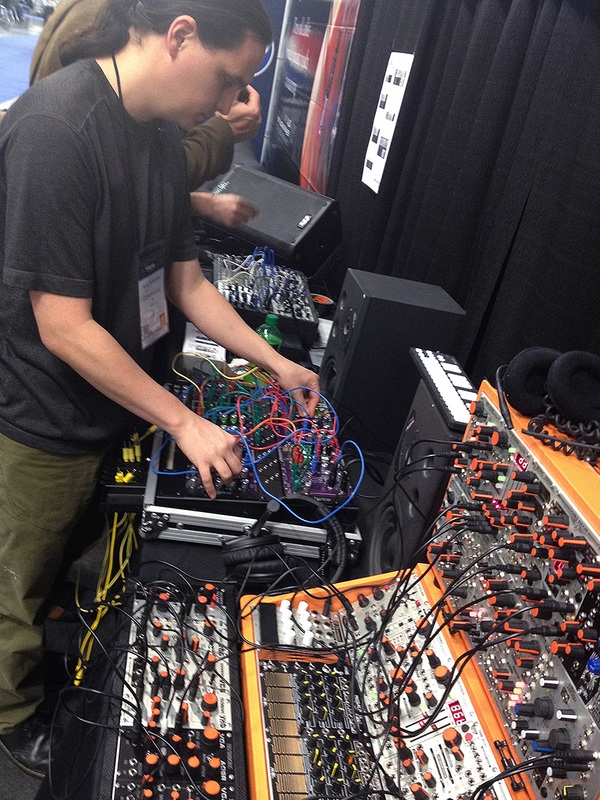 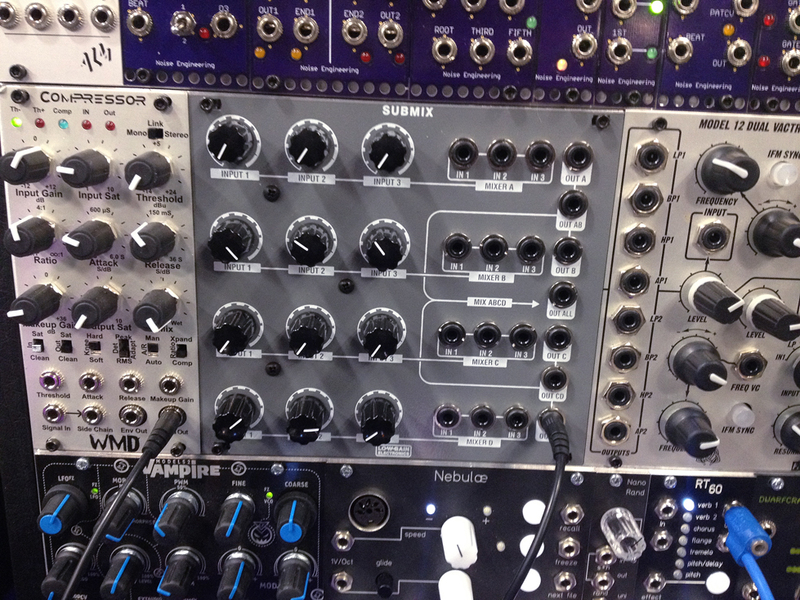 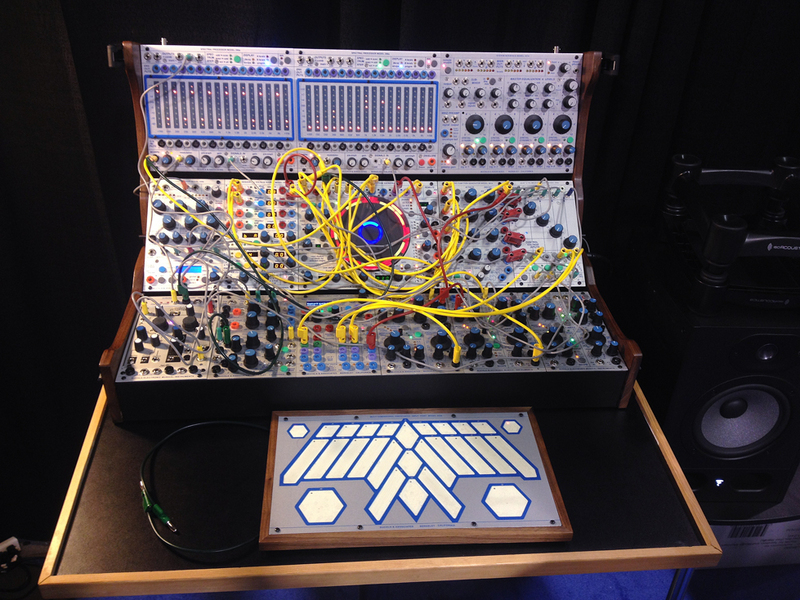 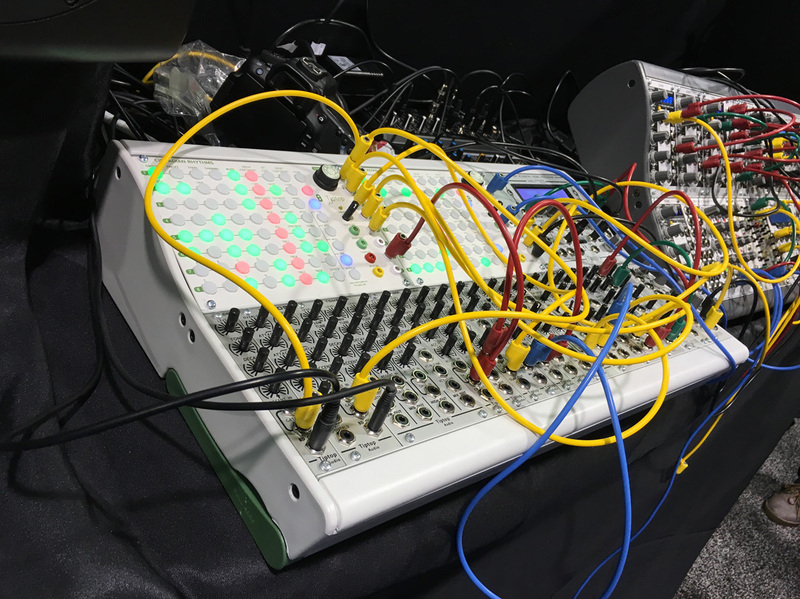 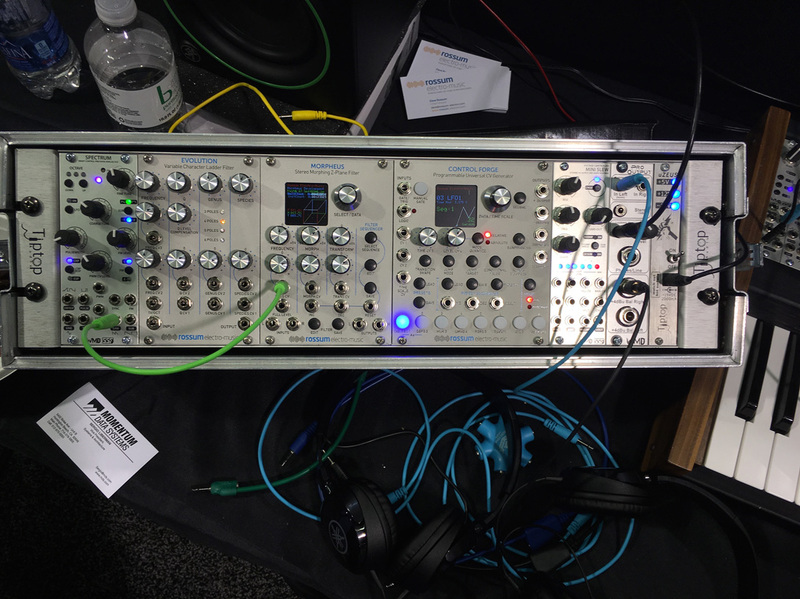 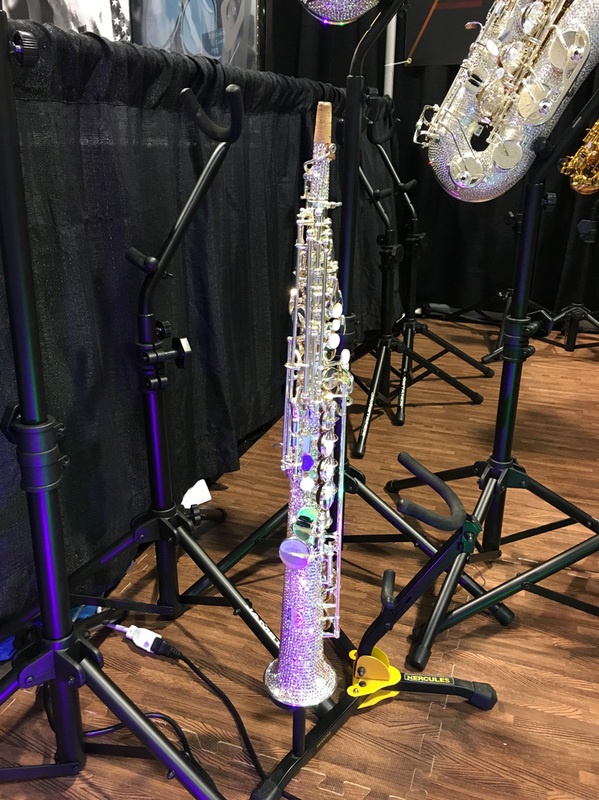 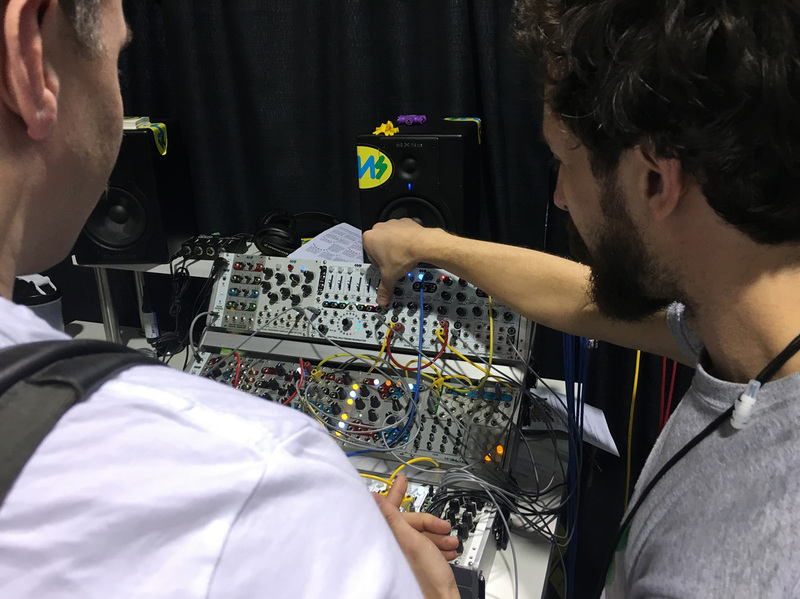 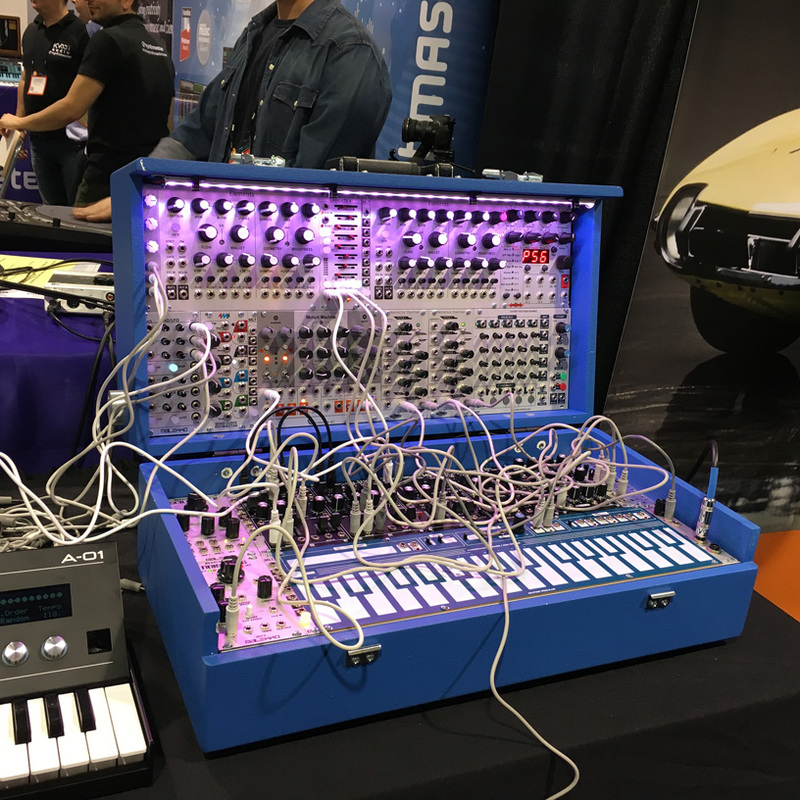 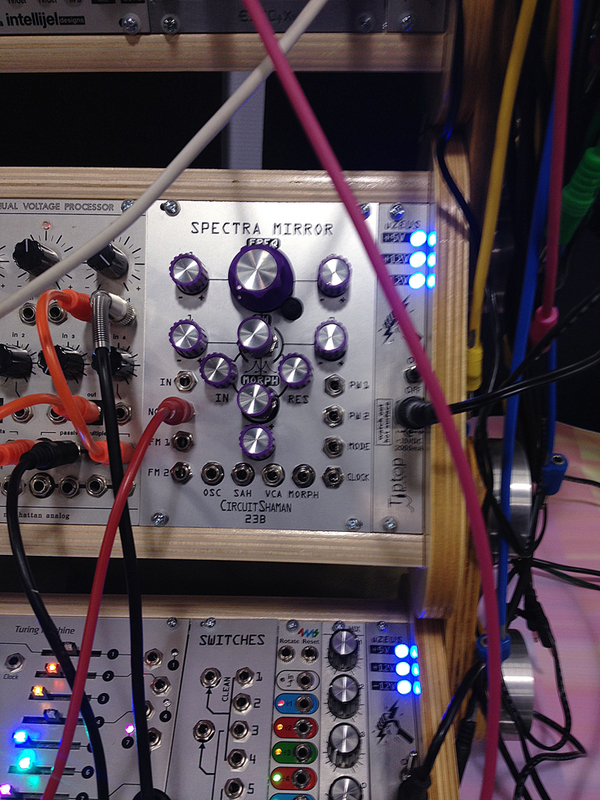 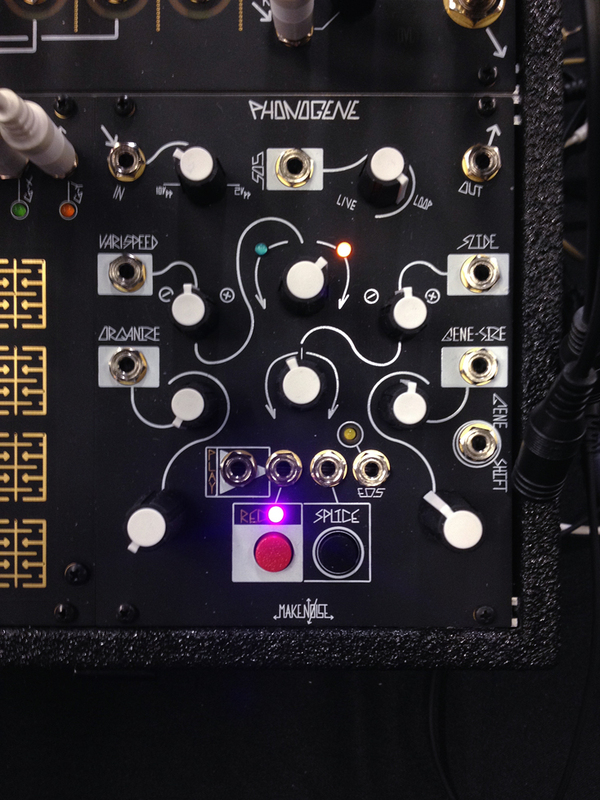 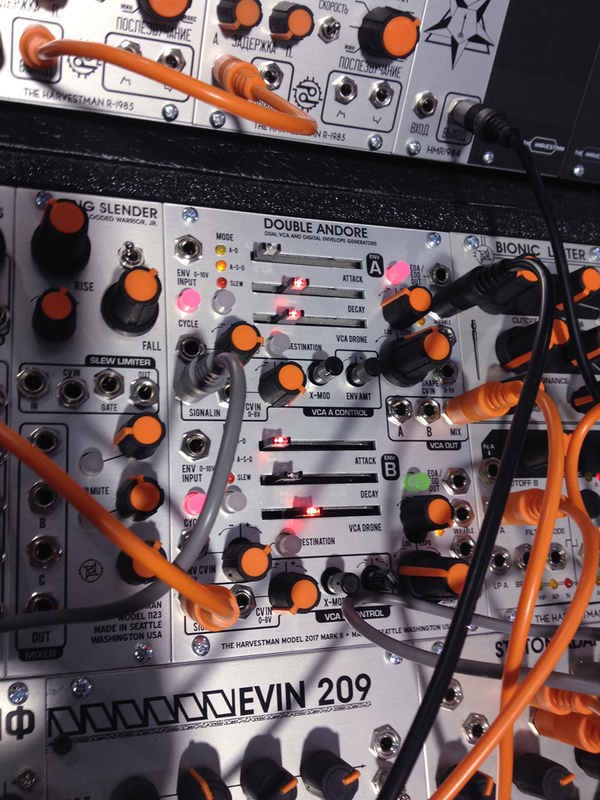 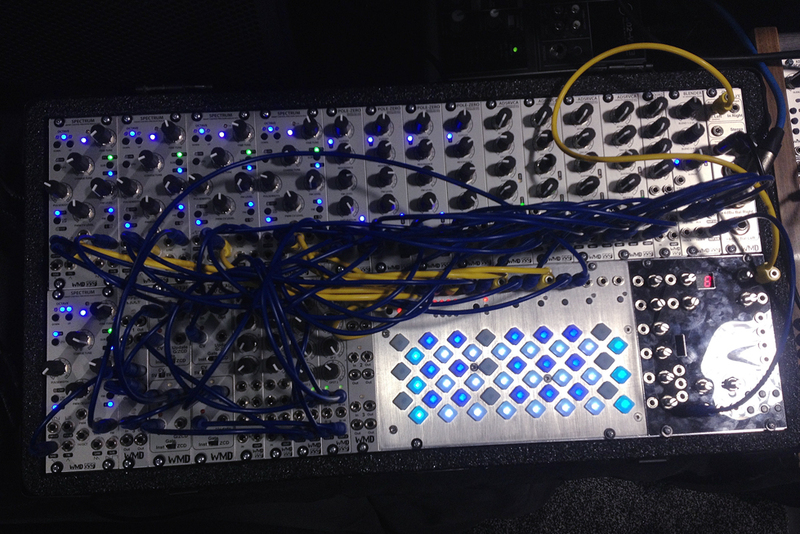 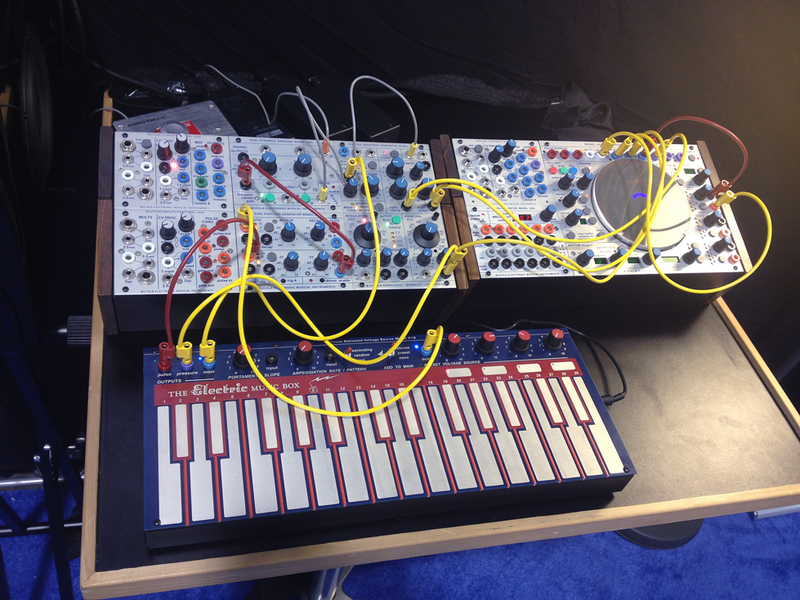 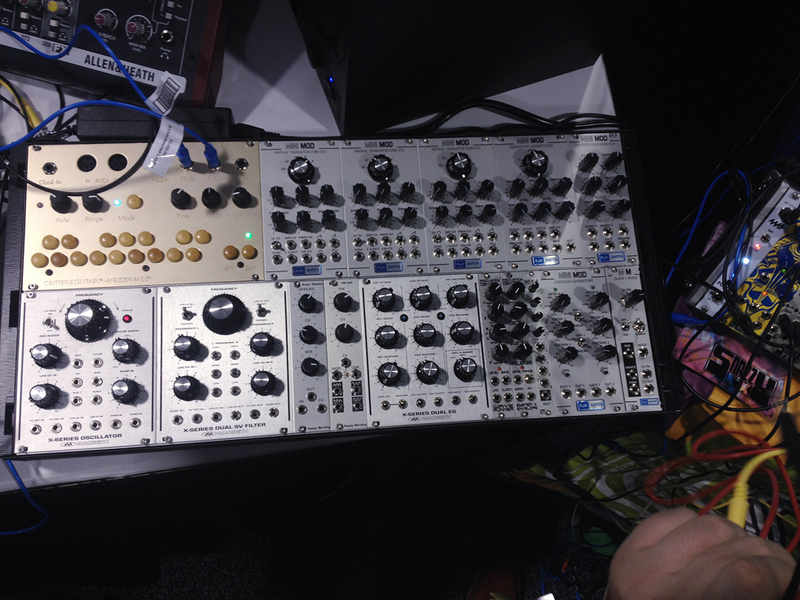 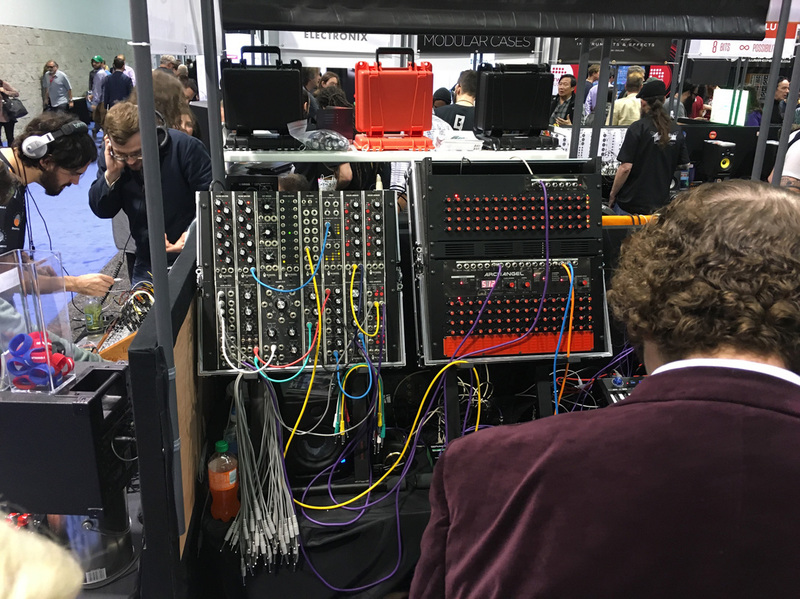 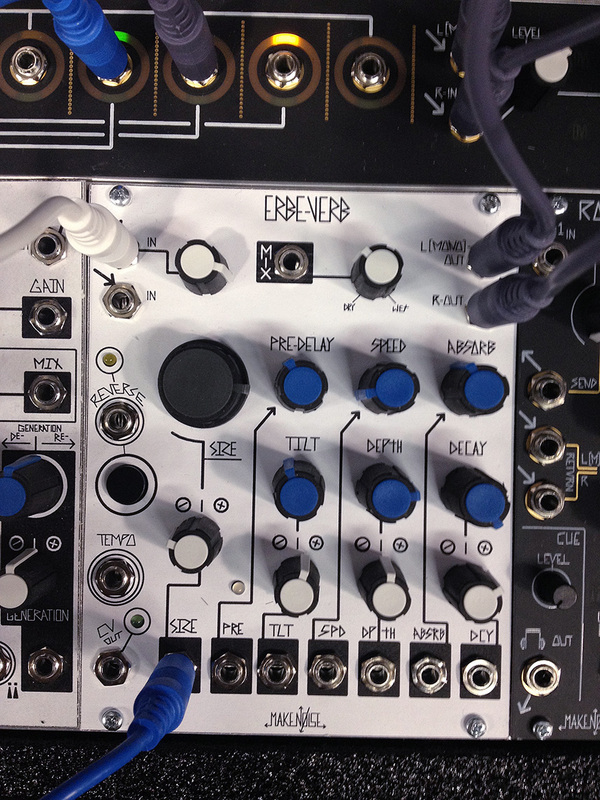 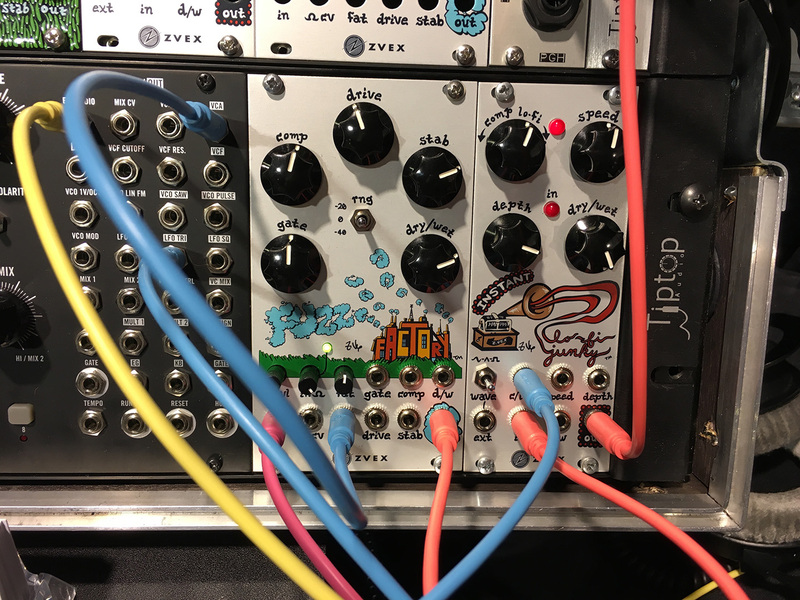 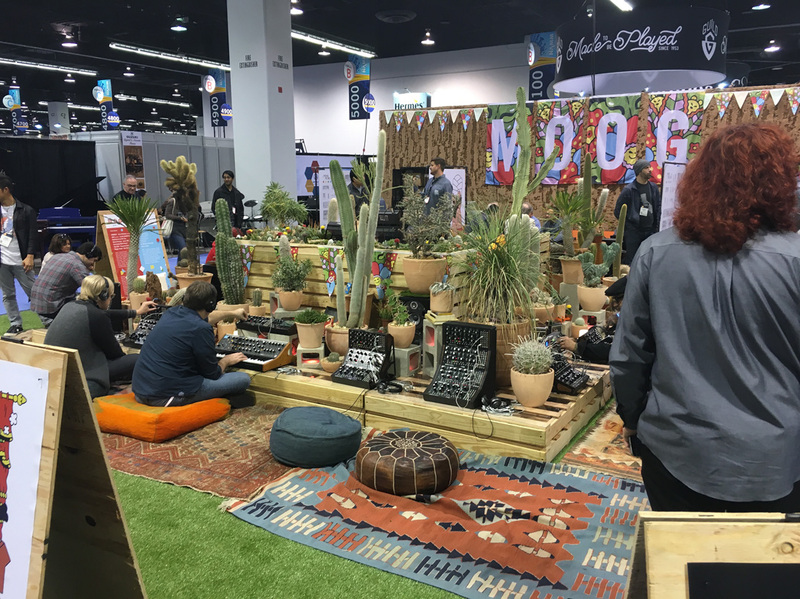 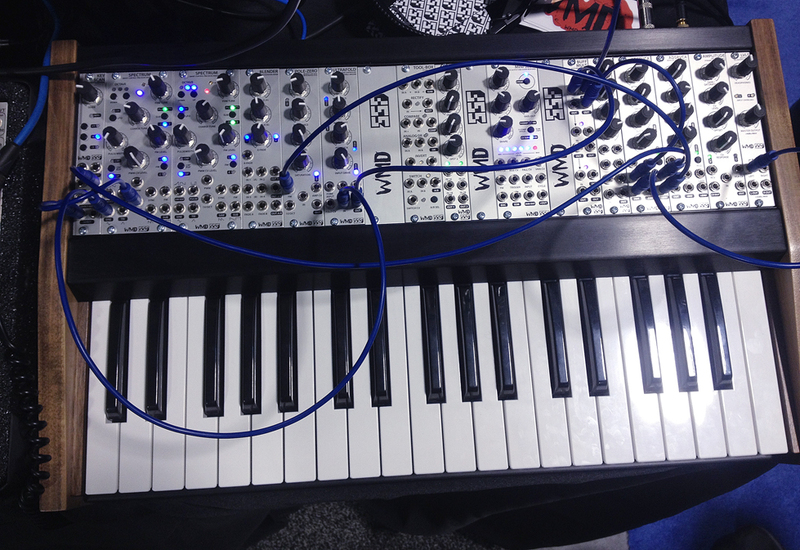 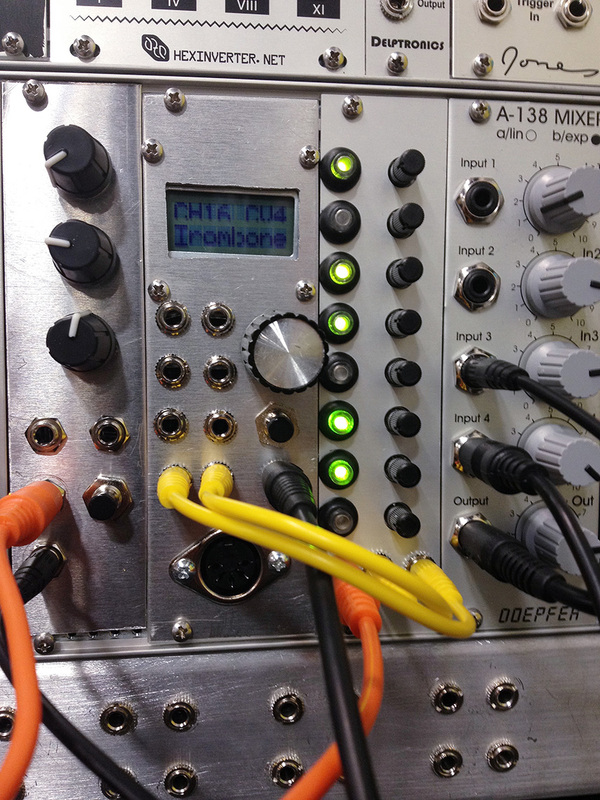 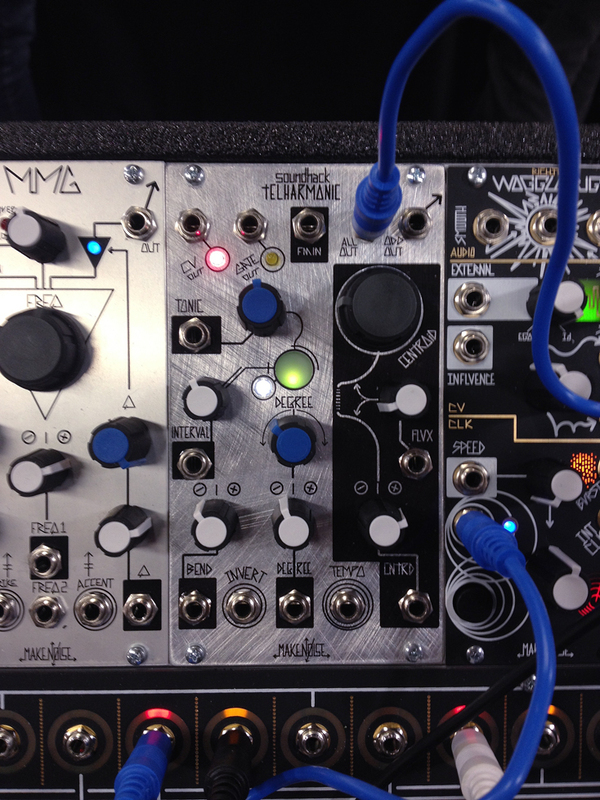 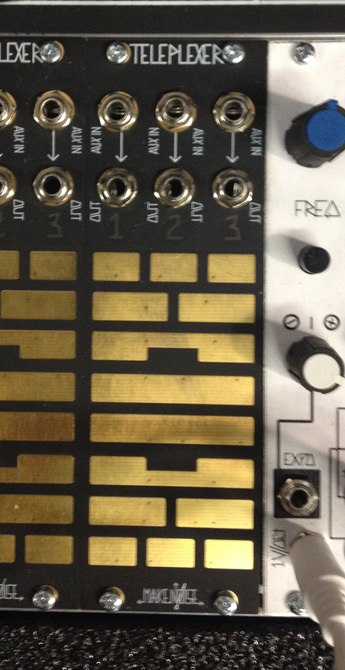 This post is NAMM through my narrow lens of interest, mainly modular synthesizers, and is not meant to be comprehensive, so sit back and enjoy the ride without the incredible sonic wall of noise that pervades the convention. 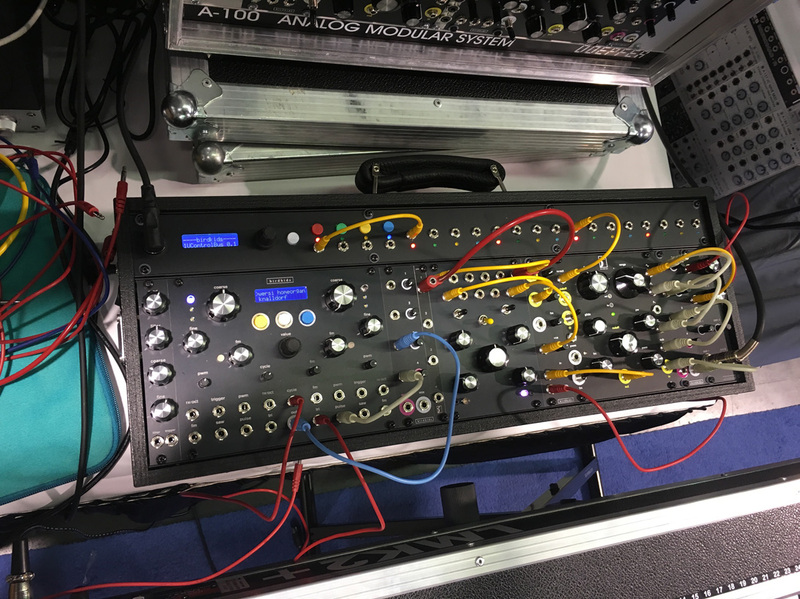 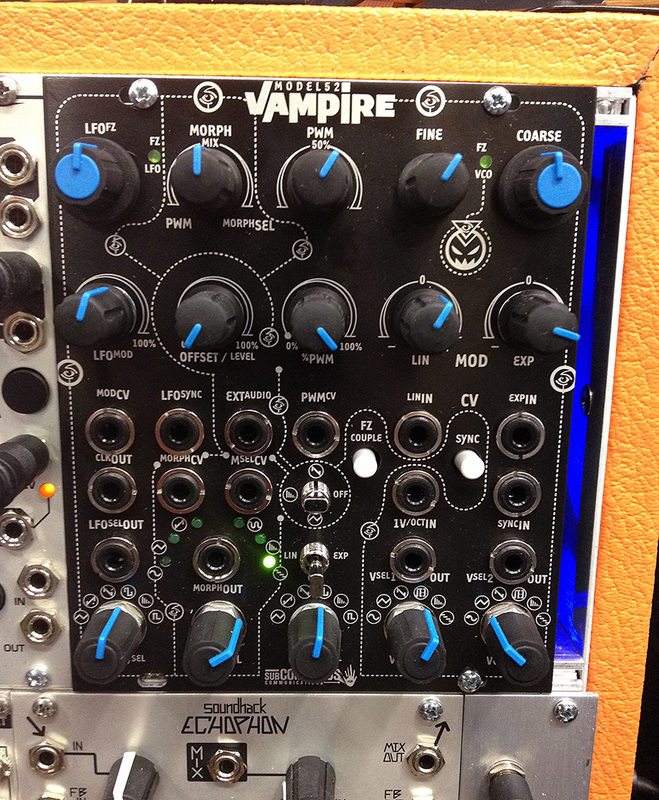 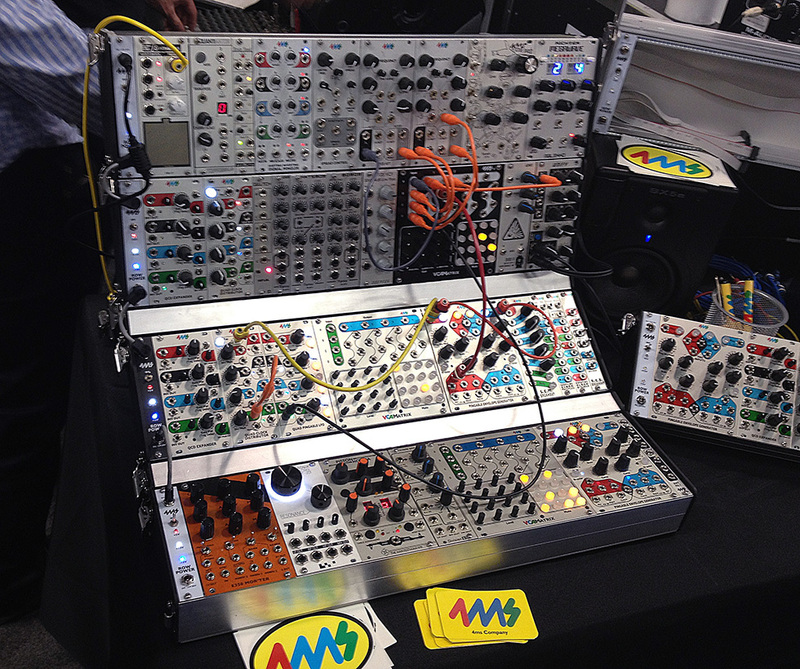 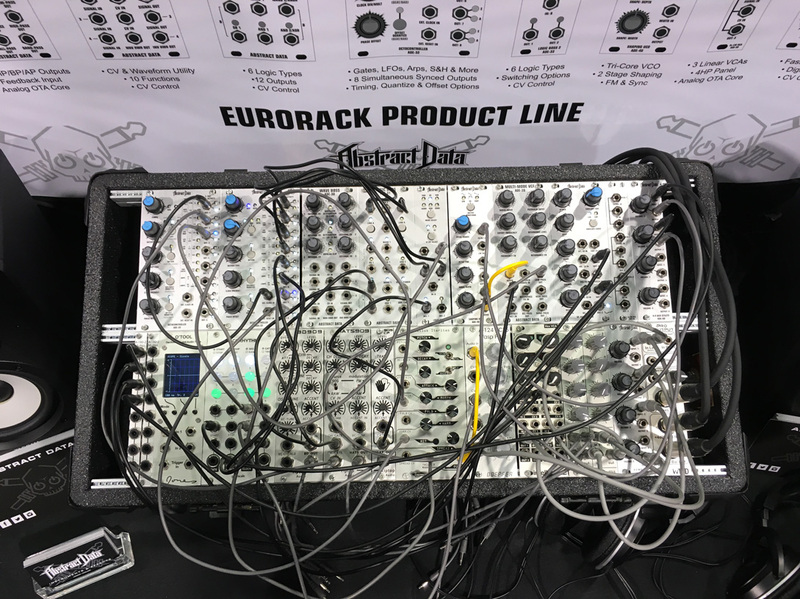 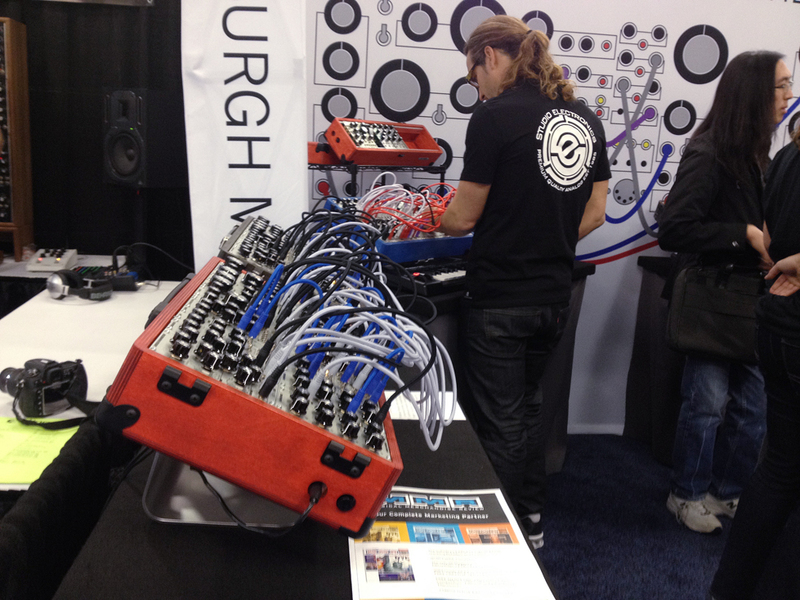 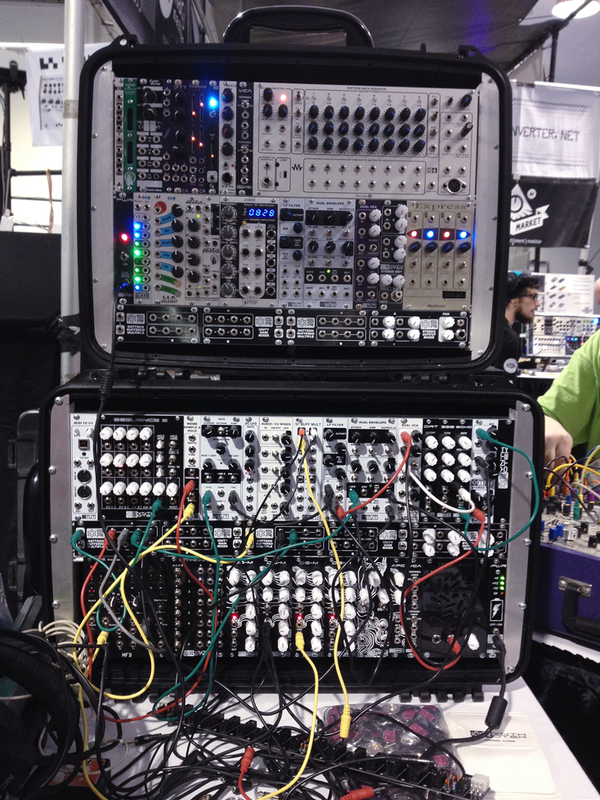 First stop is the Eurorack modular booth hosted by WMD in Hall E.
This showed up later in the day (a SubCon Vampire in The Harvestman’s case). 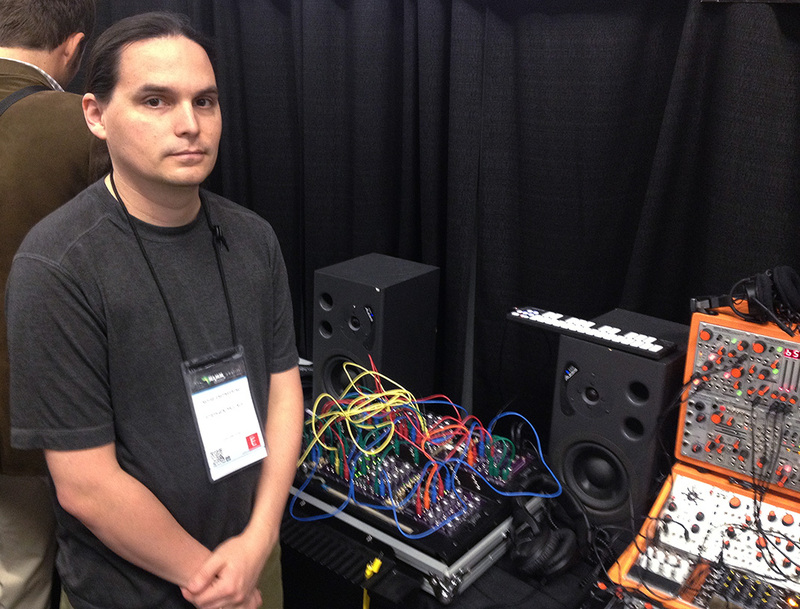 Stephen and the Noise Engineering collection. 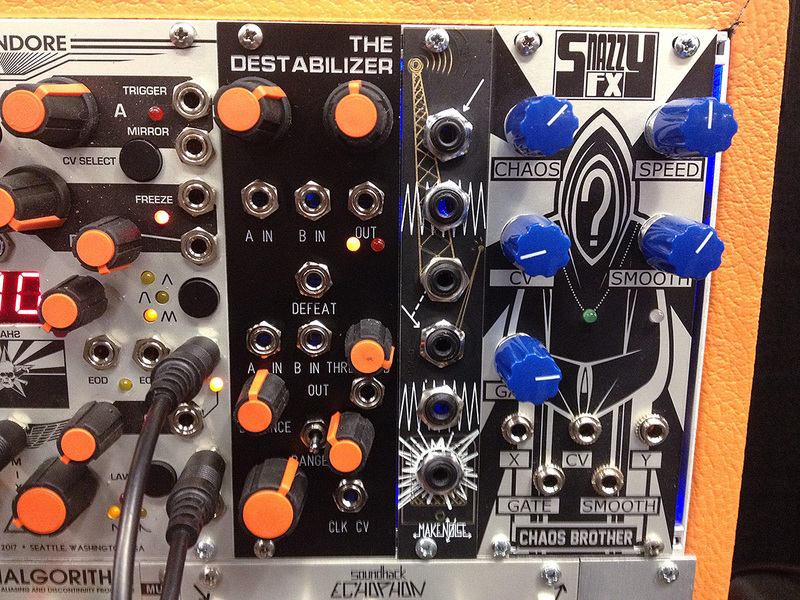 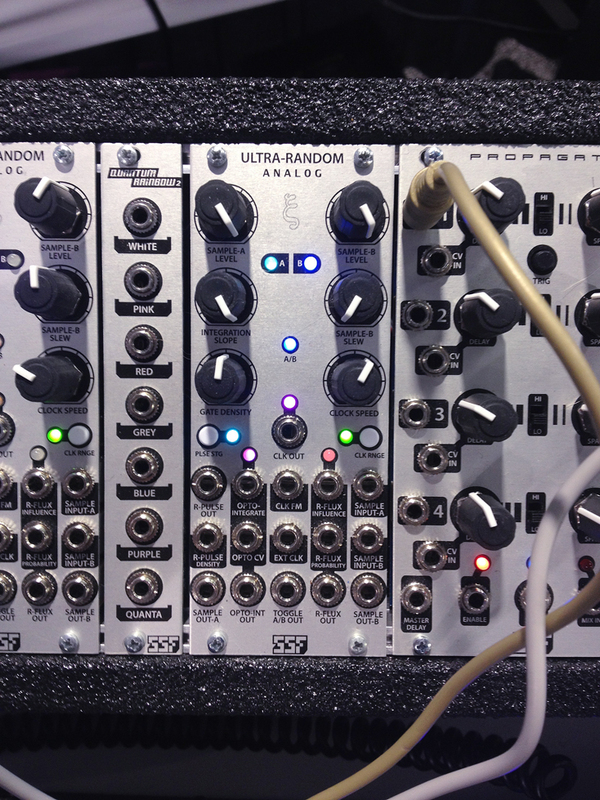 The Ataraxic Translatron in 2 flavors (just different faceplates) and an amazing kick drum module. 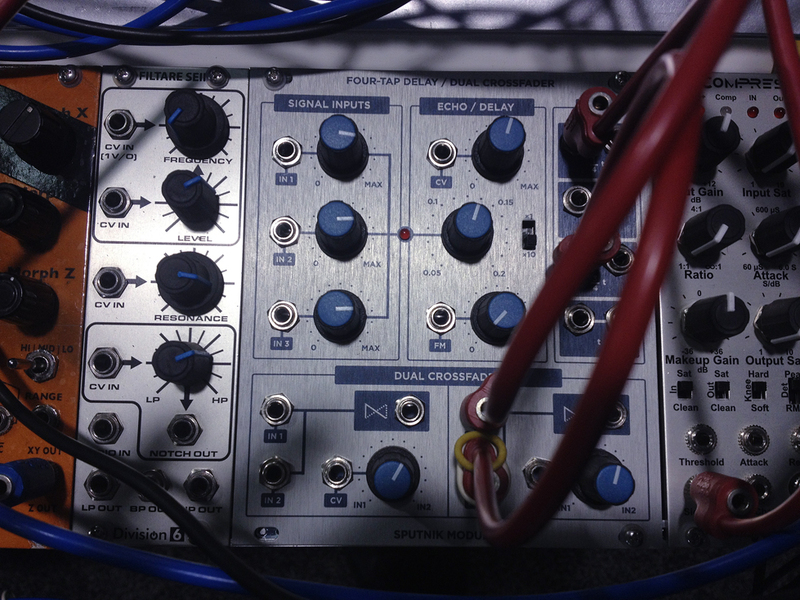 A new oscillator and a new filter. 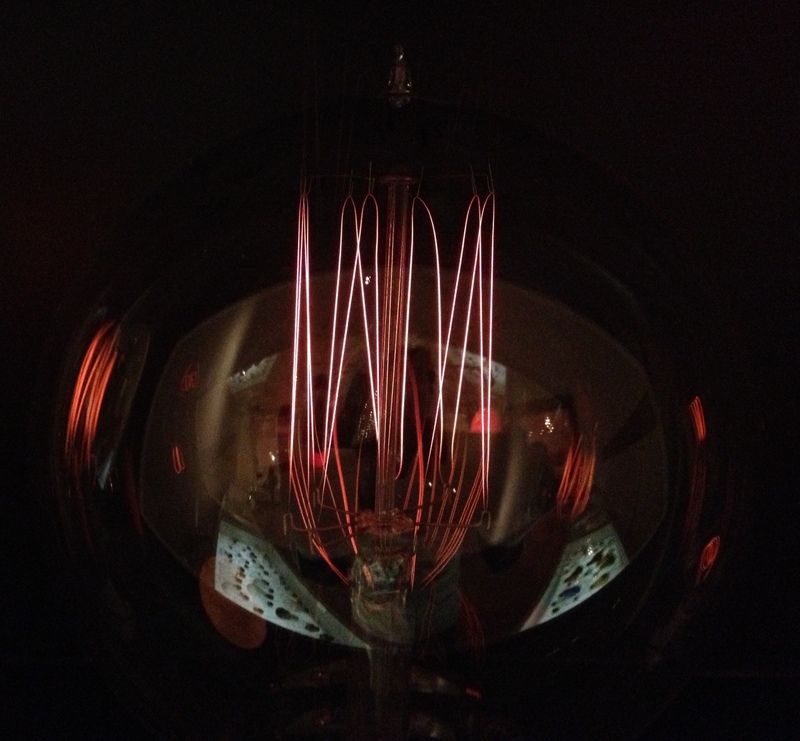 Also a rectifier and divider, which can do far more to a sound than I had imagined. 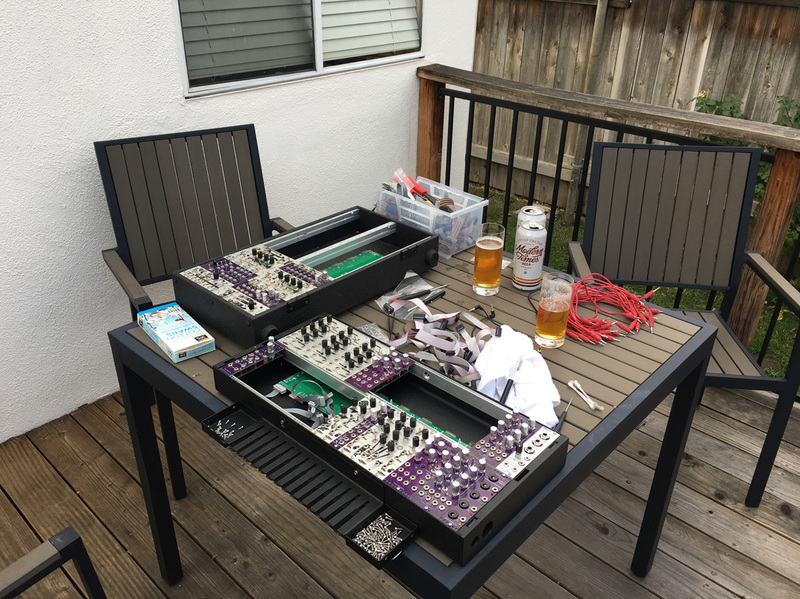 A new gate sequencer and a new mixer on the bottom. 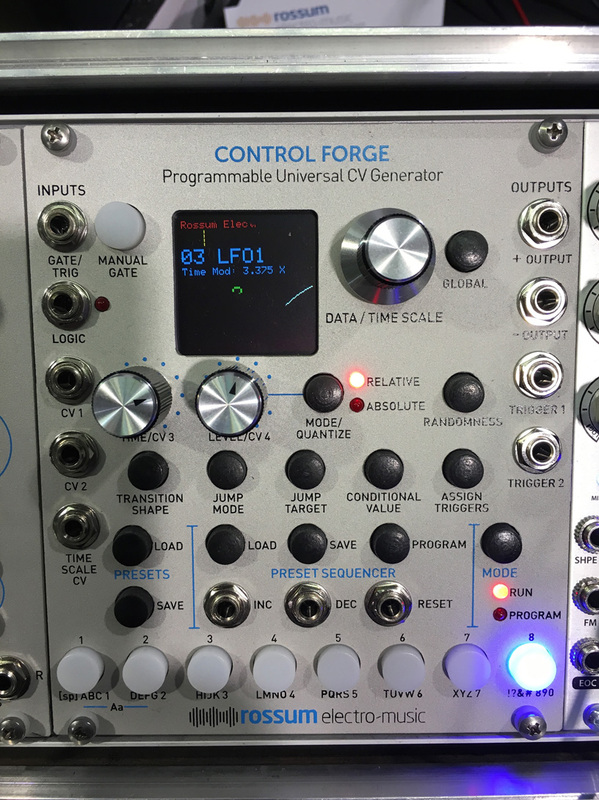 A super unique rhythm generator is in there as well. 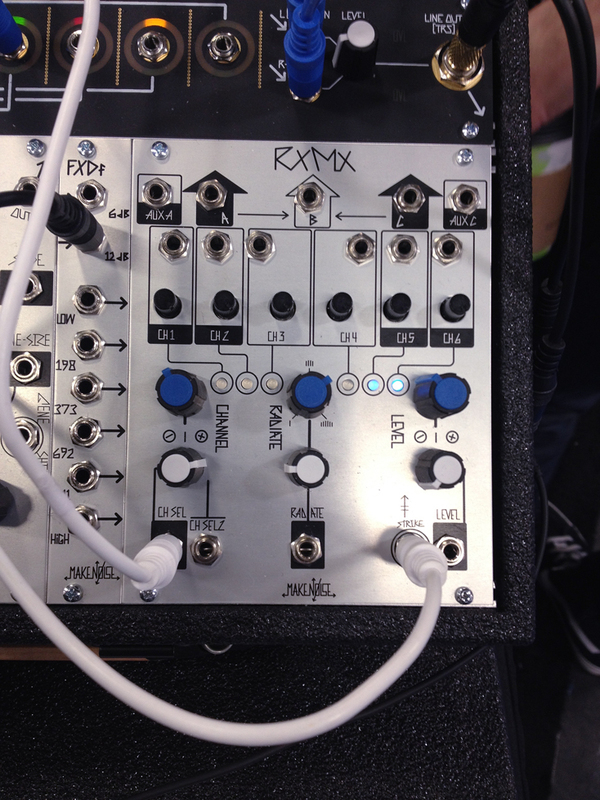 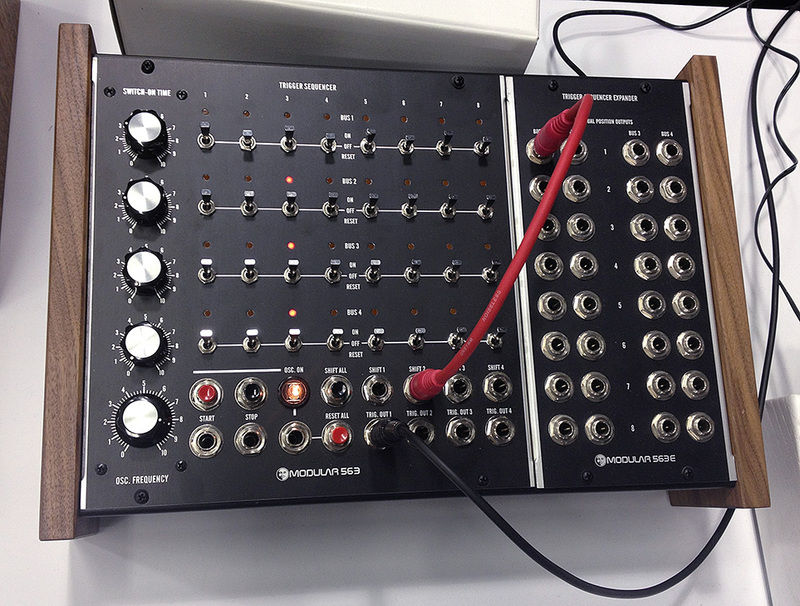 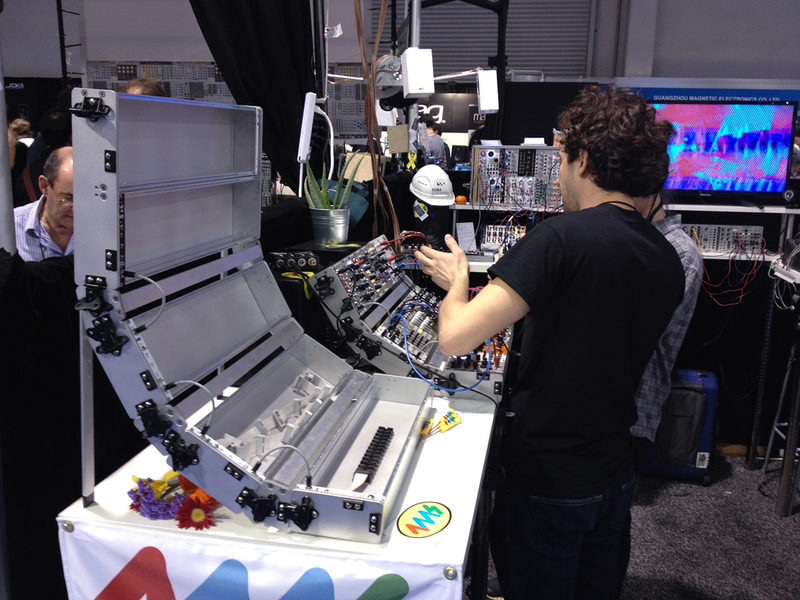 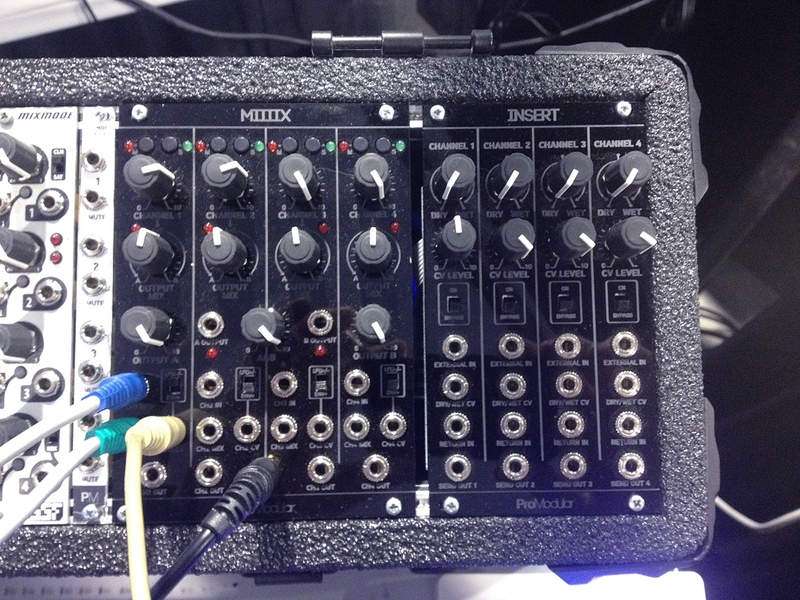 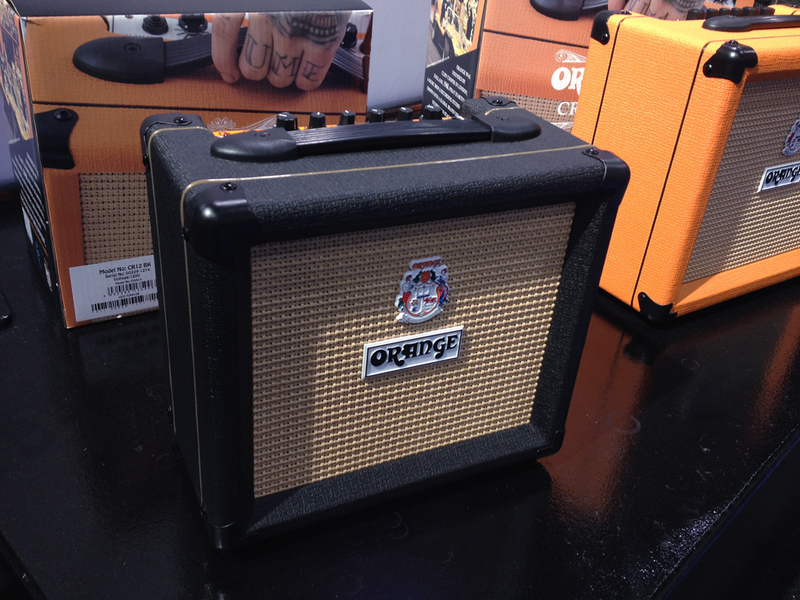 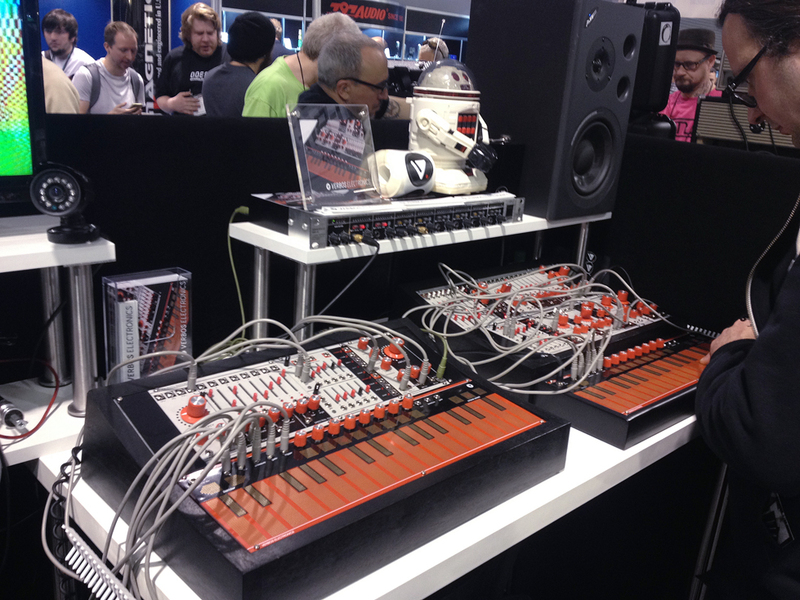 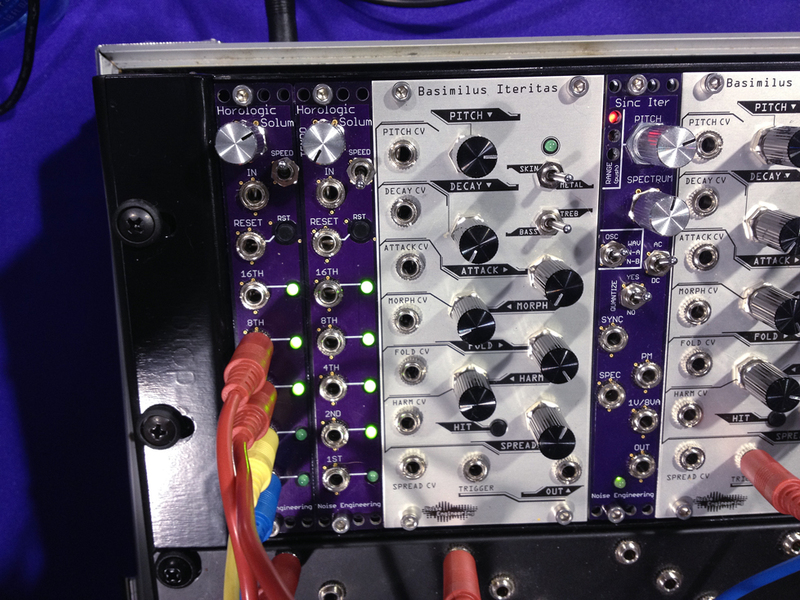 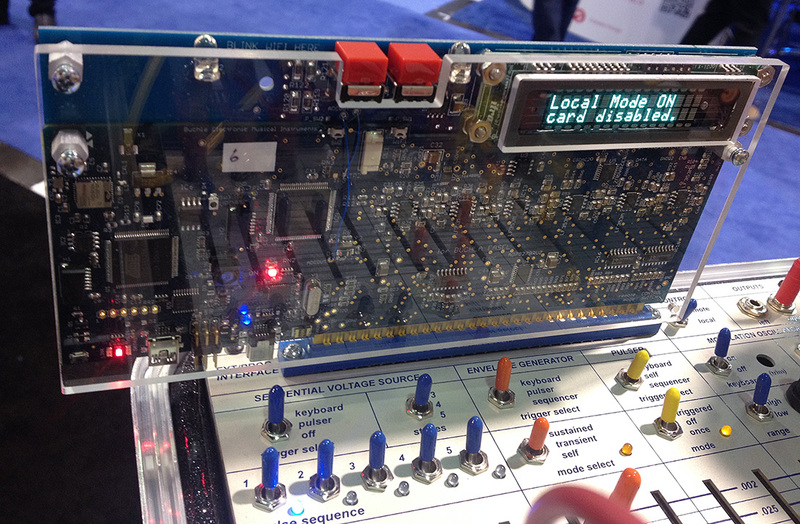 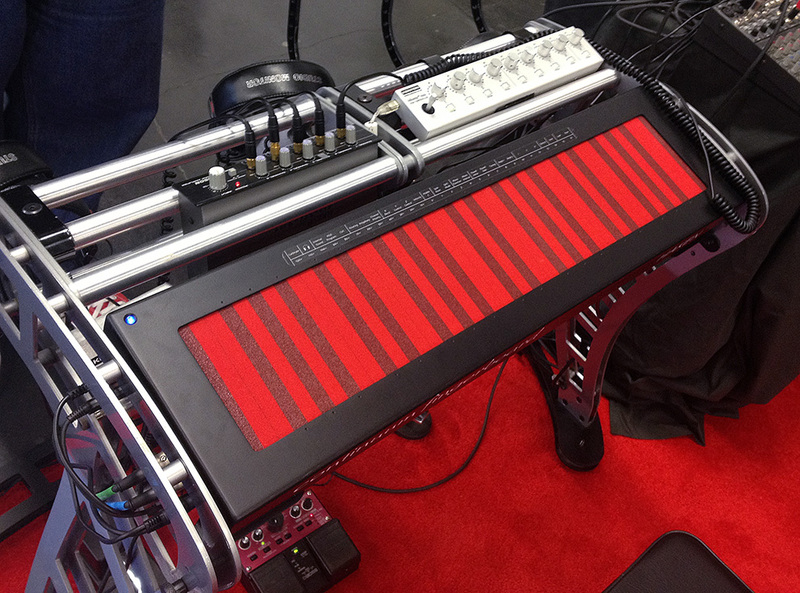 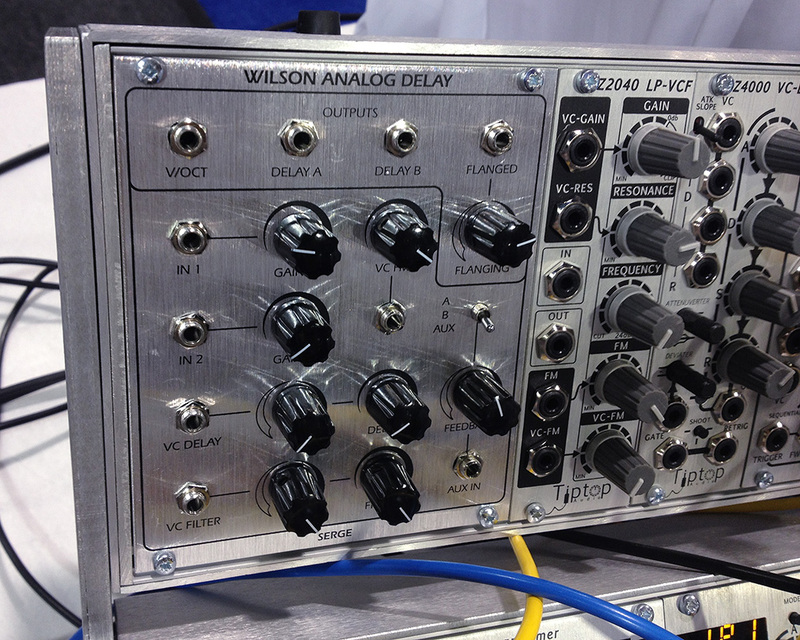 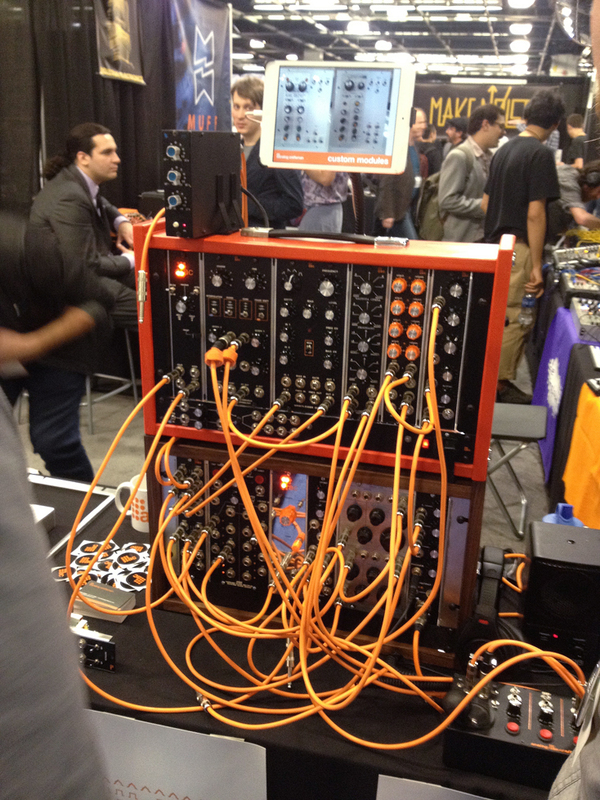 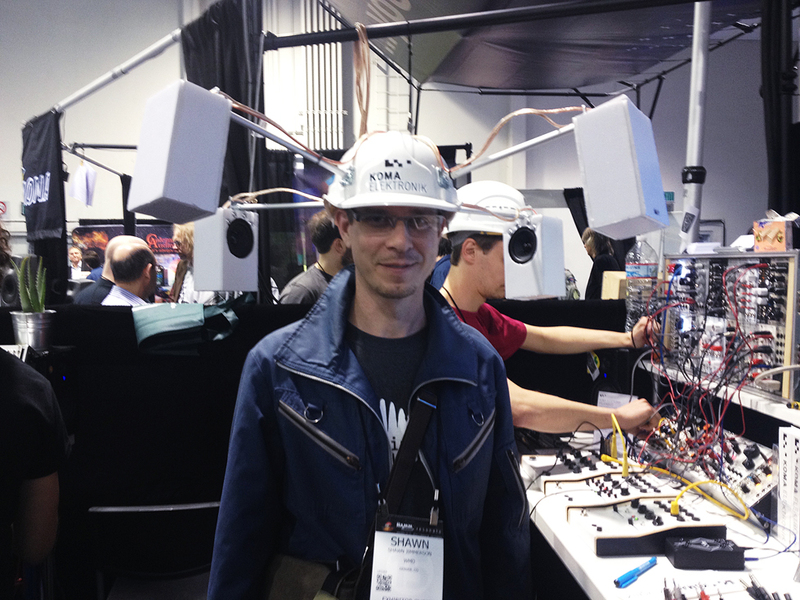 One of the 2 Make Noise systems at NAMM. 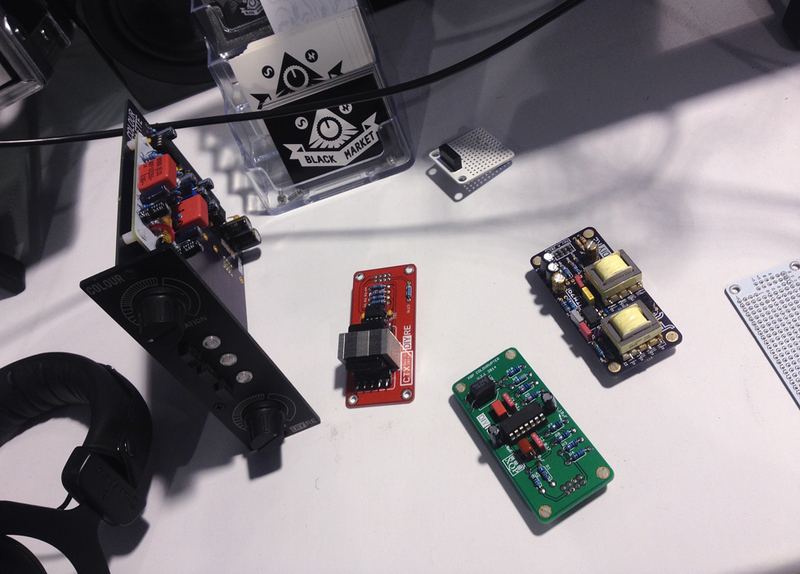 These are the 2 new control modules which add preset-like functionality to modulars. 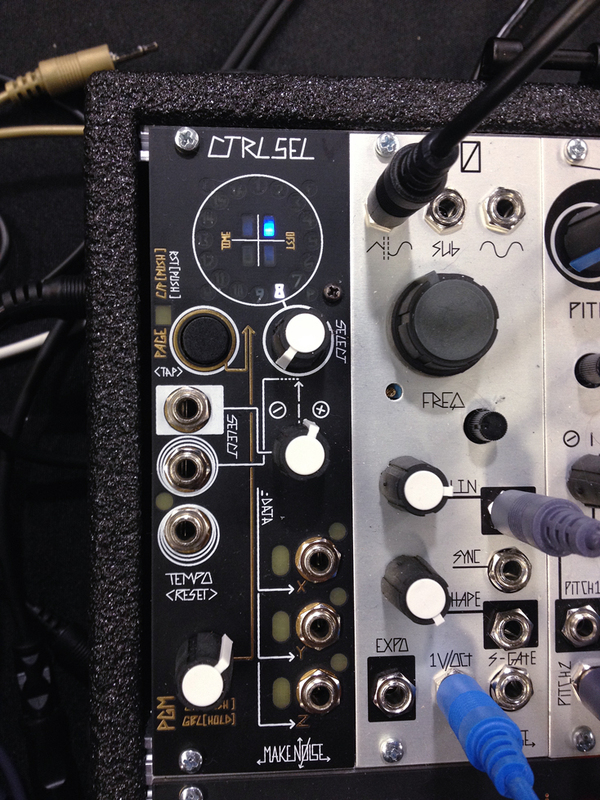 The CTRLSEL-G can be used to control one or more CTRLSEL-Vs to add precision to live performance situations. 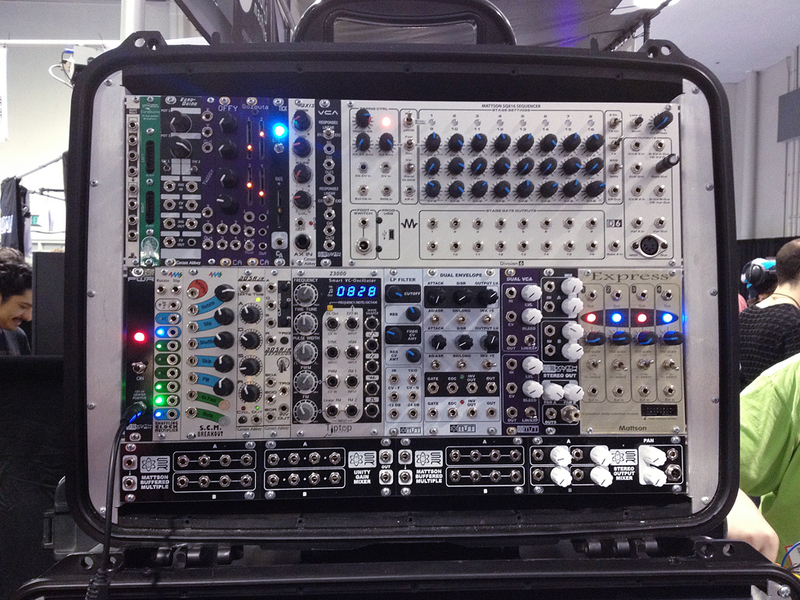 They communicate via the power bus, or a cable if in different cases. 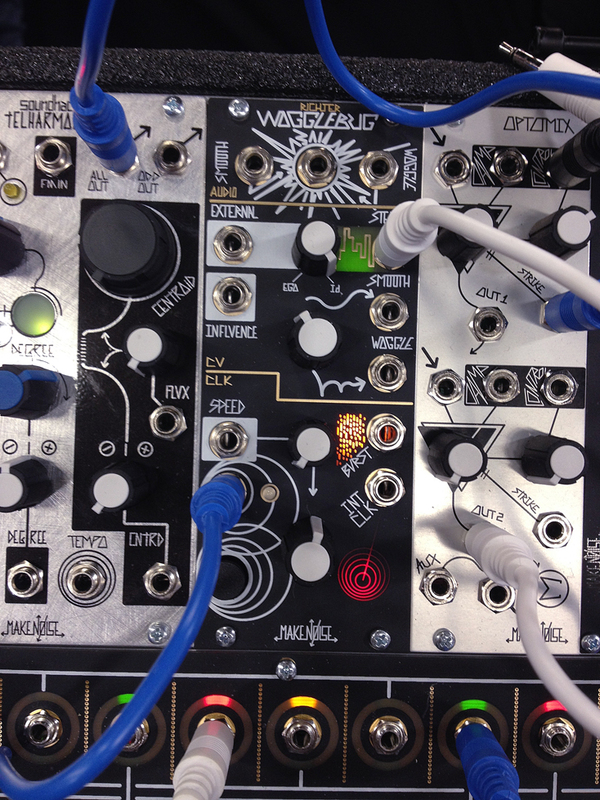 The Teleplexer is an unexpected offering. 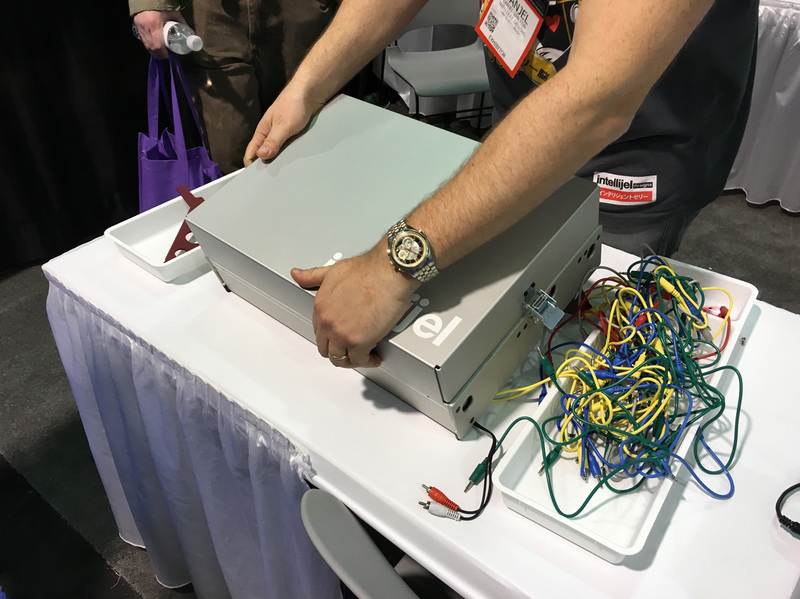 It works like this: you take a cable coming from a CV source and if you touch the tip to one of the plates, the voltage is sent to the corresponding output(s). 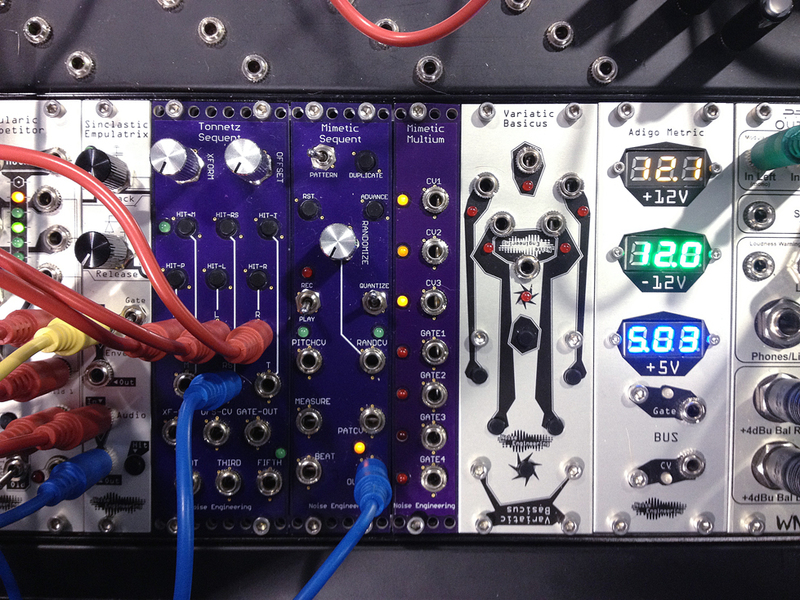 The plates are set up so the top row of three route the voltages out of outputs one, two or three, respectively. 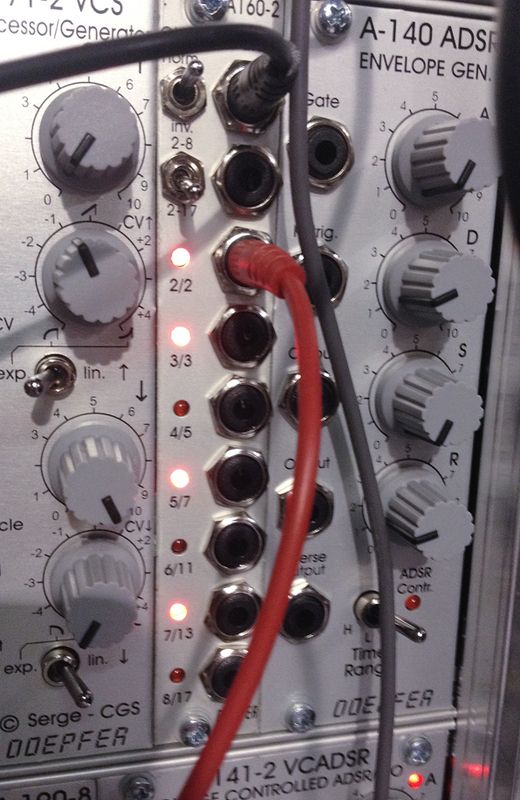 The second row sends the voltages to one and two, or two and three. 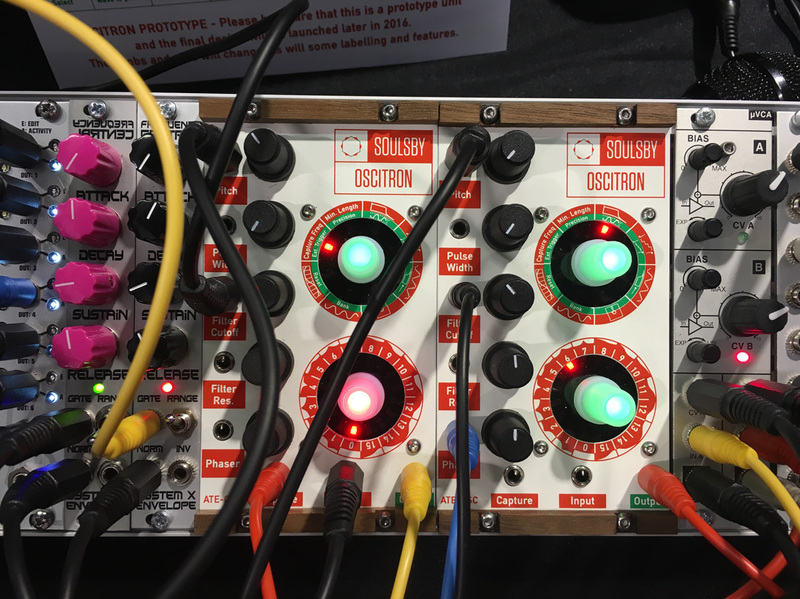 The third sends to just one and three, and the fourth is to all three. 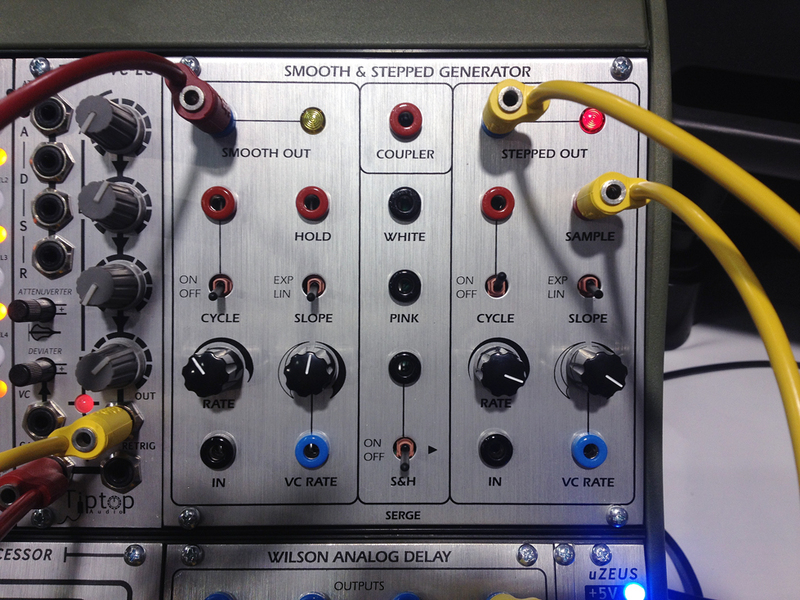 Below, the same scenario is repeated, but negative voltages are sent to those destinations. 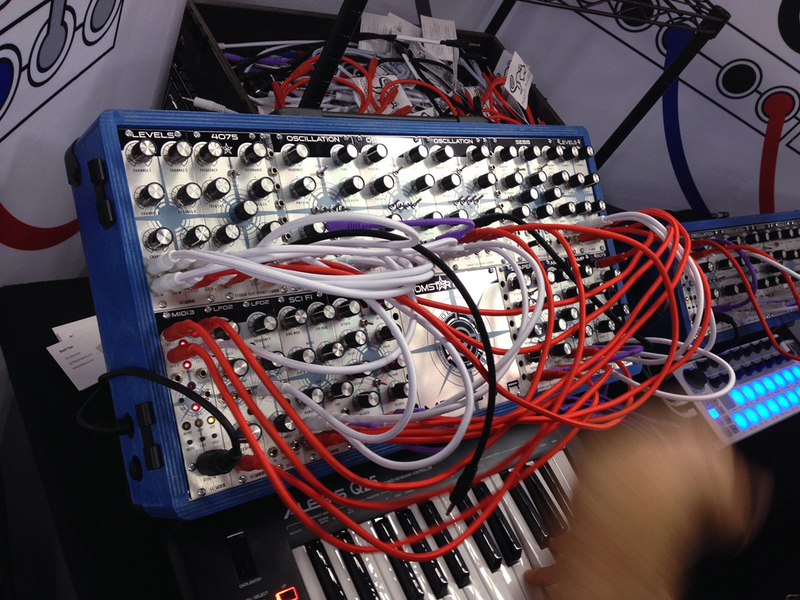 With multiple cables at play, things can get complicated. 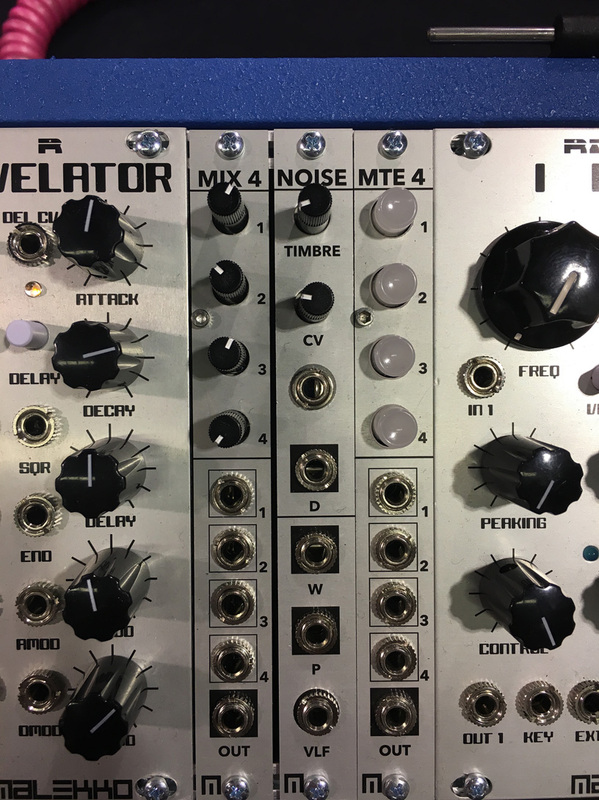 The Make Noise reverb, which with certain settings, sounded unlike any reverb I’ve heard before. 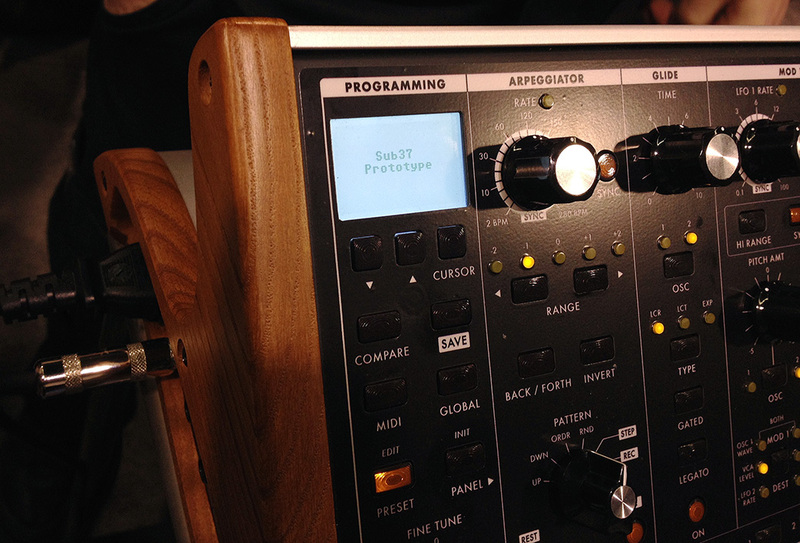 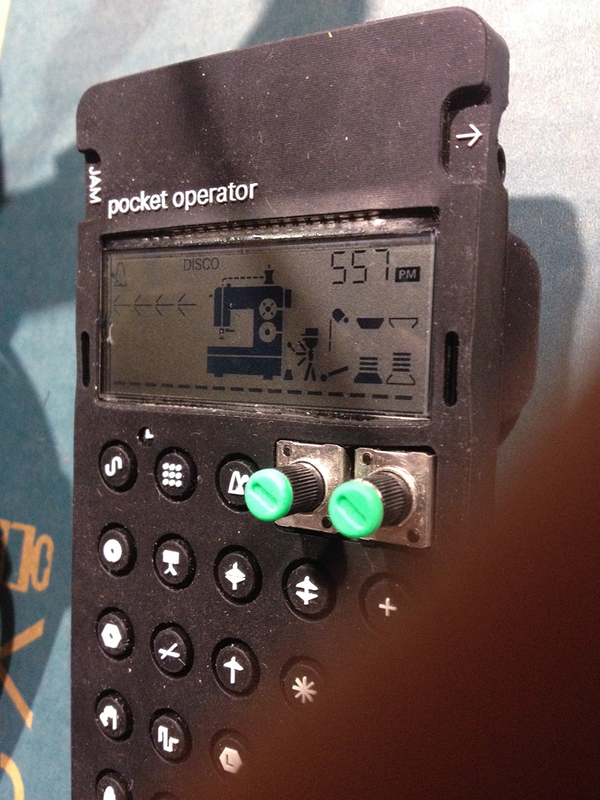 There are no presets and all parameters are brought out to the front panel and can be controlled via CV. 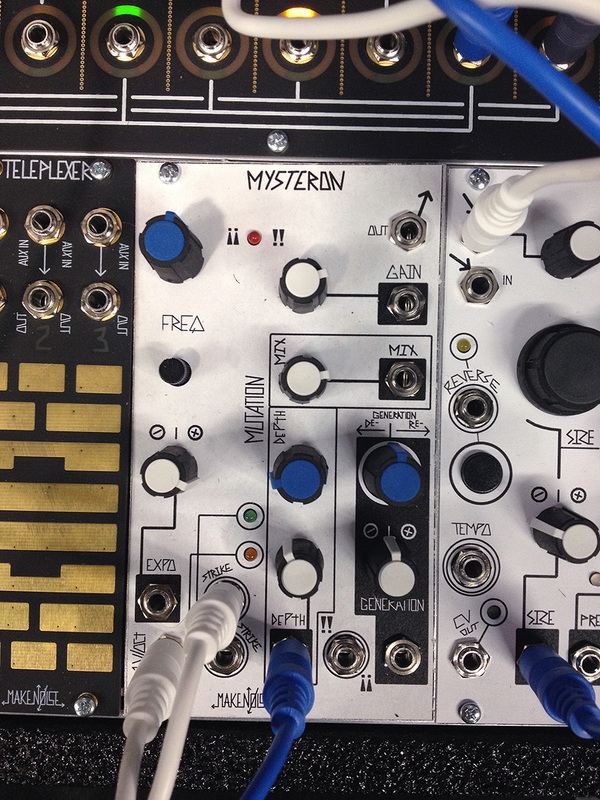 Mysteron, the mystery module aka the digital wavguide, arrives! 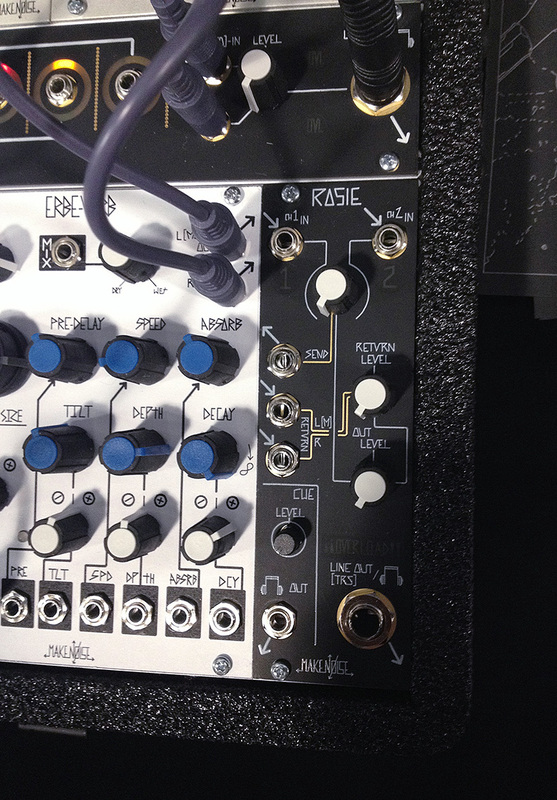 Rosie – the cue system with an effects loop. 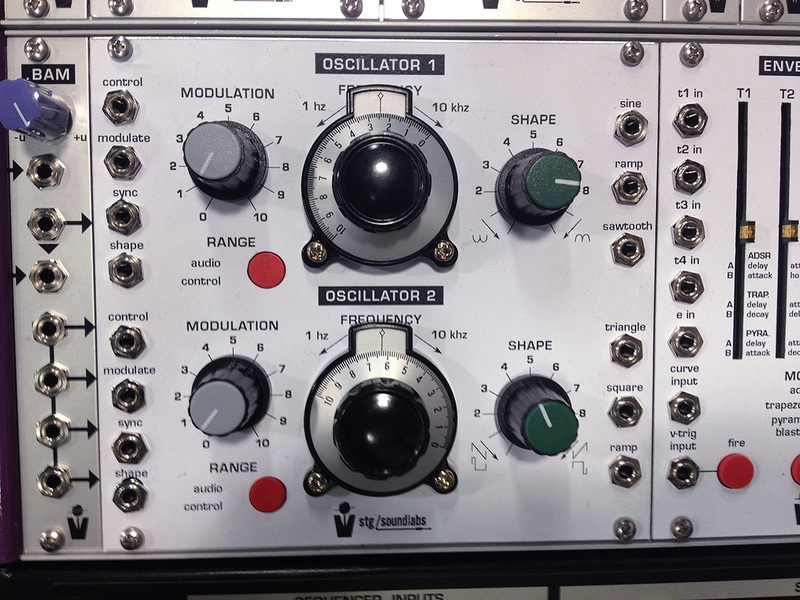 The WMD/Steady State Fate set up with new modules Amplitude, Pole-Zero, Spectrum, Ultrafold, VCMiniSlew, and the Quad Attenuator. 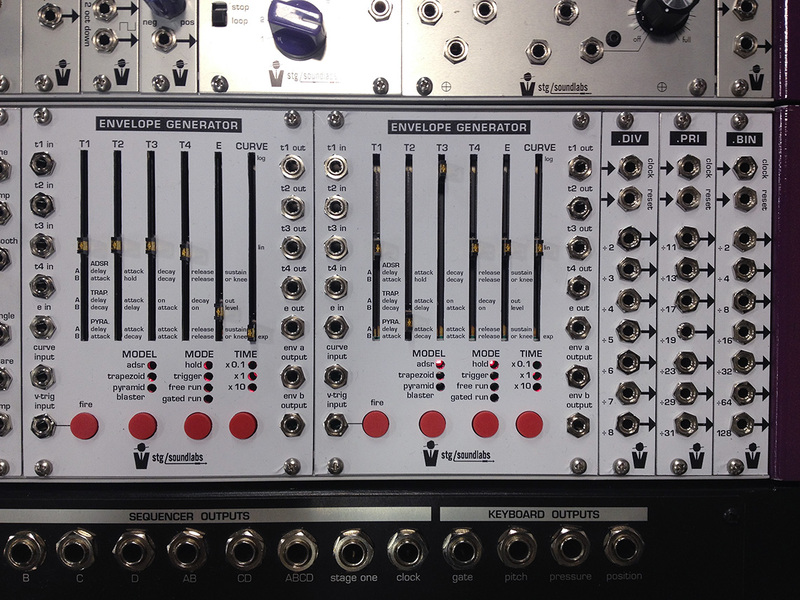 Also Snazzy FX modules in there including the new Telephone Game module. 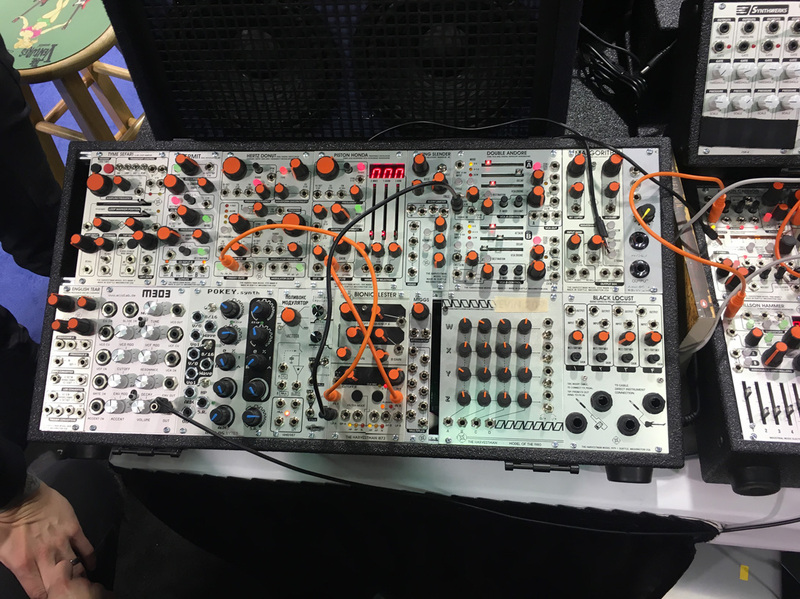 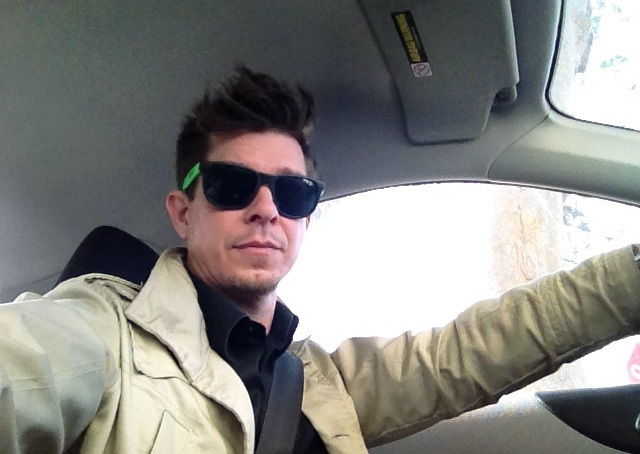 Sorry, this shot is pretty blurry. 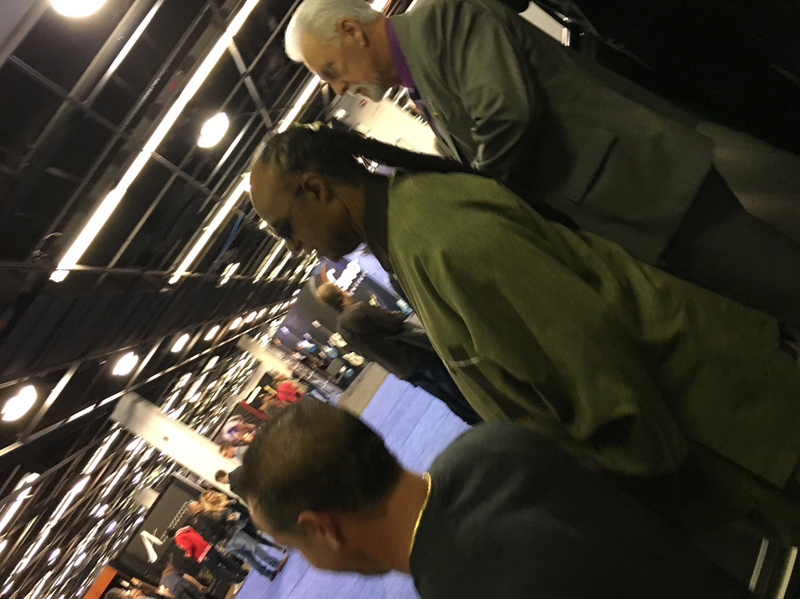 Can’t win ’em all. 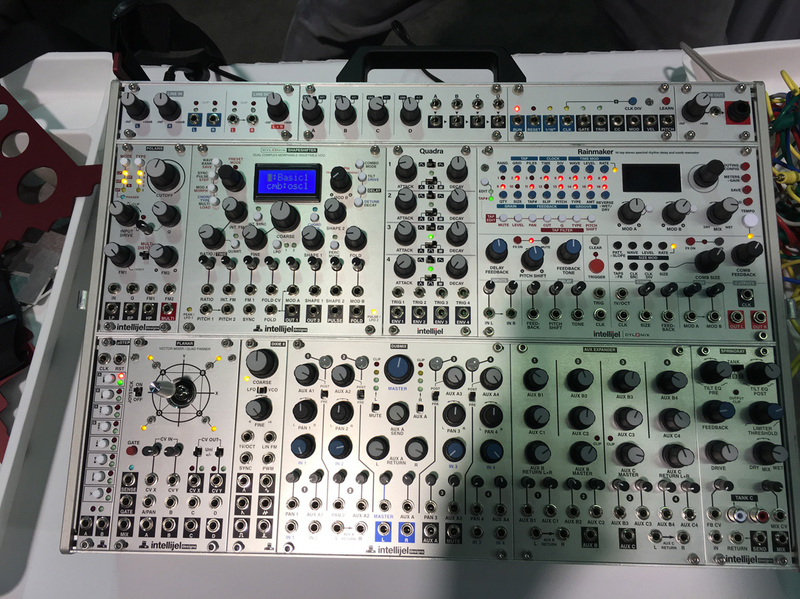 The newly announced Verbos Electronics set. 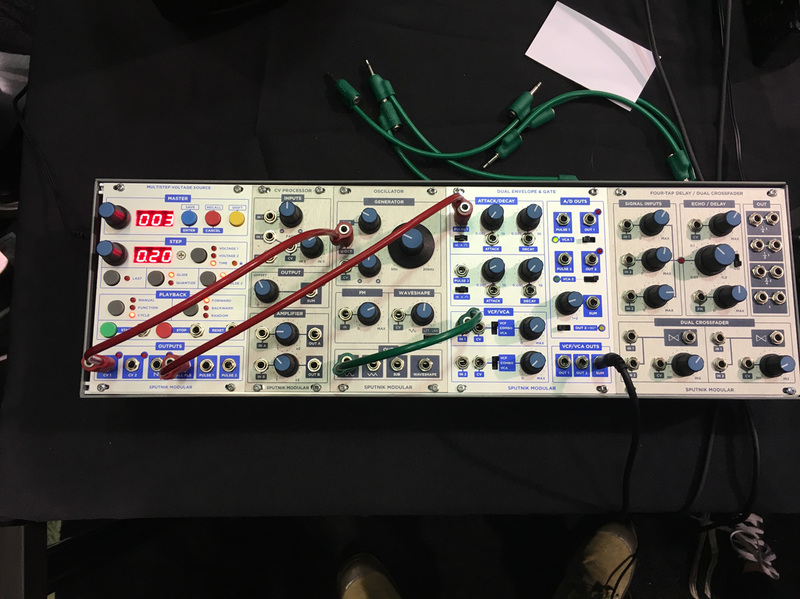 Looking great, out of the gate, with the cool Rogan knobs Buchla nod and unique color scheme. 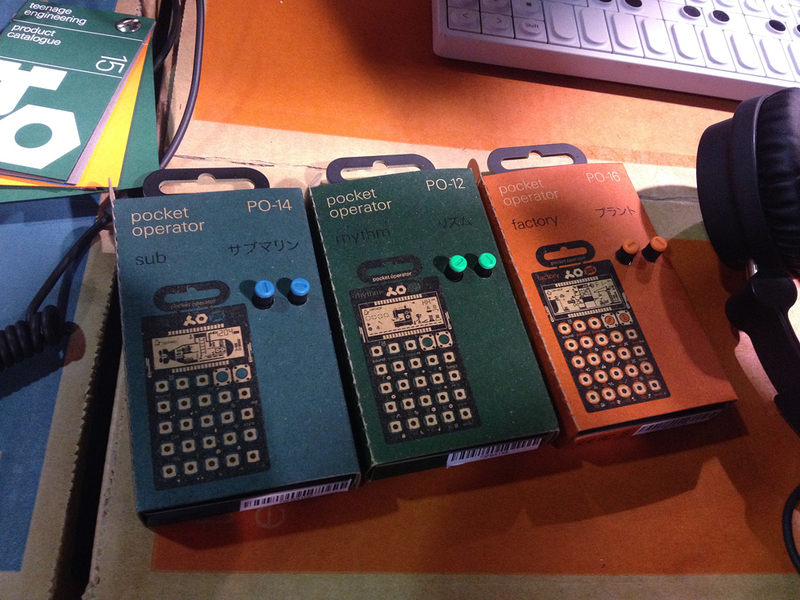 These look aesthetically and functionally great. 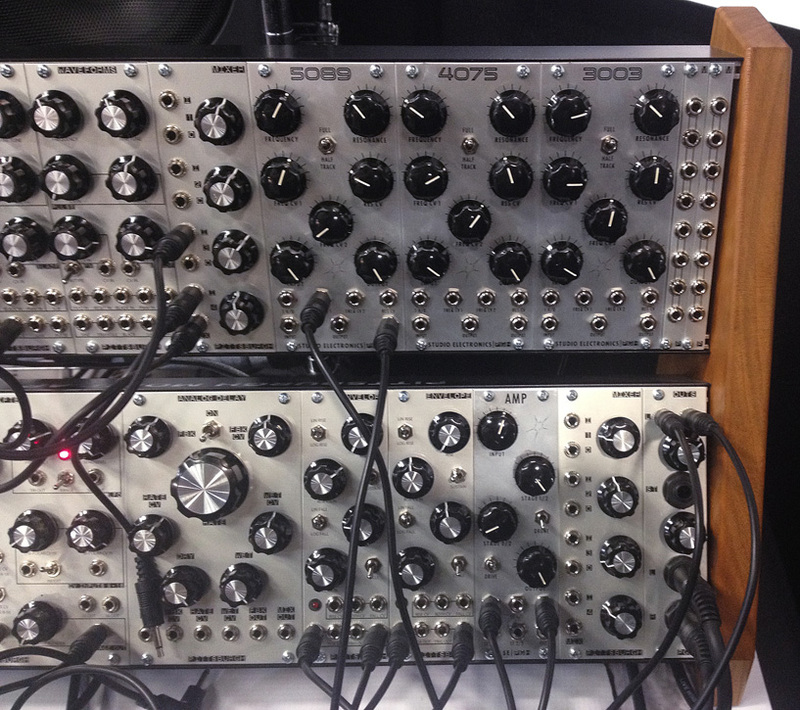 They sound as cool as they look as well. 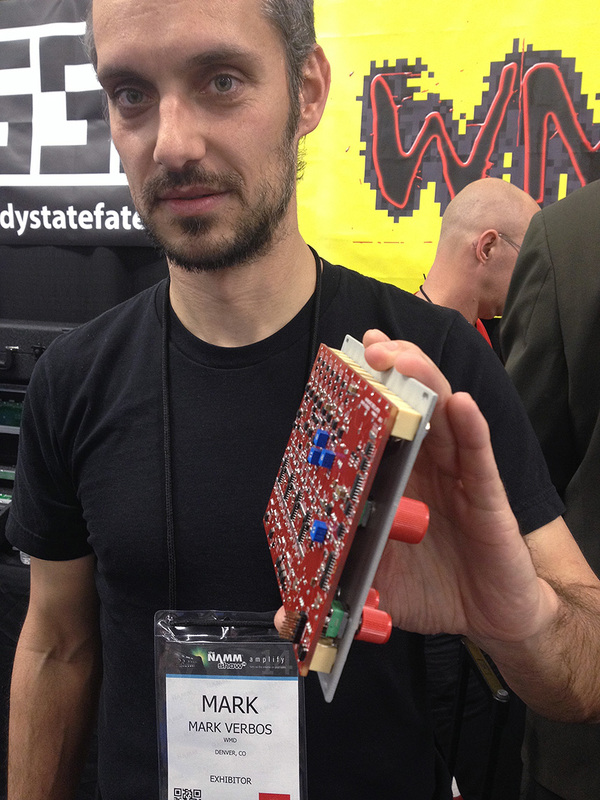 Mark showing the very skiffable Voltage Multistage. 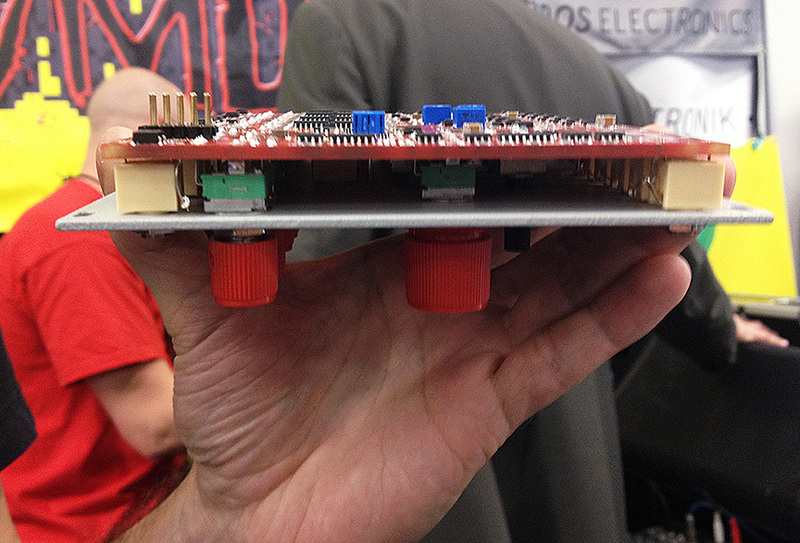 That is a thick circuit board! 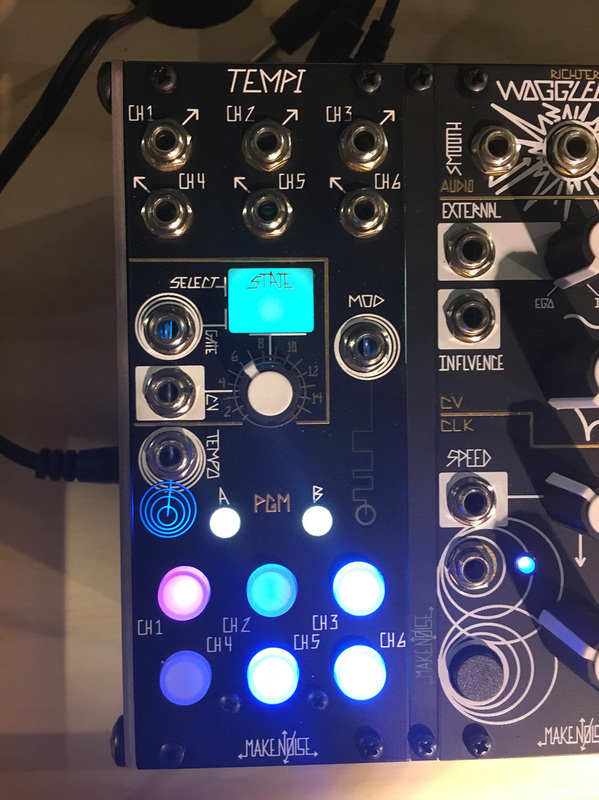 4MS with their new modular modular case/boats which look like a great solution for people who are ever expanding, rearrange their system a lot, or want to be able to detach a portion of their system for live use. 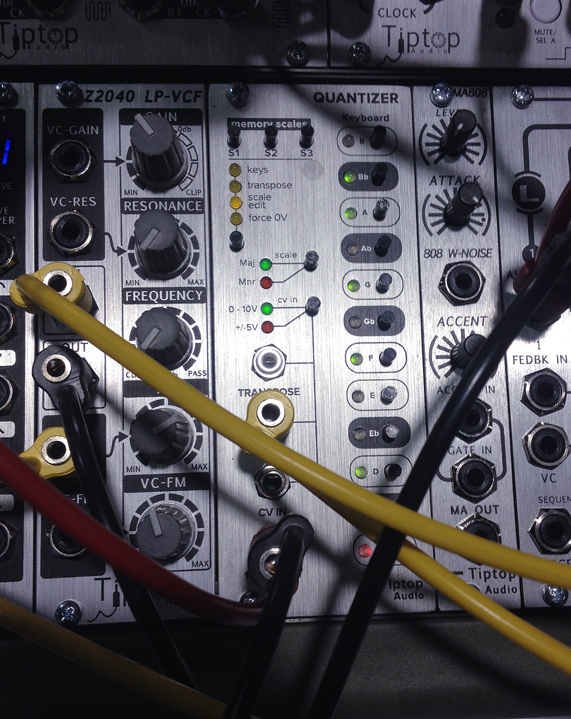 The QCD expander (on the left), which packs a lot of punch in a small space. 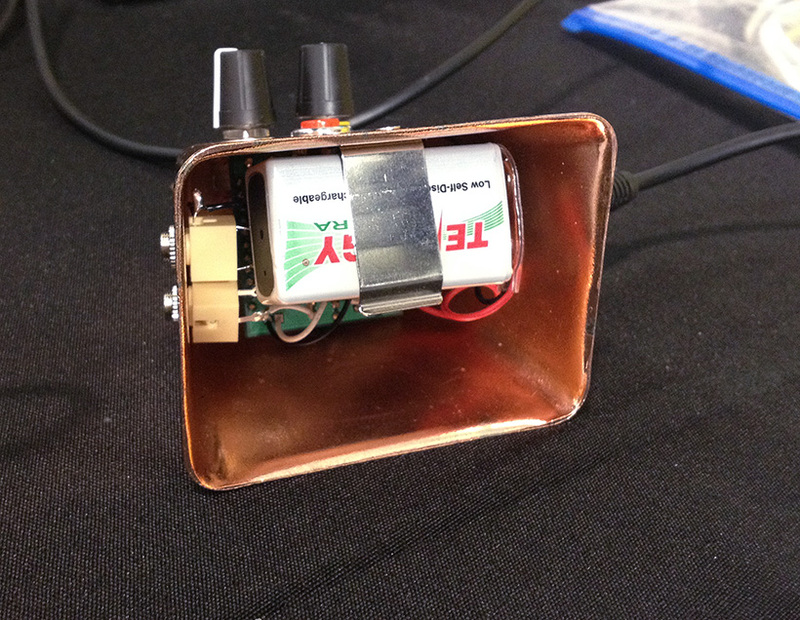 The Delptronics Thunderbell, a CV-able cowbell. 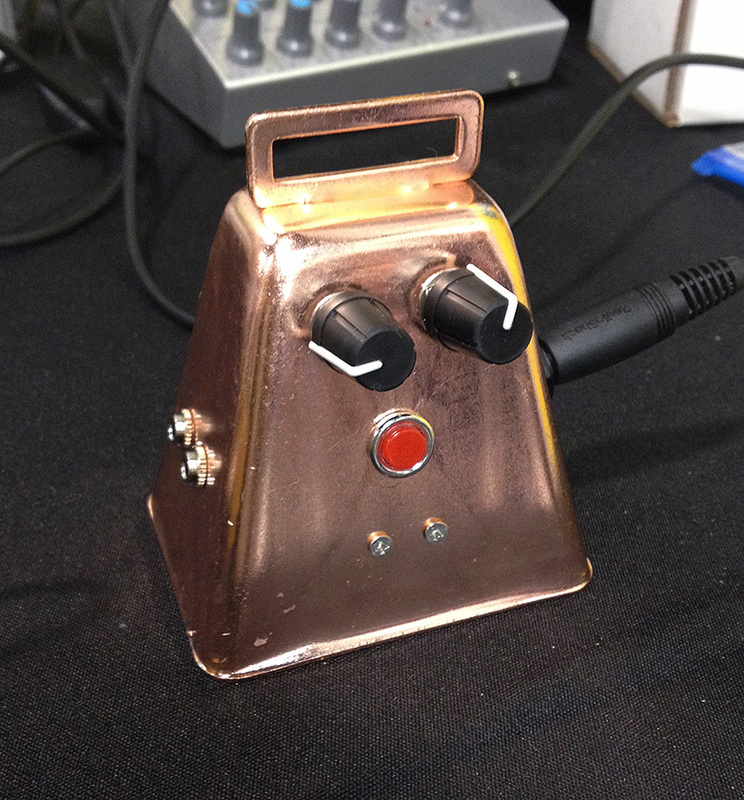 I believe it will be offered in both Eurorack as well as mounted in a real cowbell. 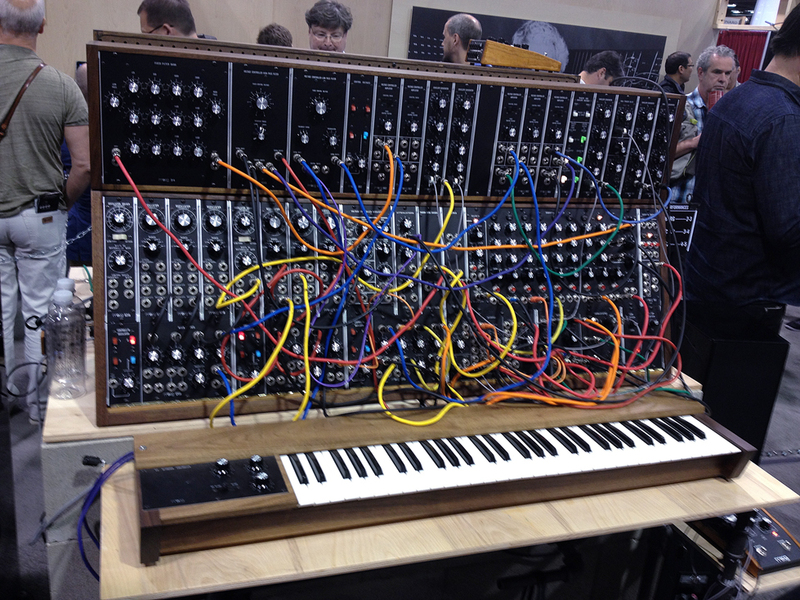 CV for the pitch and the decay. 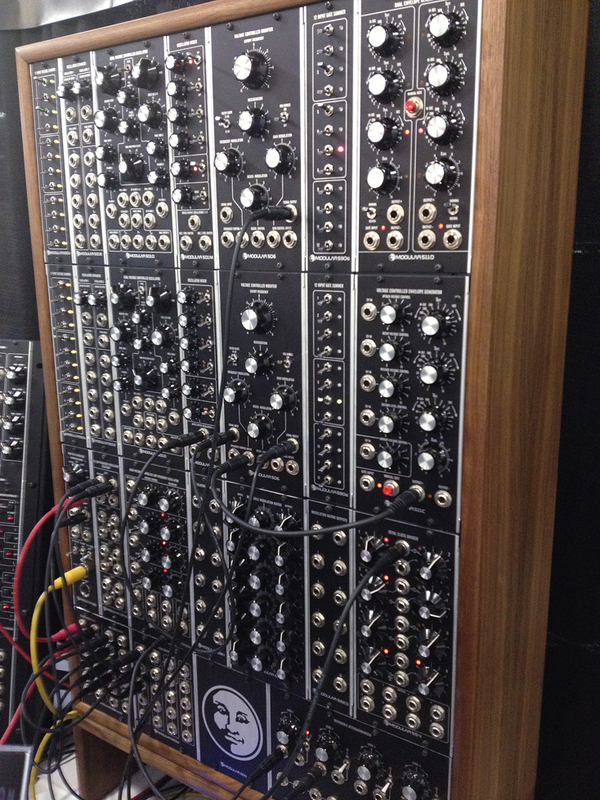 It sounds great. 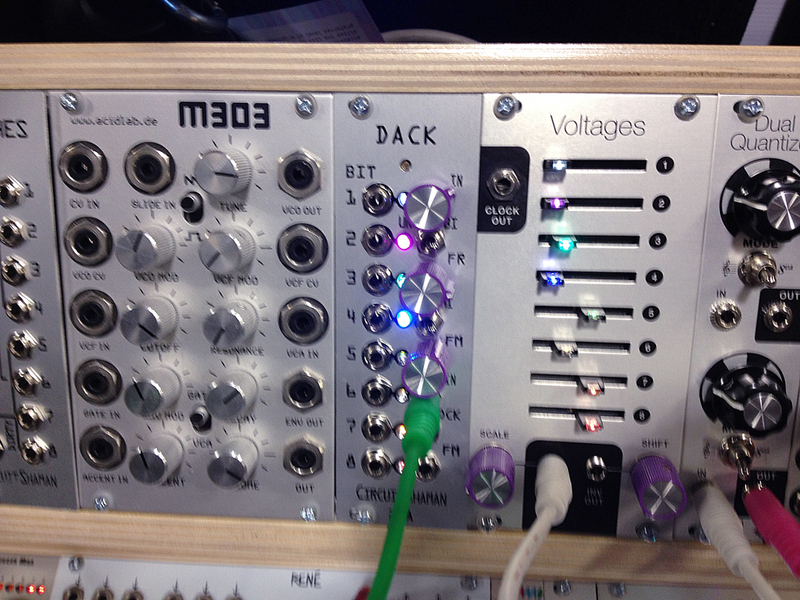 Delptronics General MIDI module prototype. 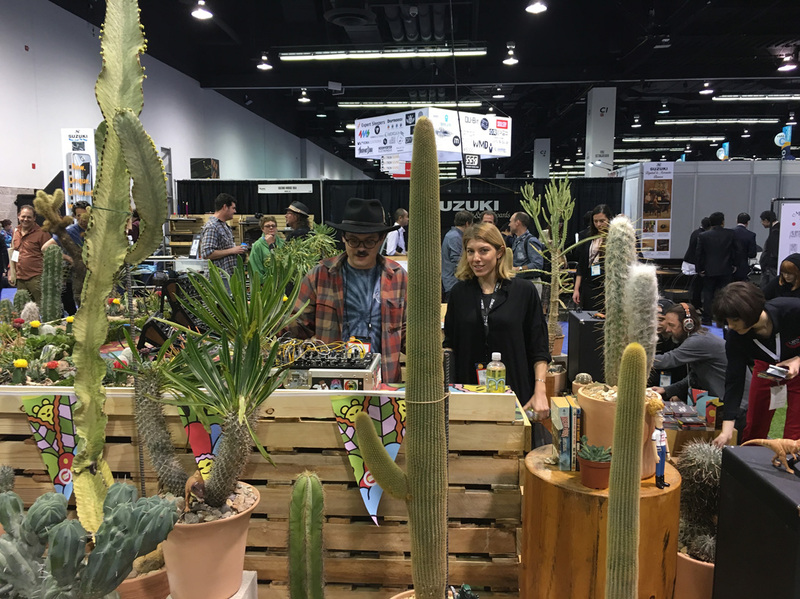 Next I went to check out Gur and Tomio at Tiptop in Hall A in the Big City booth. 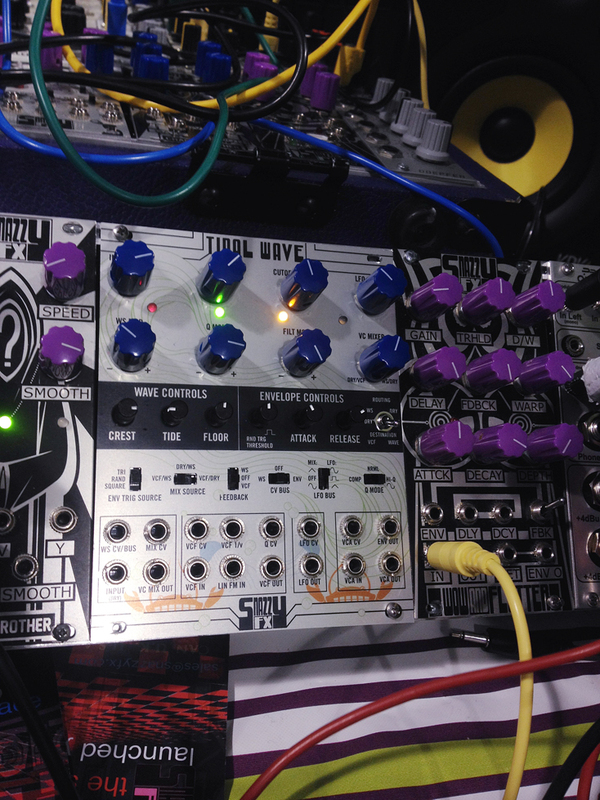 Sean Costello’s Valhalla Reverb card for the Z-DSP sounds amazing. 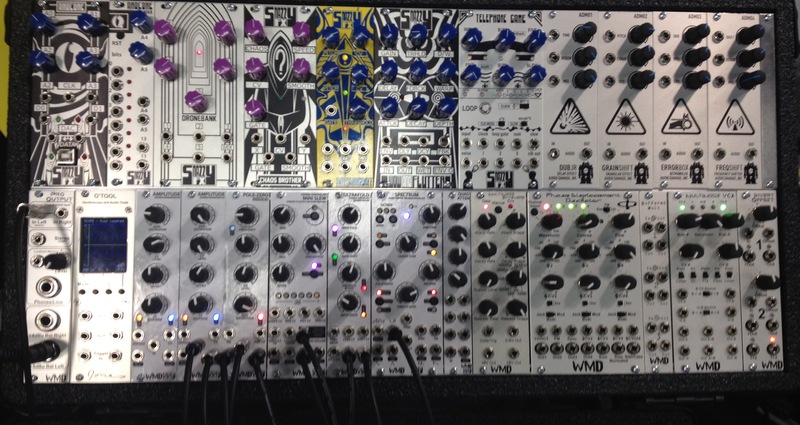 It is my most anticipated modular purchase of 2014. 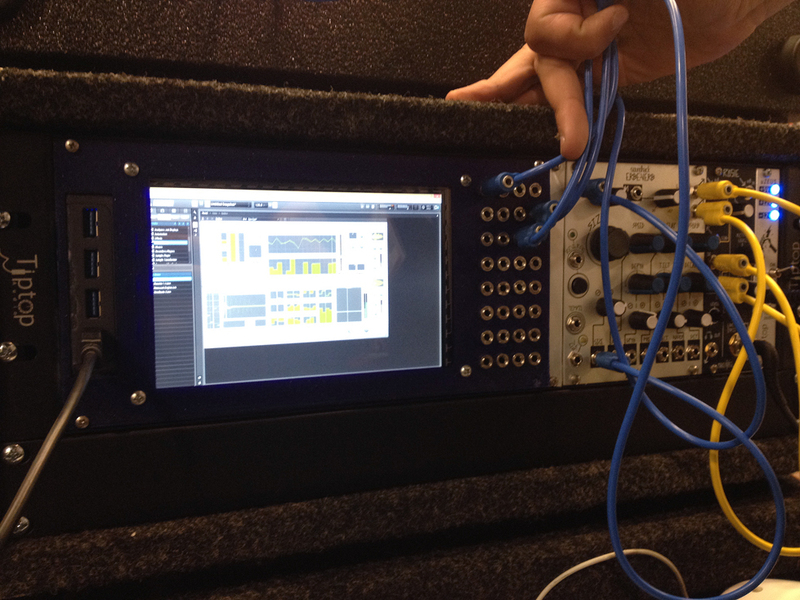 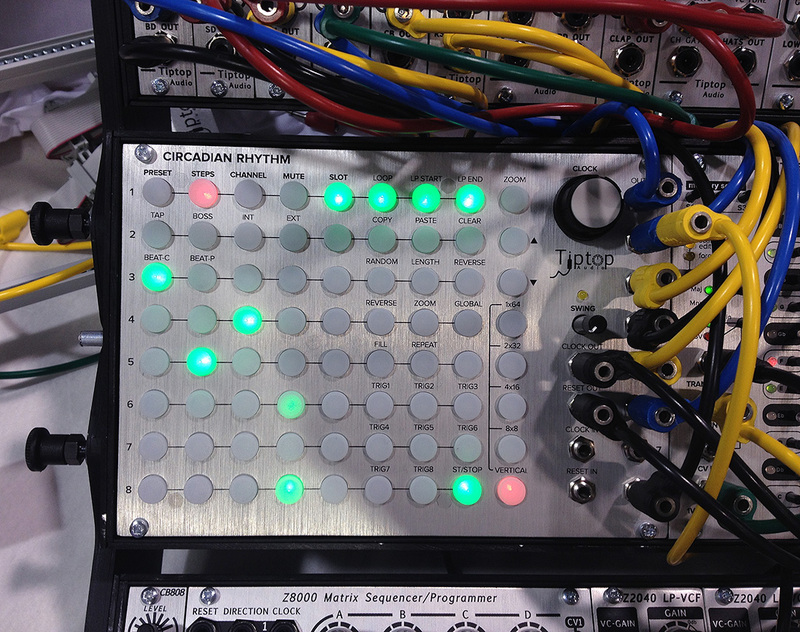 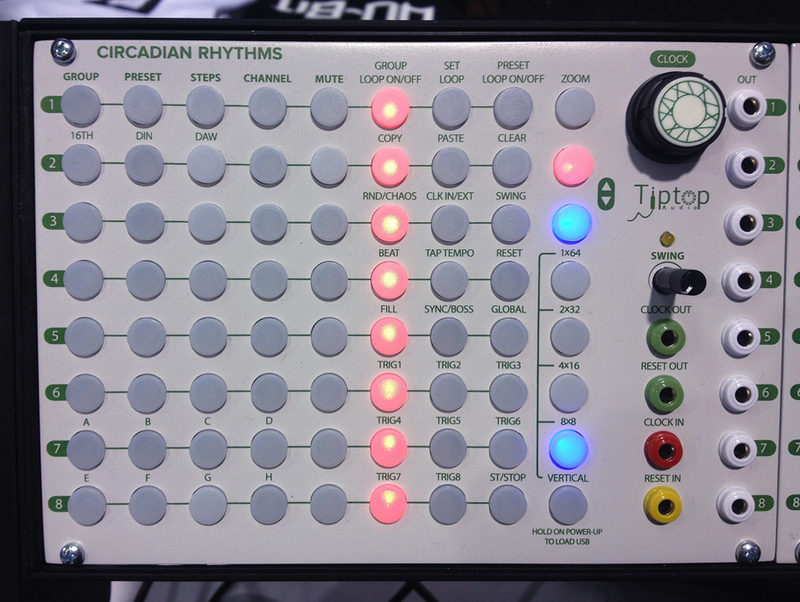 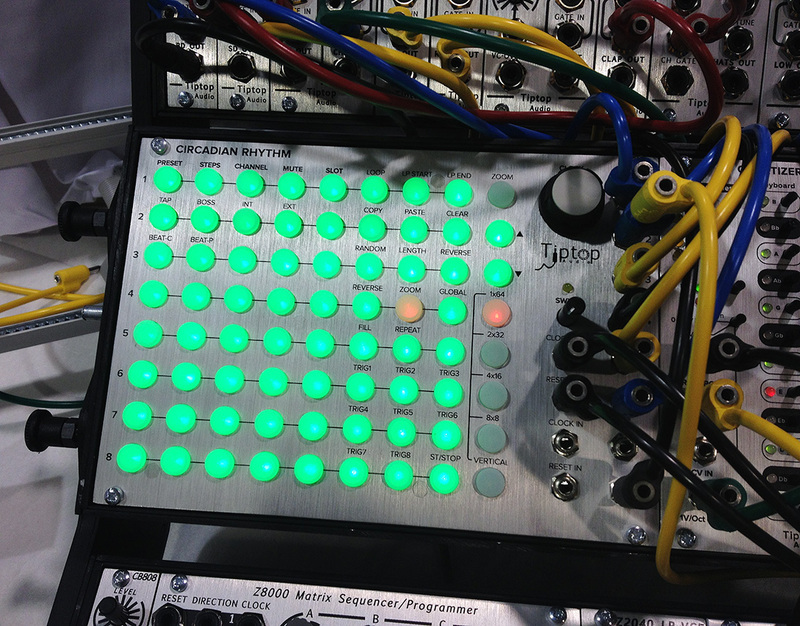 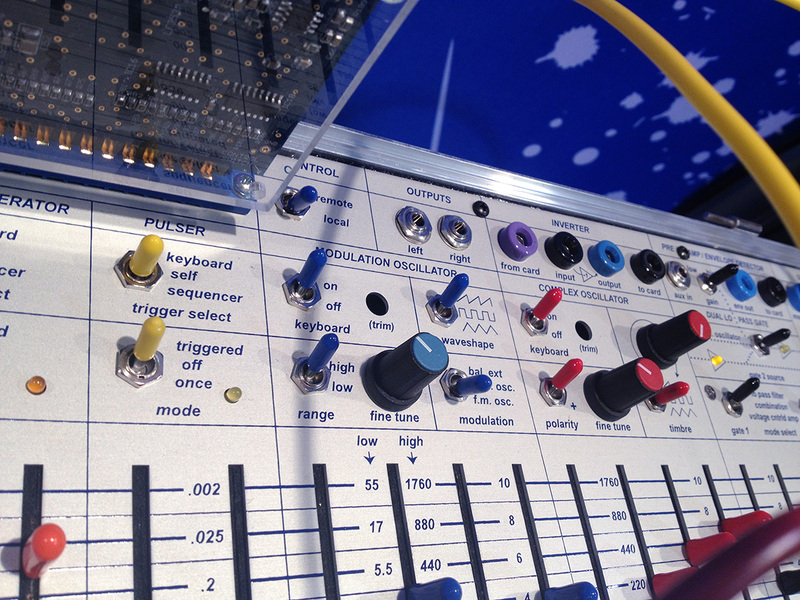 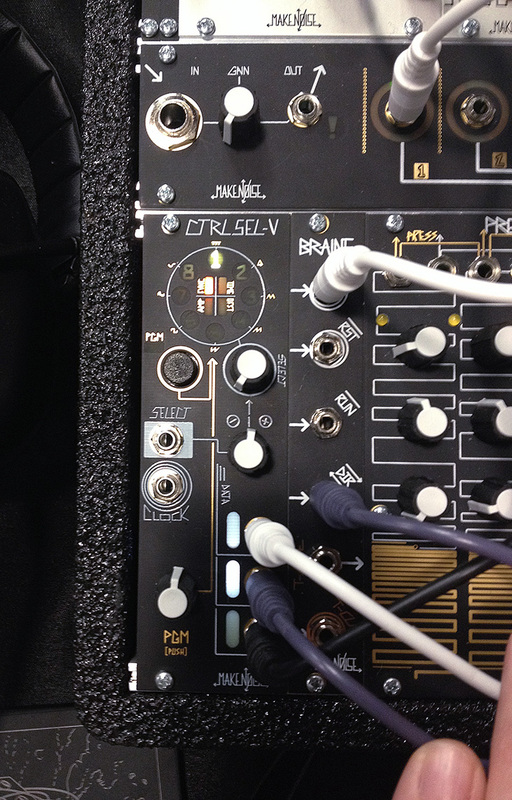 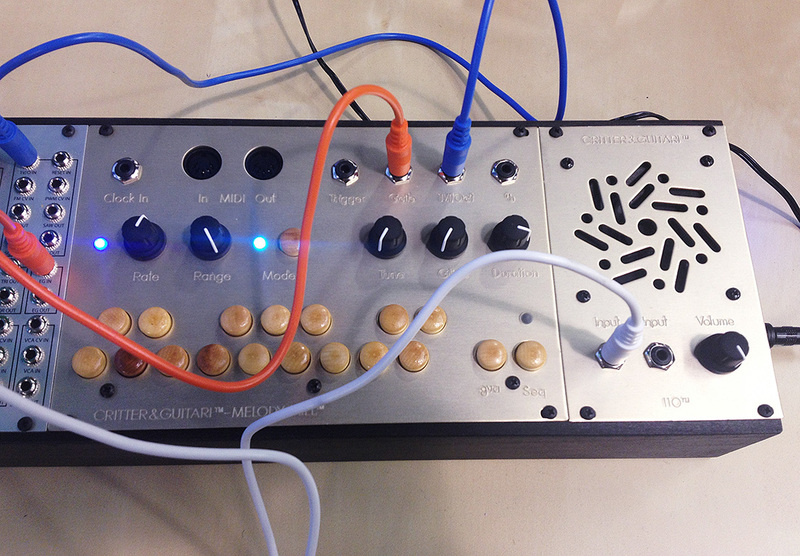 An elaborate new sequencer from Tiptop called the Circadian Rhythm. 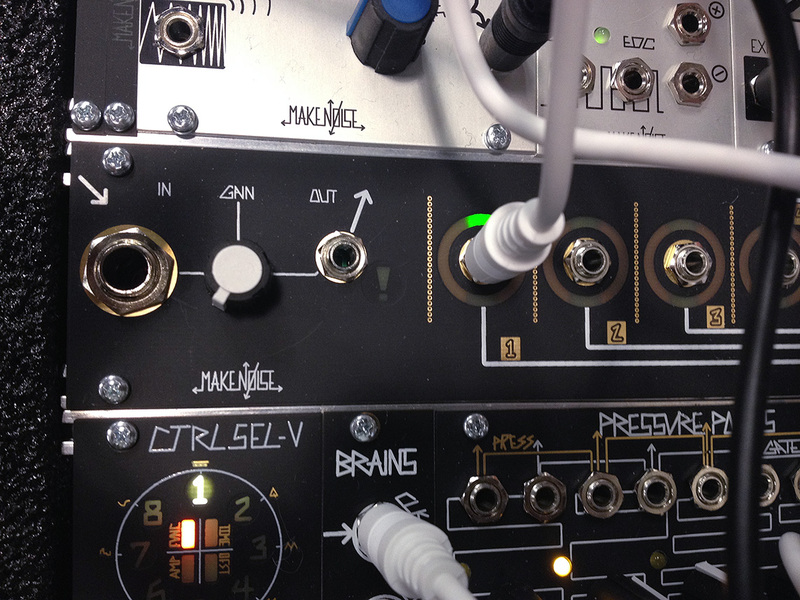 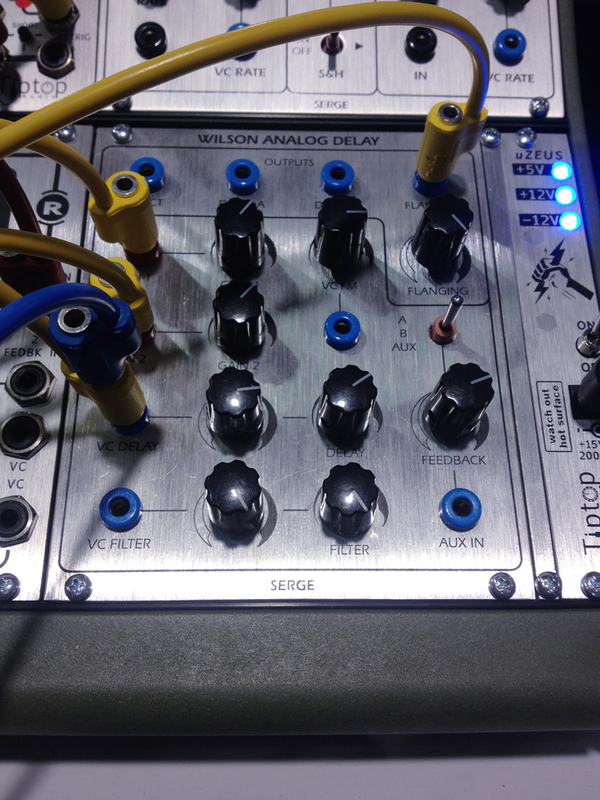 Serge Wilson Analog Delay in eurorack. 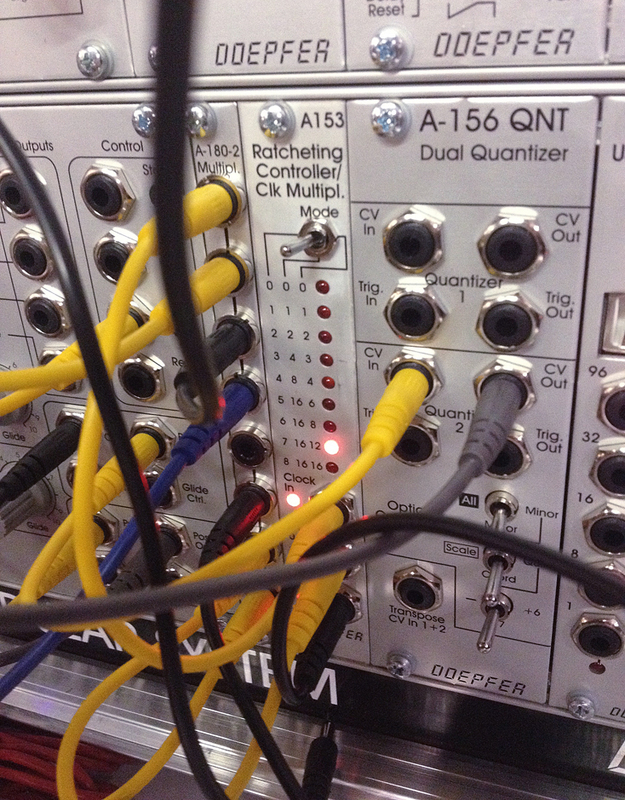 A very capable and flexible looking quantizer. 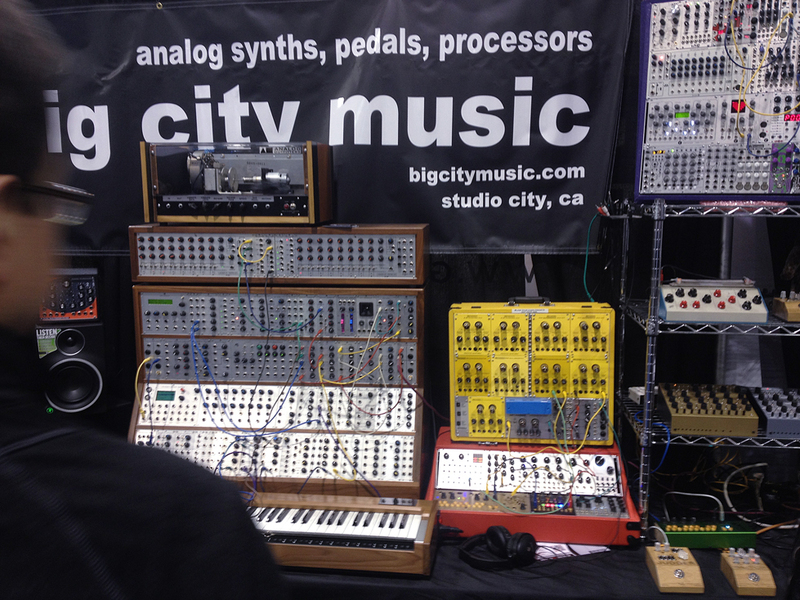 Another case at the Big City booth. 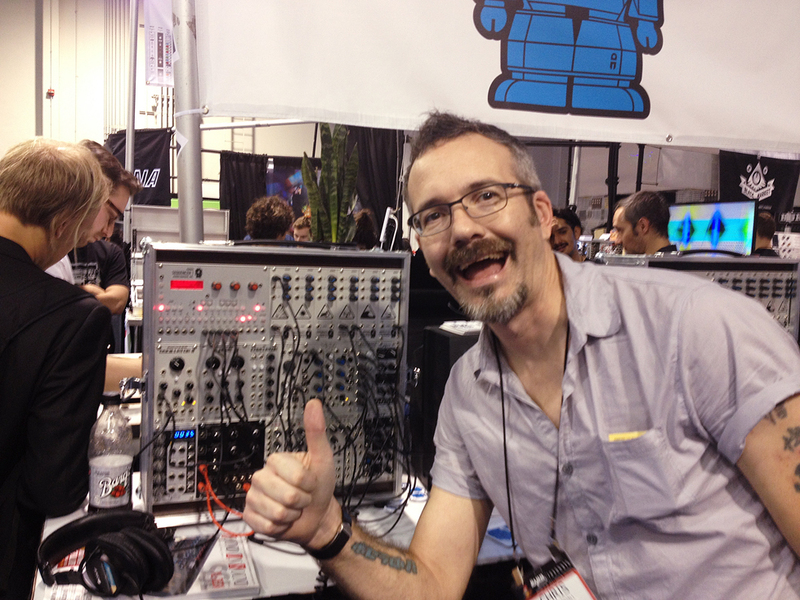 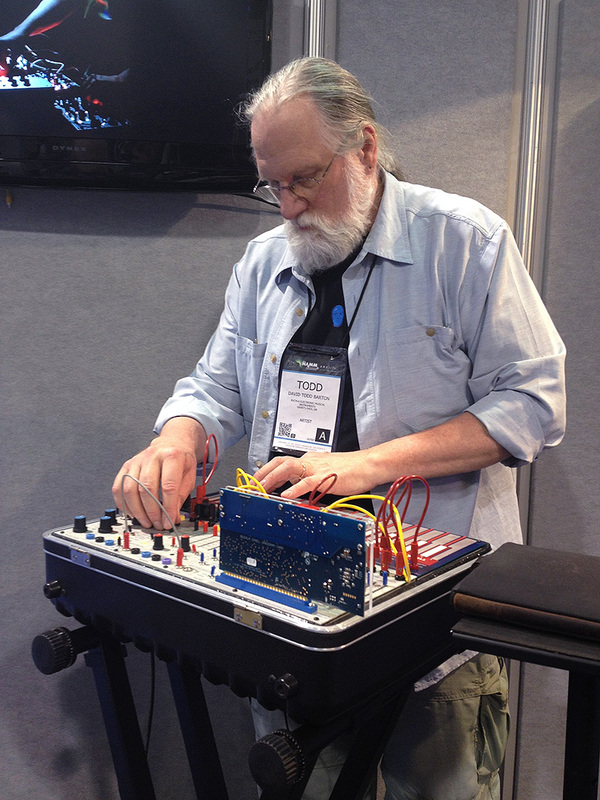 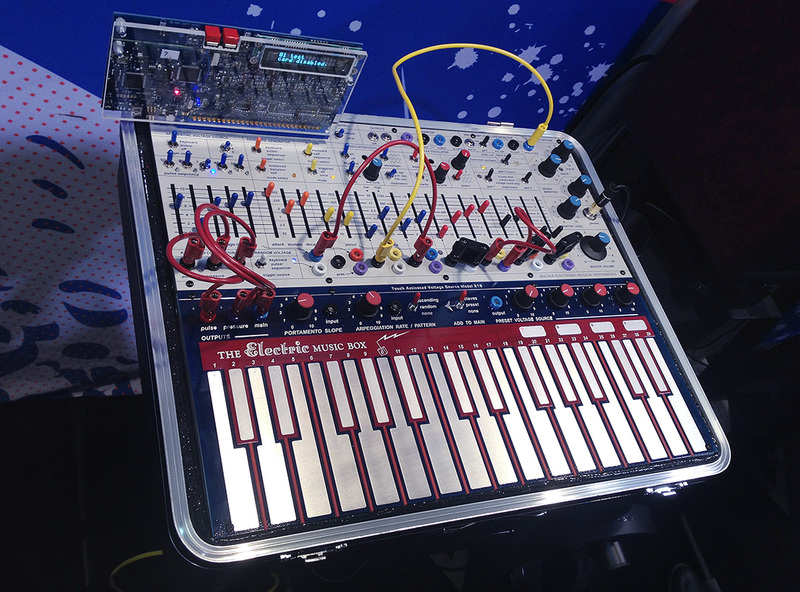 Here’s Todd Barton with the Buchla Music Easel reissue. 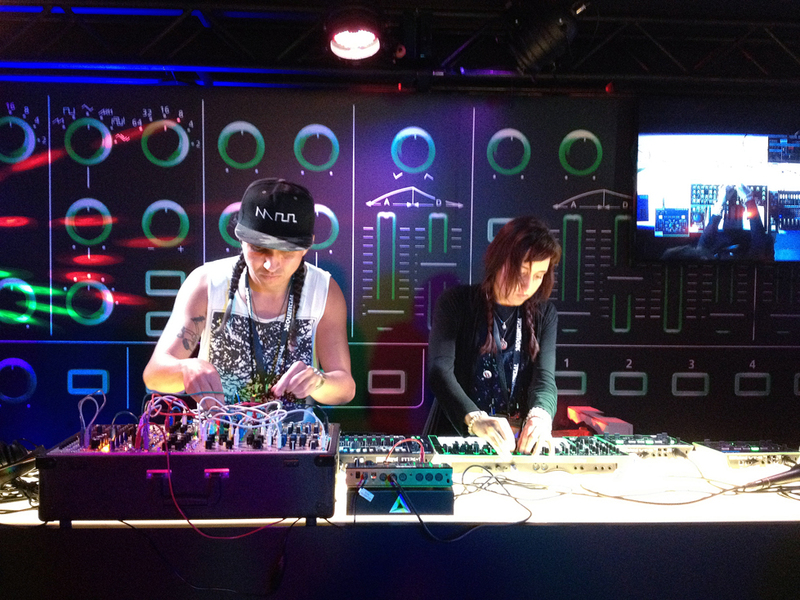 They were showing the new preset card that links to the iPad via bluetooth. 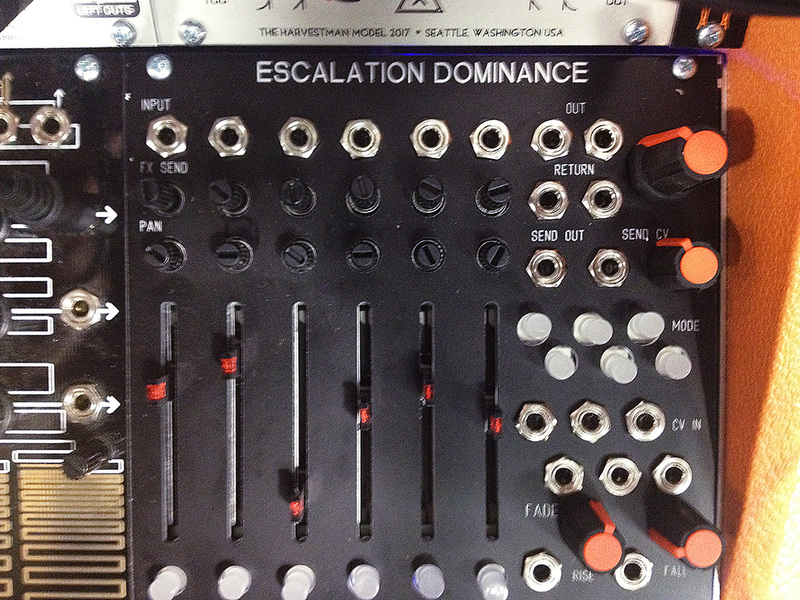 It also looks like they have added (reinstated?) 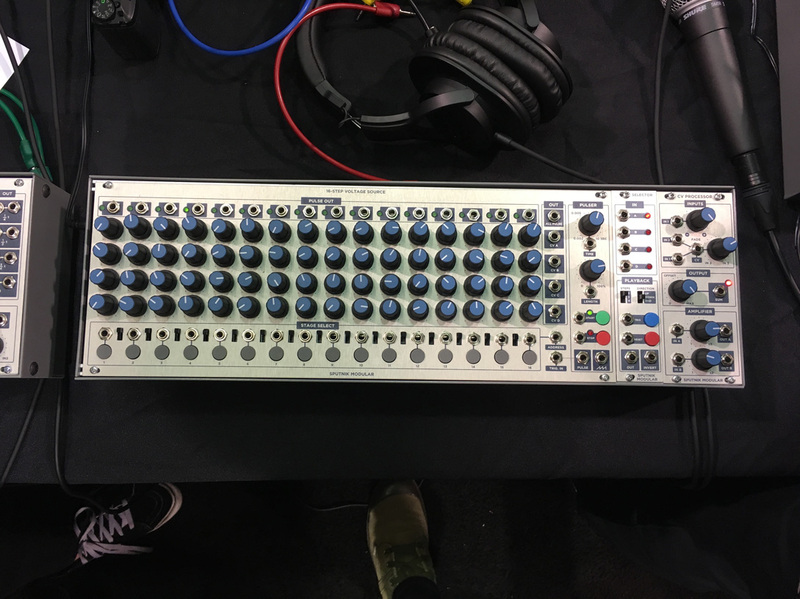 the nuts to the switches. 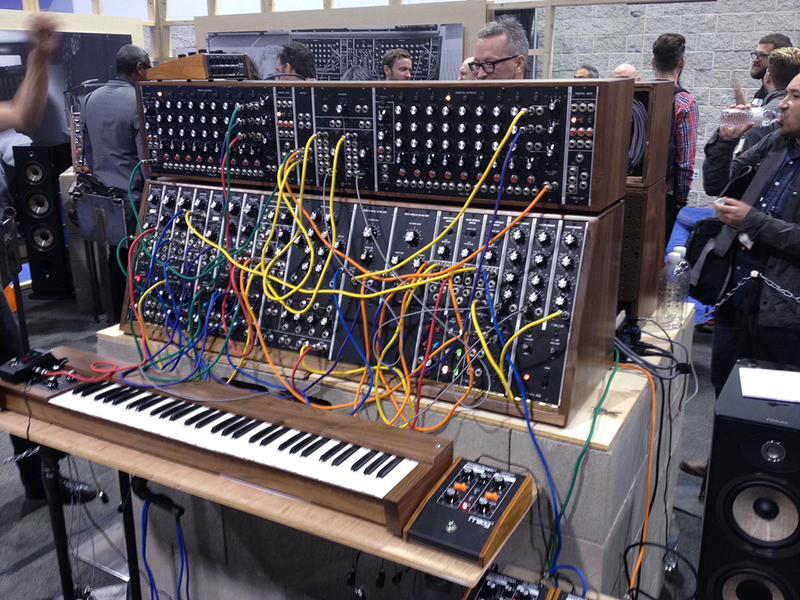 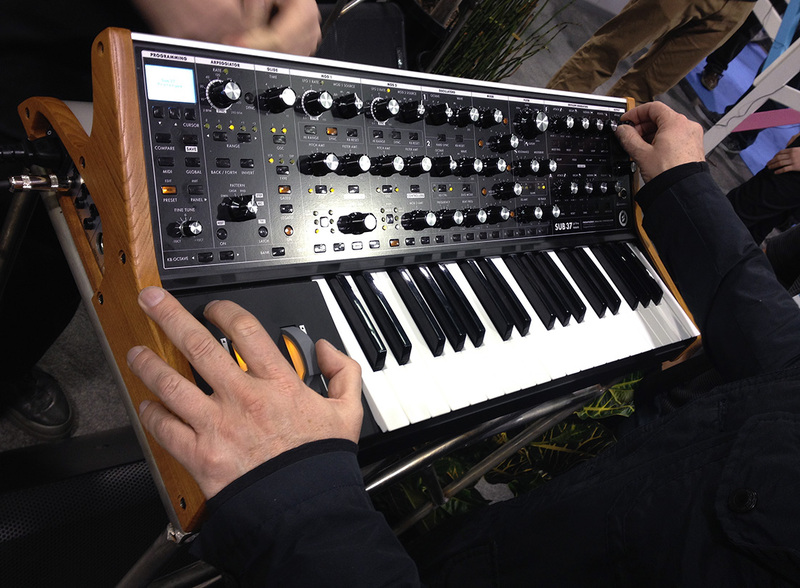 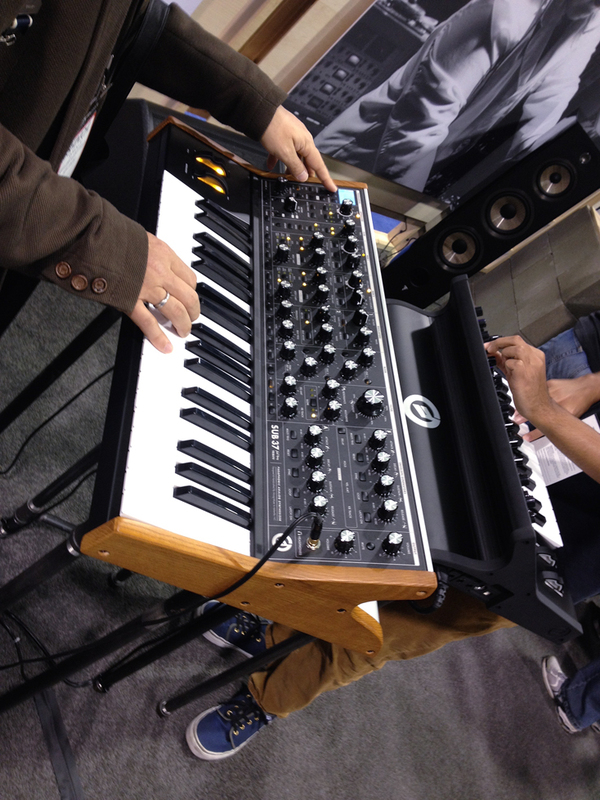 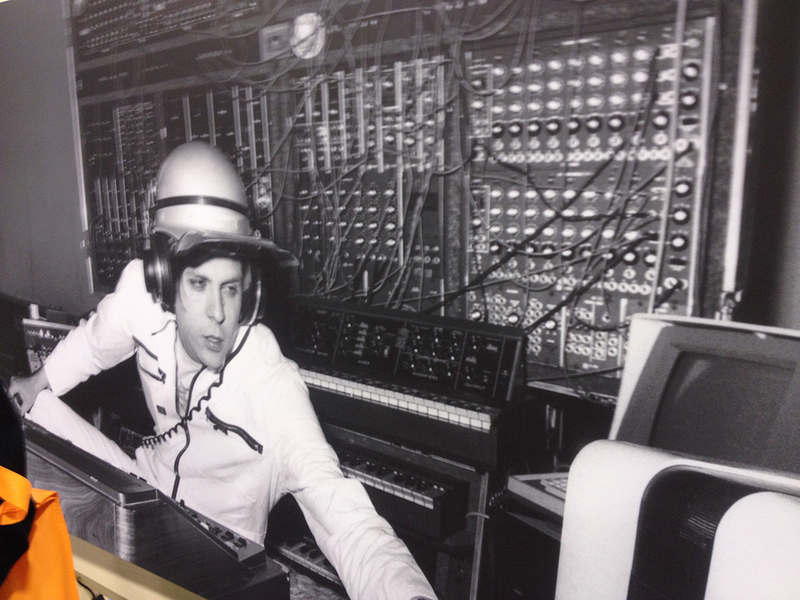 The Moog Sub37. 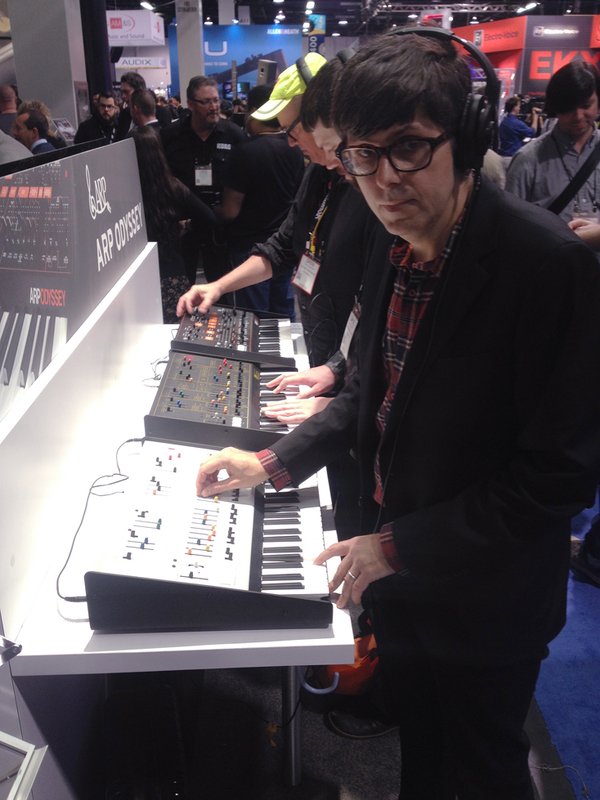 Roger O’Donnell (The Cure, Psychedelic Furs, etc.) 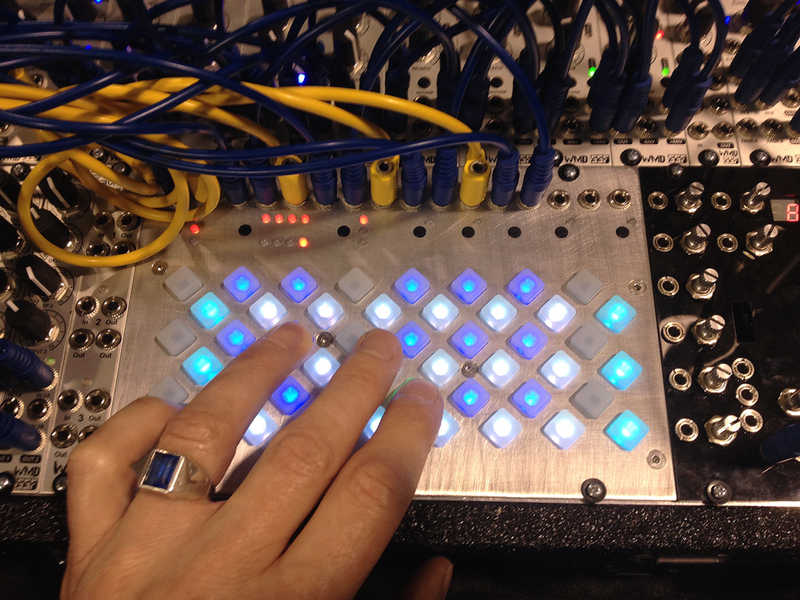 is the hand model, btw. 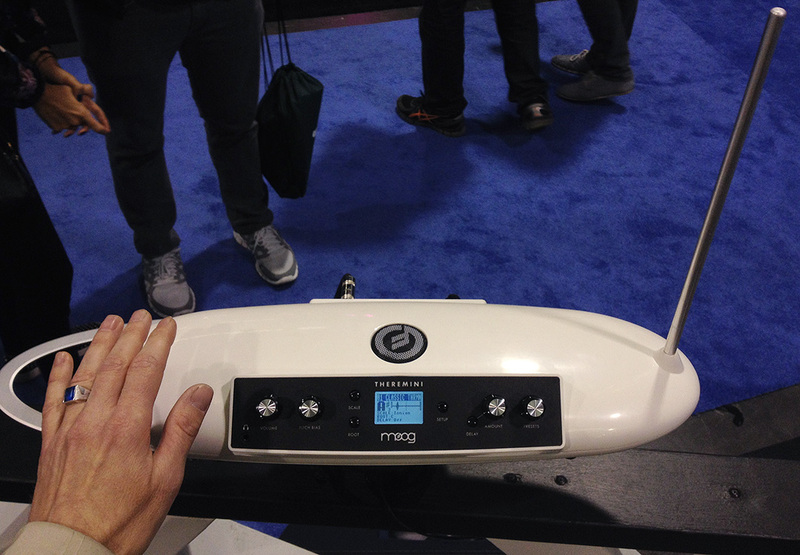 The Moog Theremini. 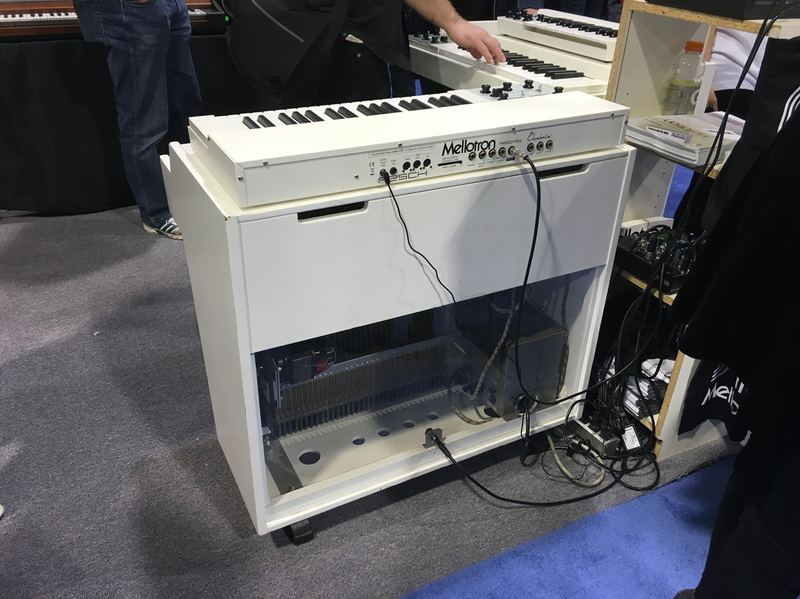 I’m not gonna lie, I want one! 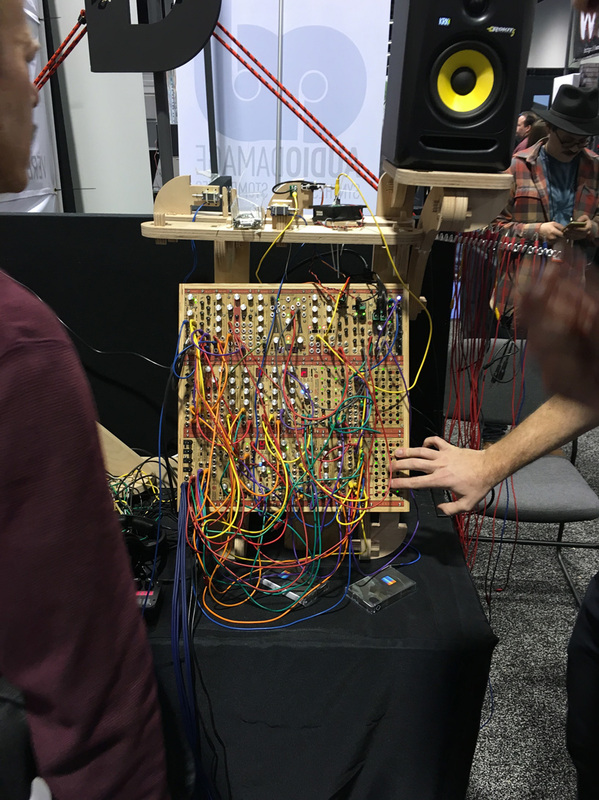 I already have a Big Briar theremin with the CV mods done to it, but this thing was fun to play (it has quantizing) and has a great design. 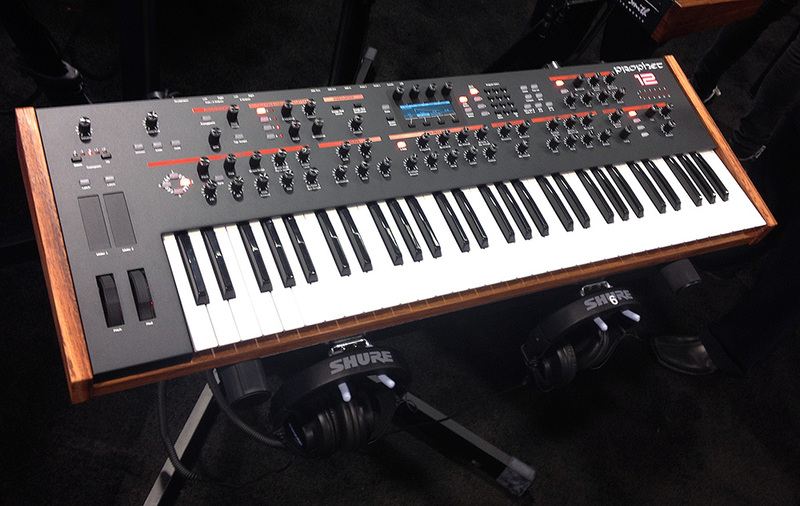 The Prophet 12 from Dave Smith. 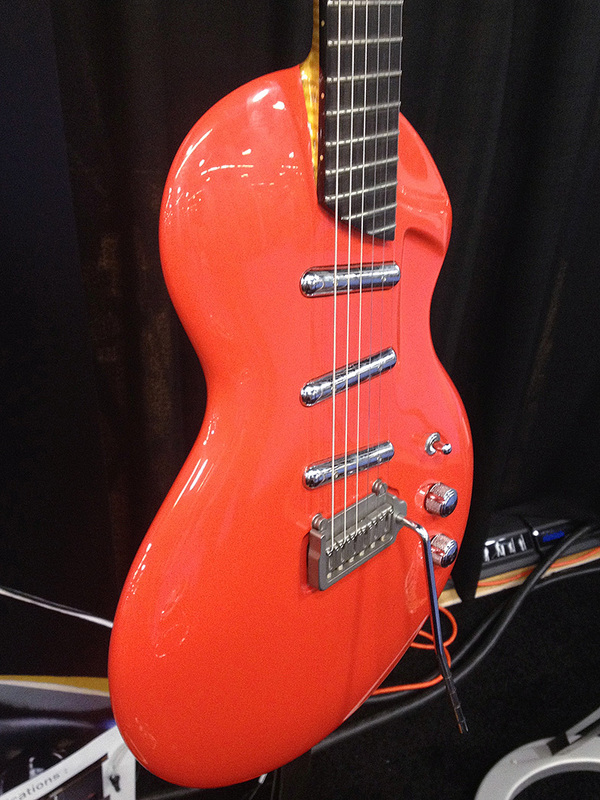 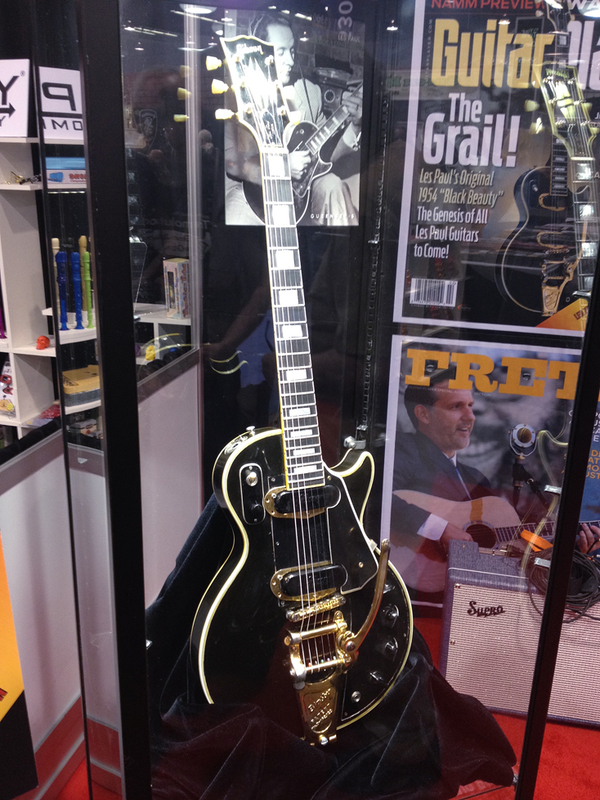 An Alquier guitar I checked out. 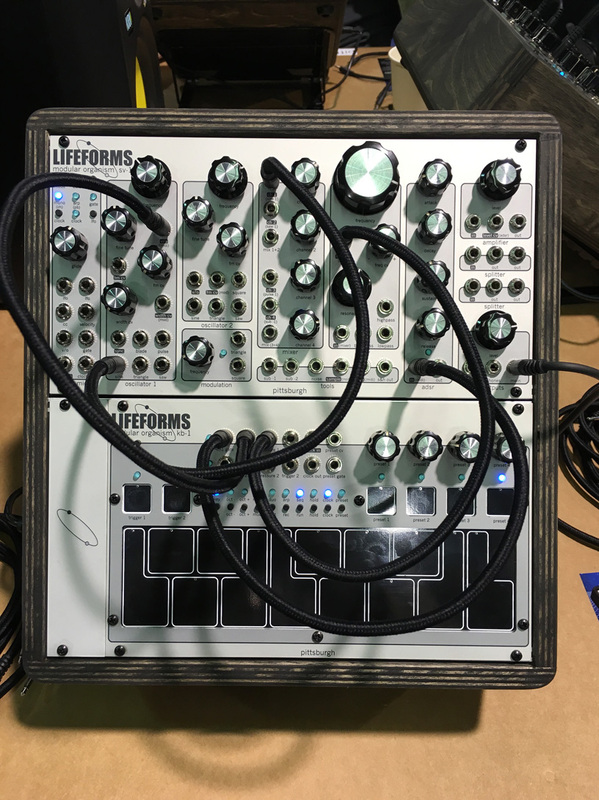 They ship with a really unique display/stand that hooks on the back via strap locks. 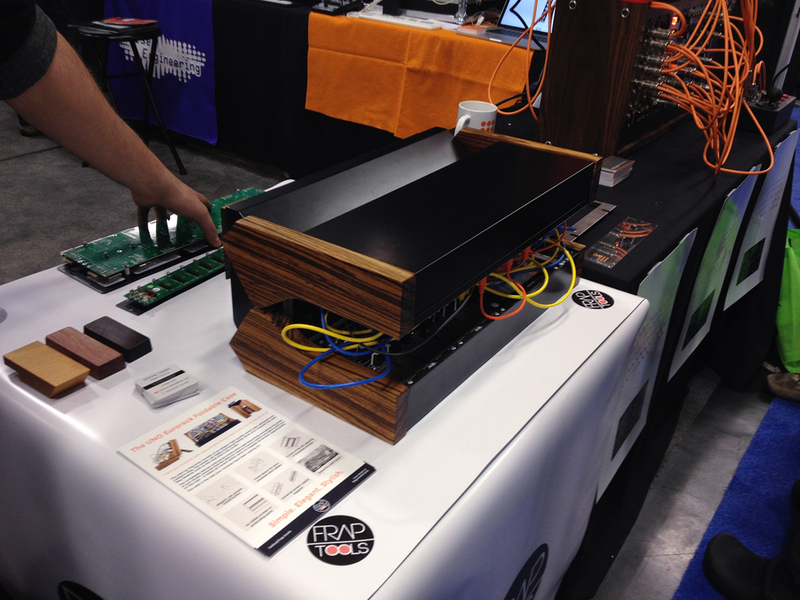 The Haken Continuum. 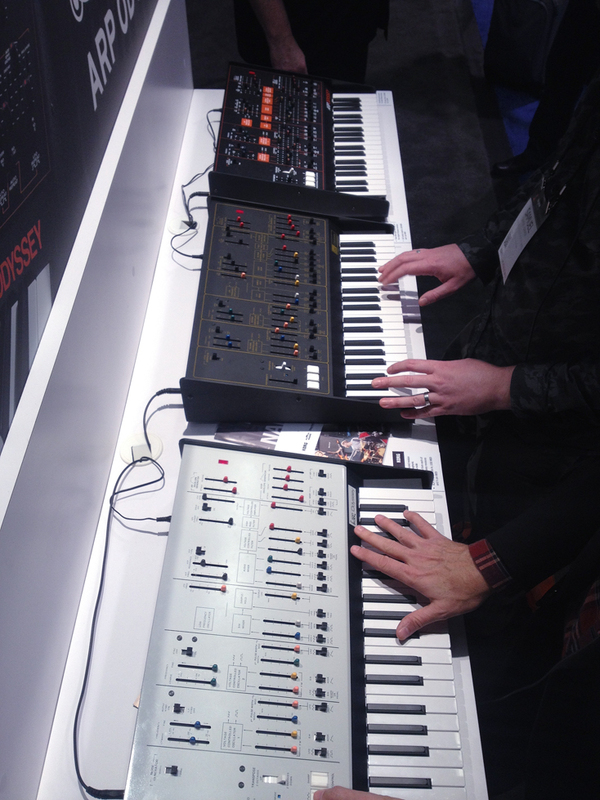 This isn’t new, but it was the first time I sat and played it. 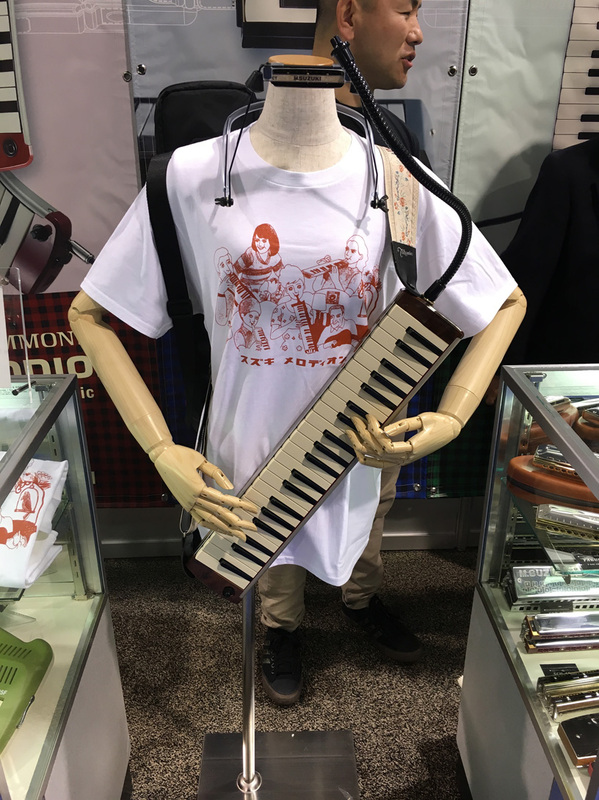 It is really expressive. 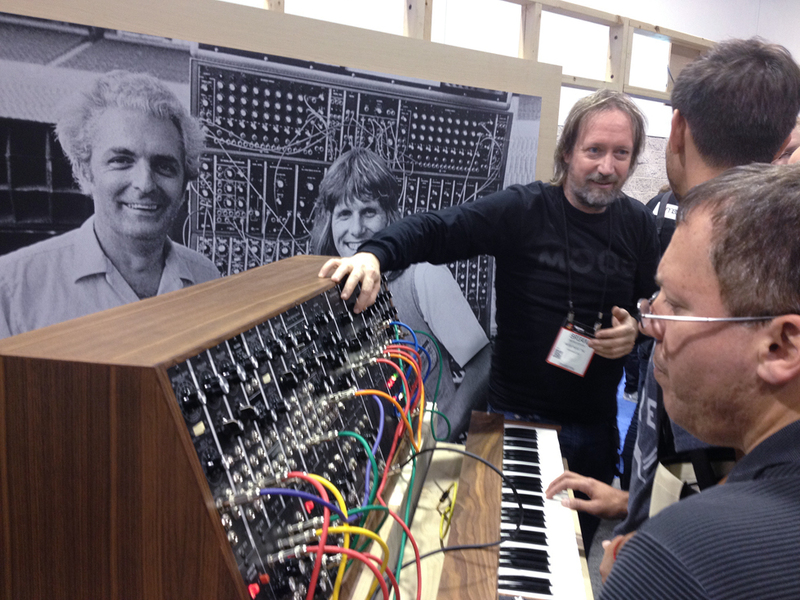 Mark Smart played Bach’s Air for me using it and it sounded amazing. 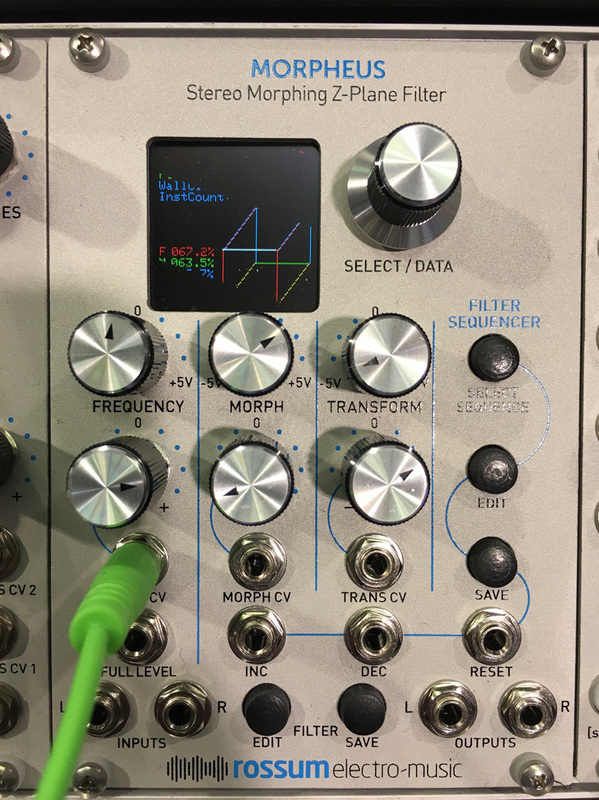 The Pittsburg Modular Phase Shifter. 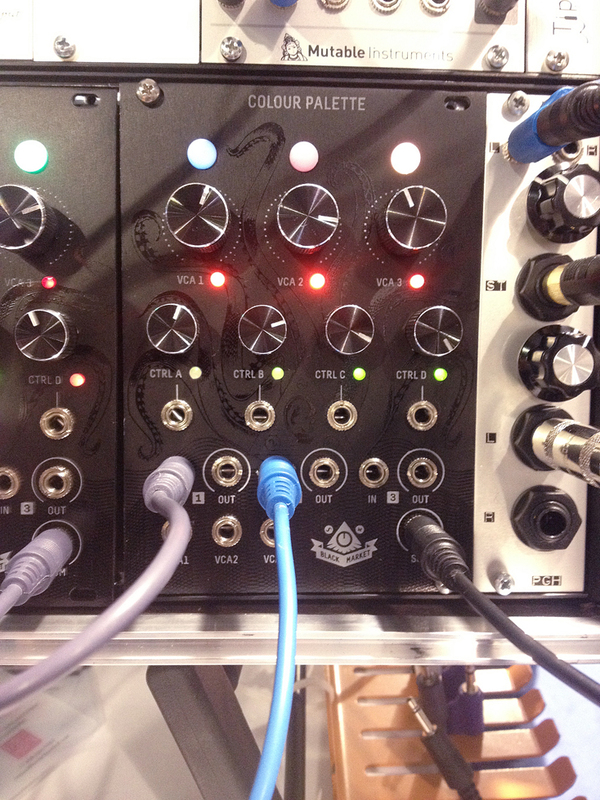 Also the new Pittsburg / Studio Electronics collaboration filter set. 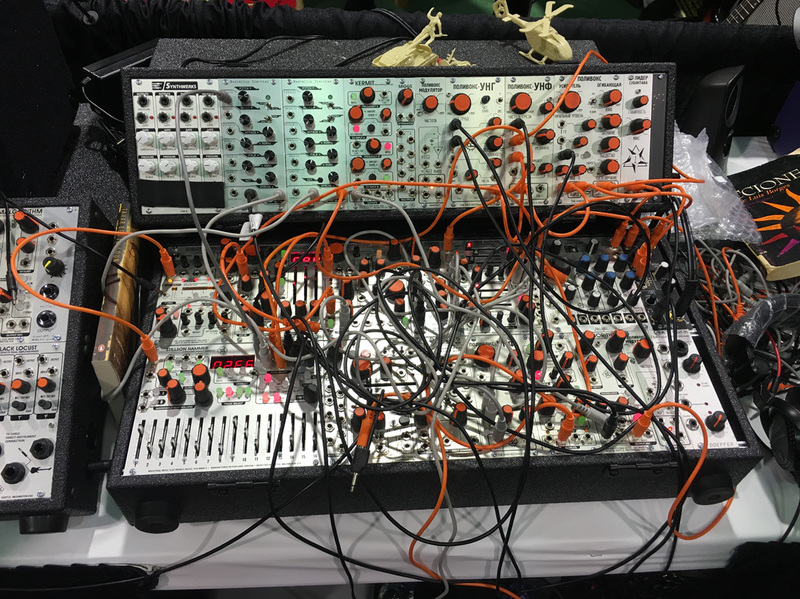 Critter and Guitari eurorack gear. 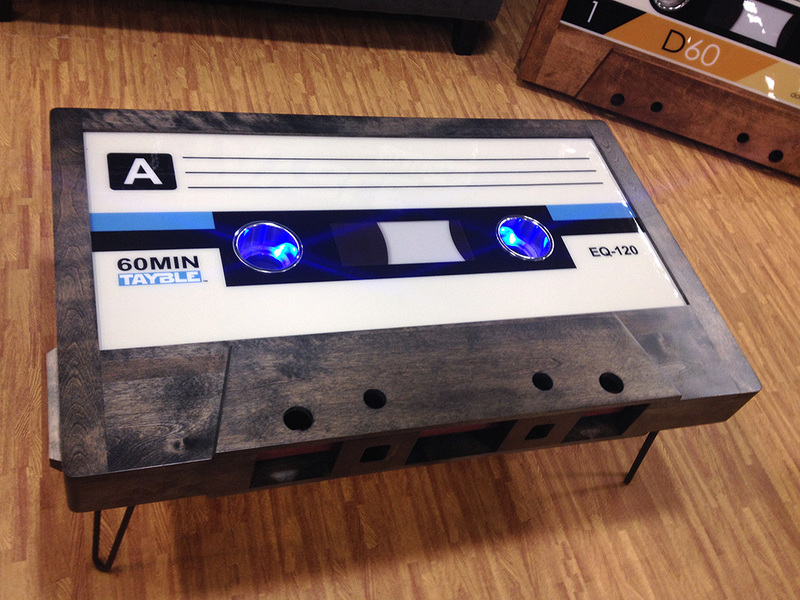 These giant wooden cassette coffee tables from Tayble are lovely. 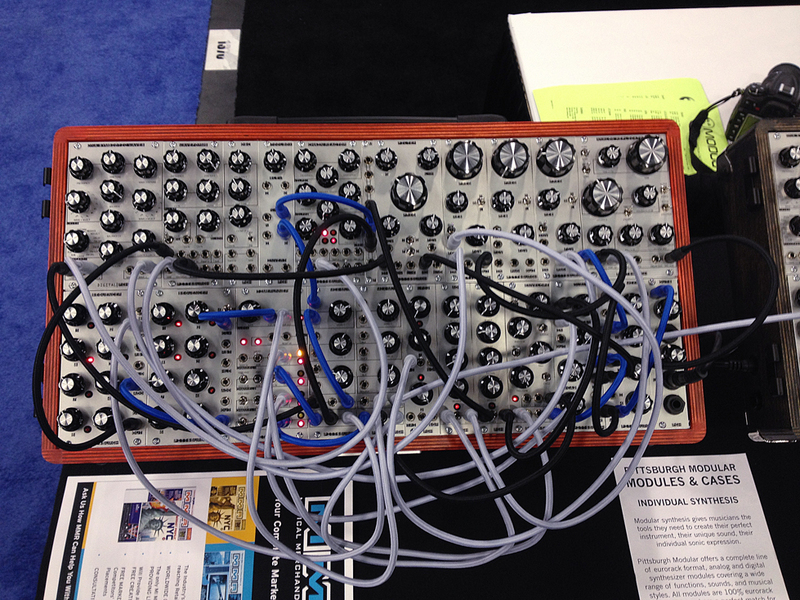 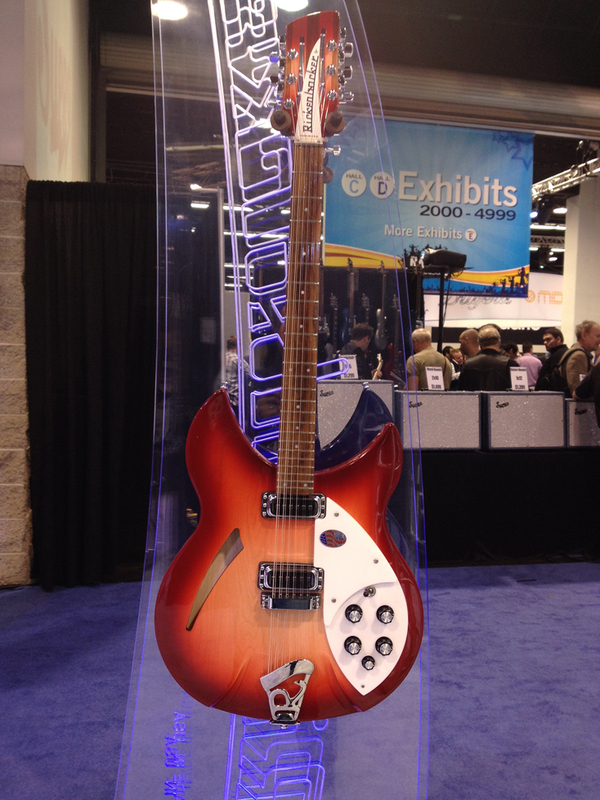 NAMM is exhausting but fun. 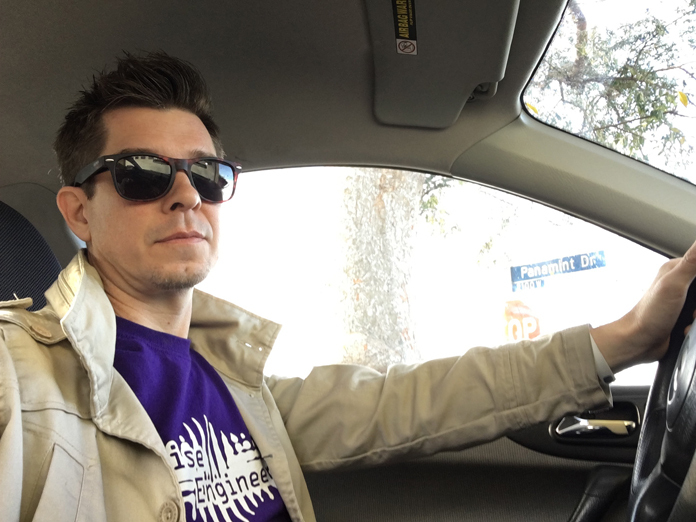 I hope I just saved you $12 in parking and a day of traffic jams, lines, noise and crowds. 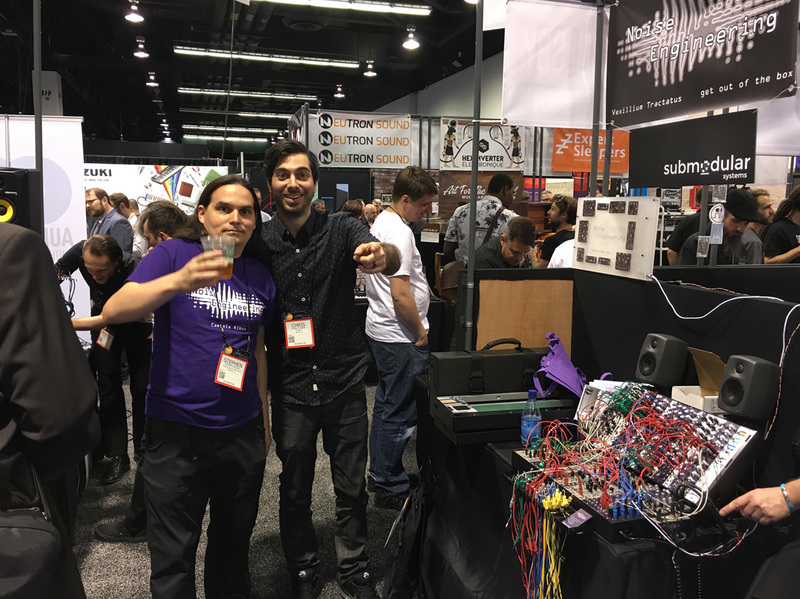 Thank you to Stephen from Noise Engineering and William from WMD for the pass! 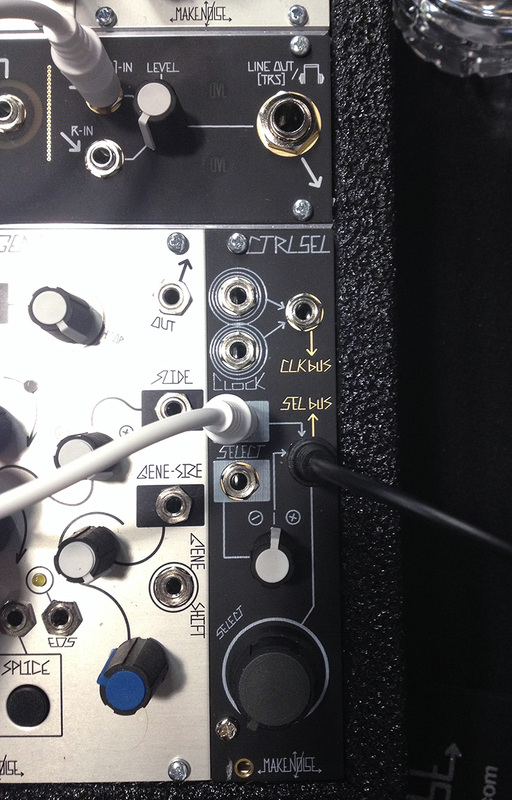 Here are some results of the 24th Slithis session. 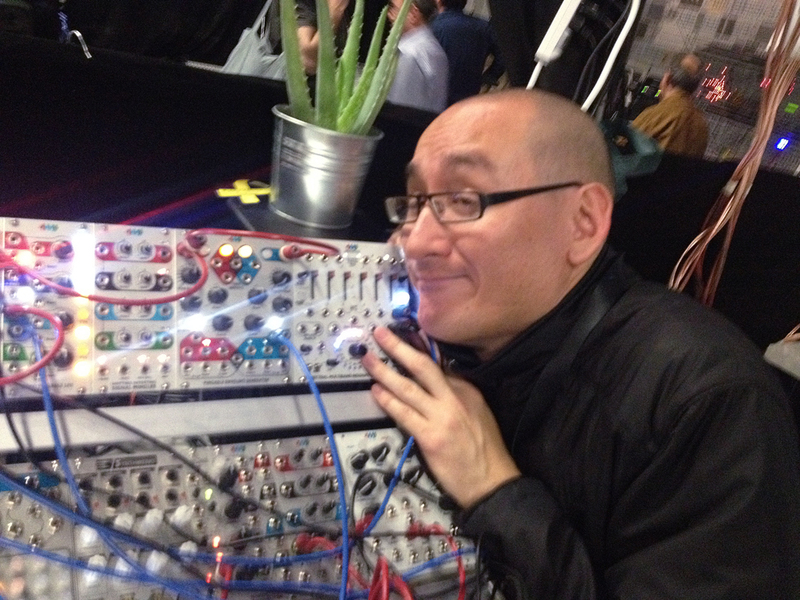 I used just my Roland G-707 and GR-700 brain and a reverb unit. 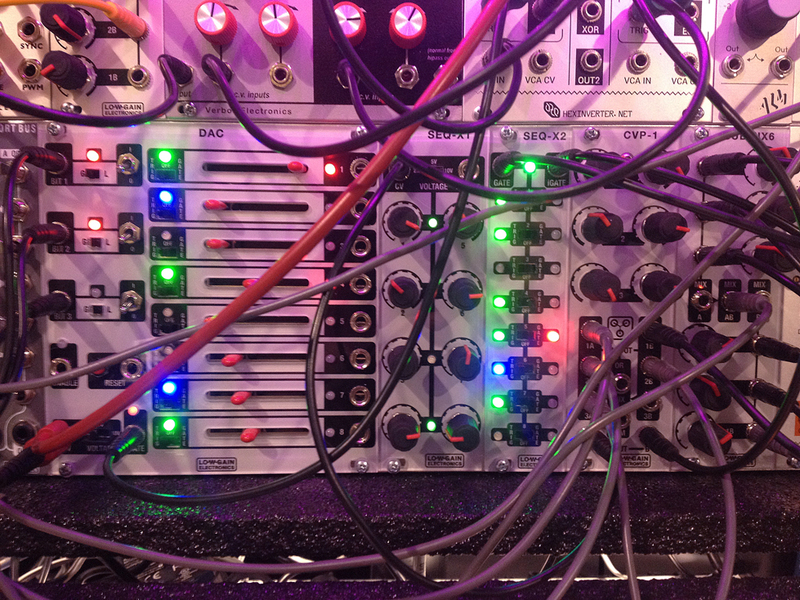 Stexe used his home arsenal with Persephone, Moog Source, Paia modular, home brew instruments and some soft synths.